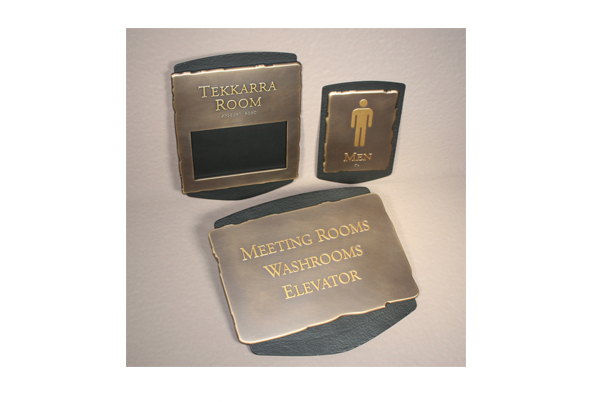 Project Galleries – EEC Industries Ltd.
Sign designs continue to evolve and EEC specializes in producing unique products for every project. 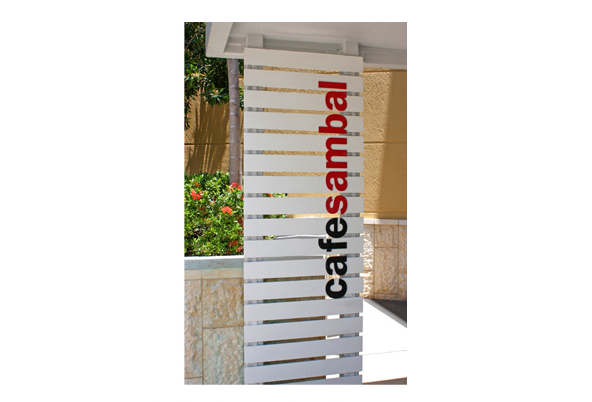 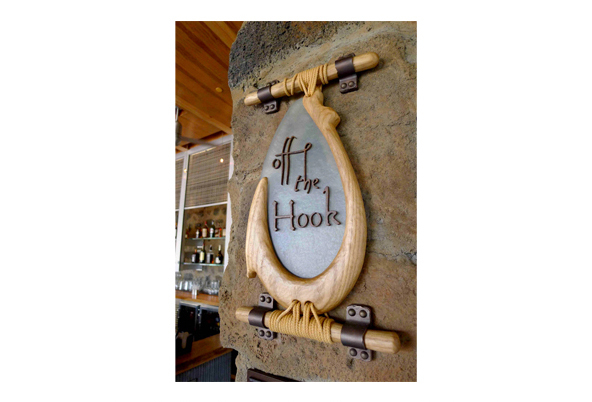 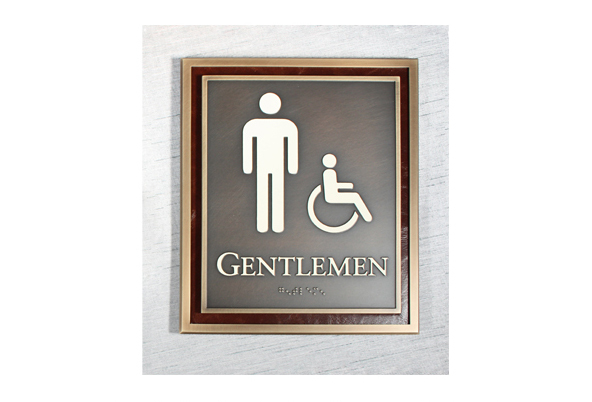 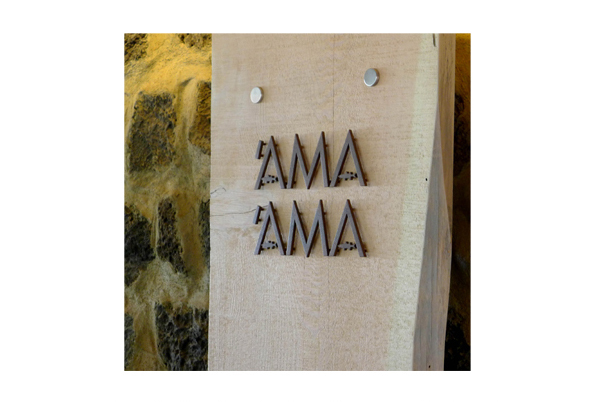 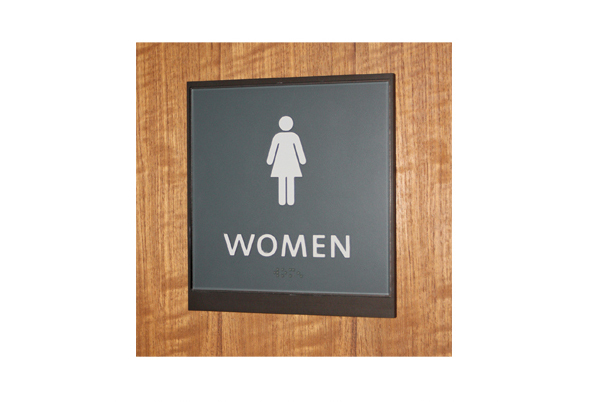 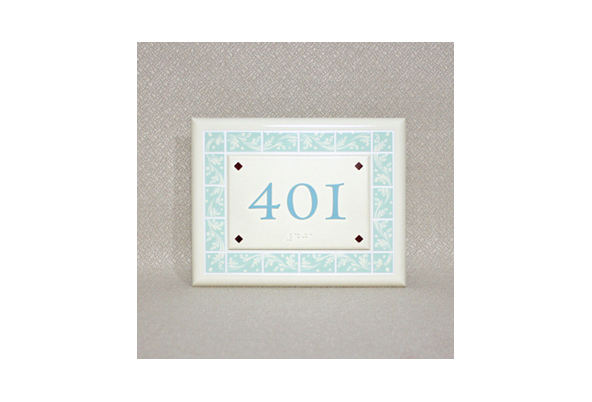 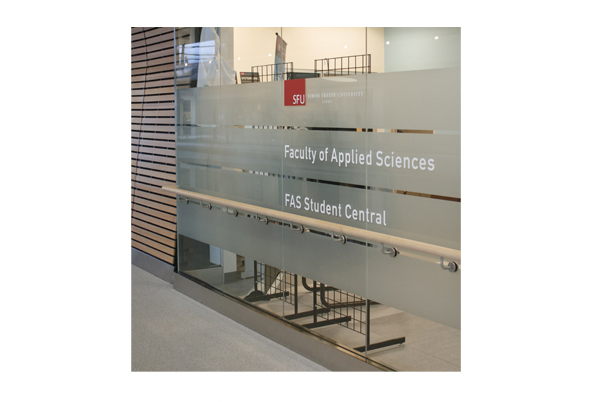 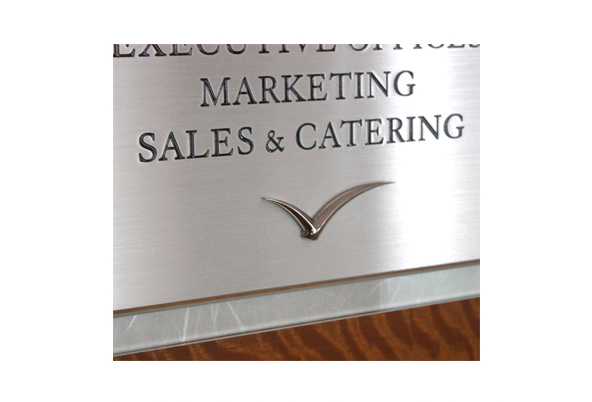 Sign designs are endless with the various materials, finishes and production techniques available. 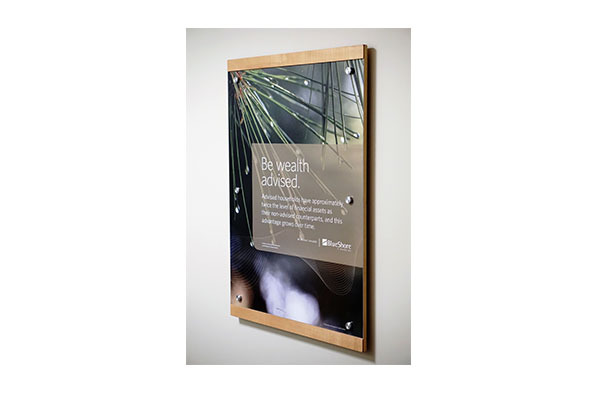 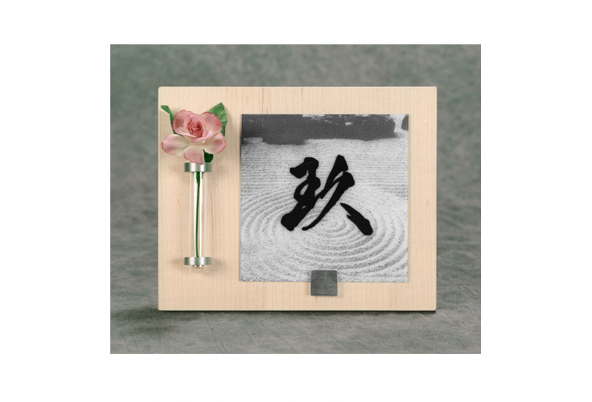 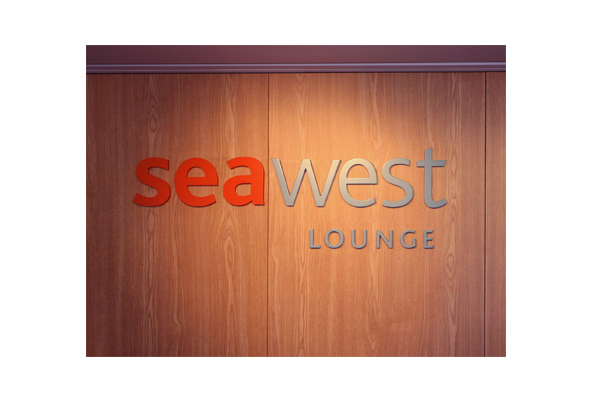 Financial wellness and growth are important aspects of everyone’s life and the notion of this, as well as the contemporary West Coast lifestyle, were inspiration in the design for all interior and exterior signage. 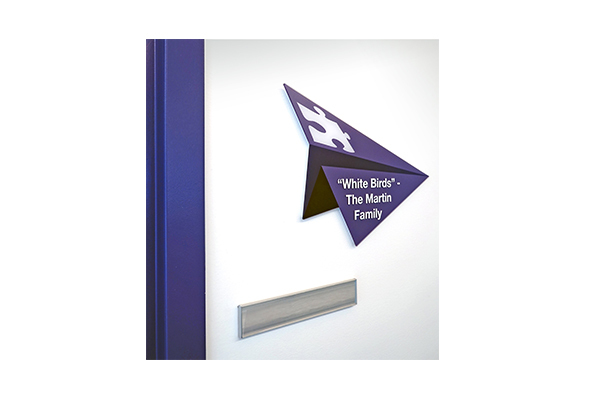 Incorporating company branding, the design was a concentrated effort to leave an inviting and comfortable environment to engage in personal and business transactions. 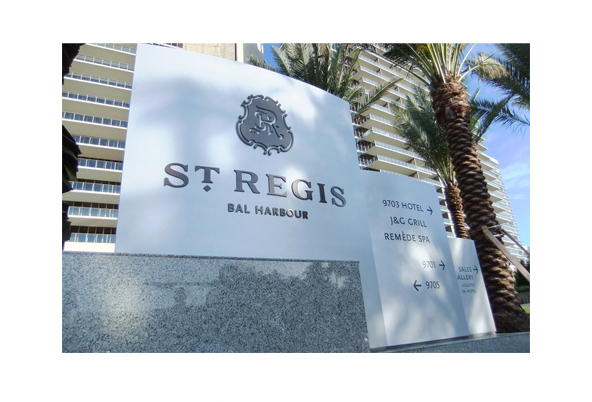 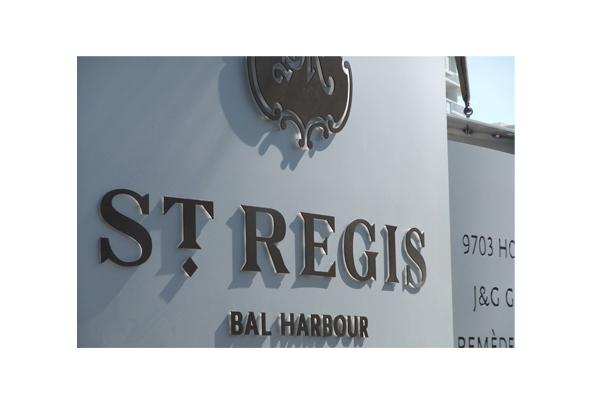 The exceptional view of the Atlantic is the setting for the St. Regis Bal Harbour Resort. 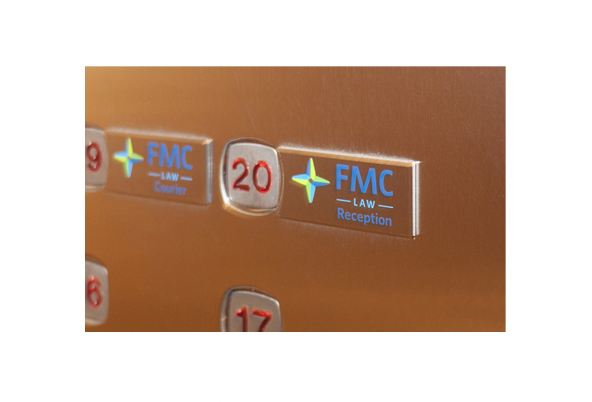 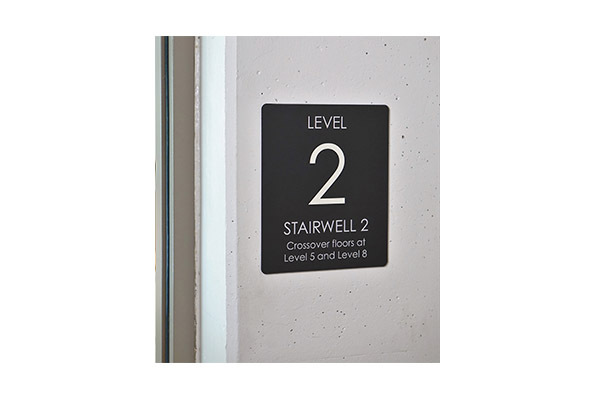 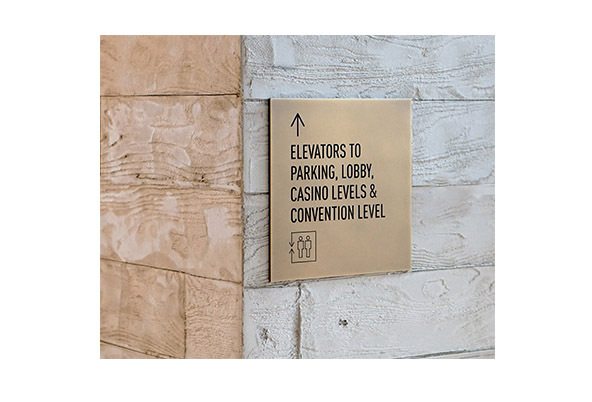 The 3 towers comprise of hotel and residences, with a comprehensive sign program for interior and exterior locations designed and implemented by EEC Industries. 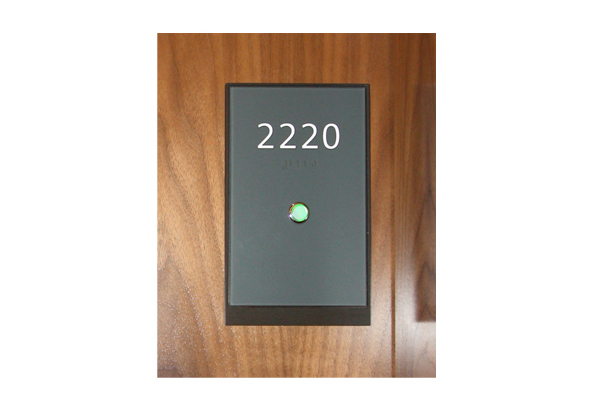 The modern architecture and interiors provided the inspiration for the clean lines and modern finishes used. 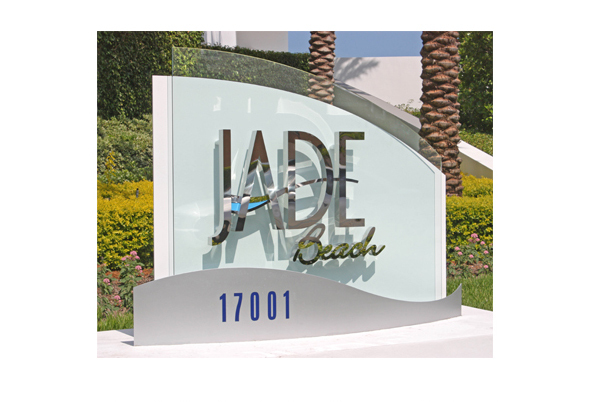 The Jade Beach and Jade Ocean Residences represent the height of luxury living at the oceanfront in Sunny Isles, Florida. 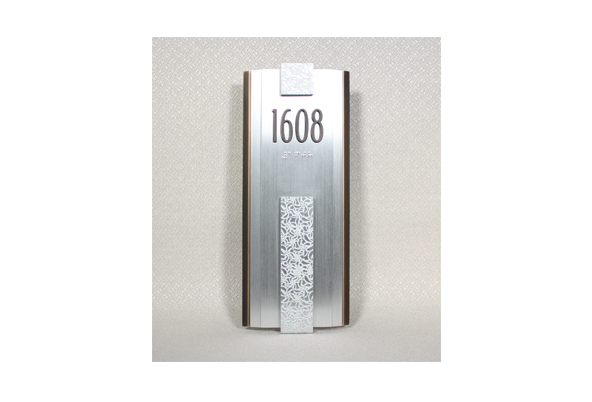 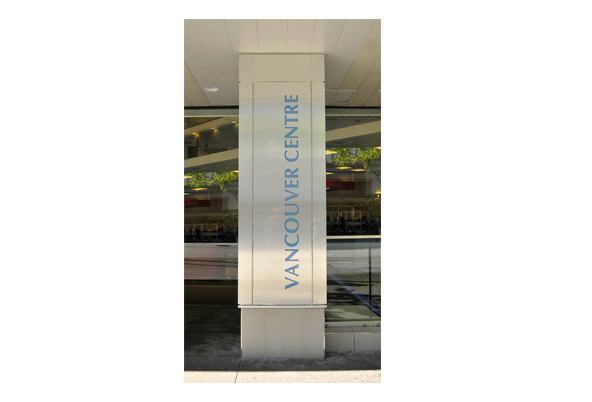 We designed a contemporary signage program for these sleek glass towers. 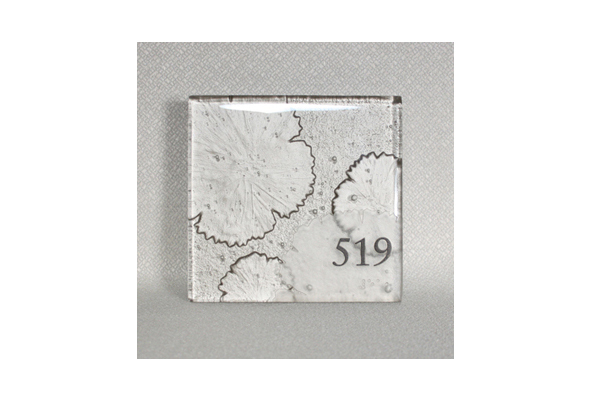 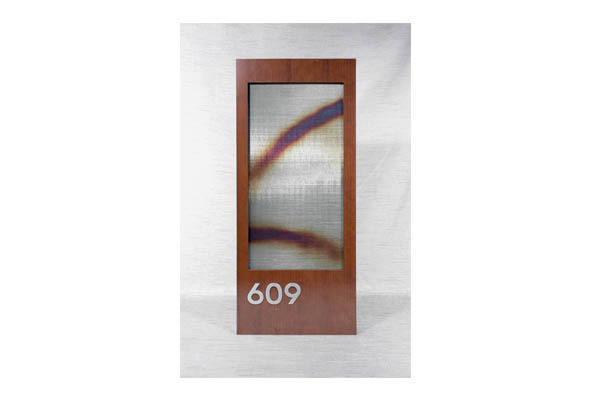 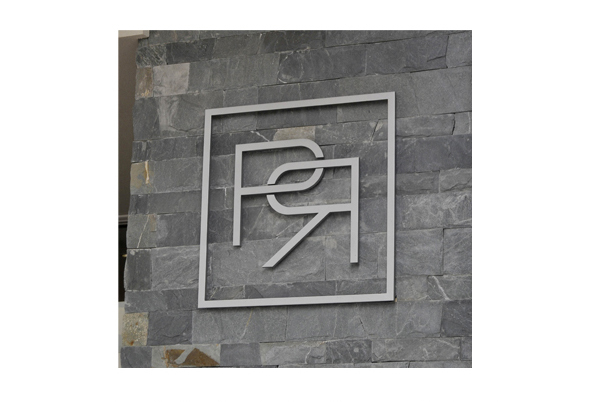 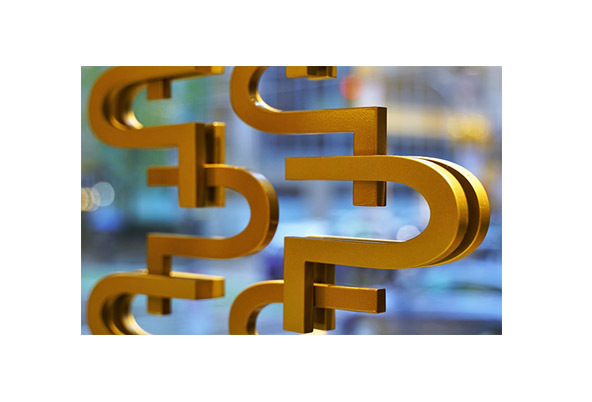 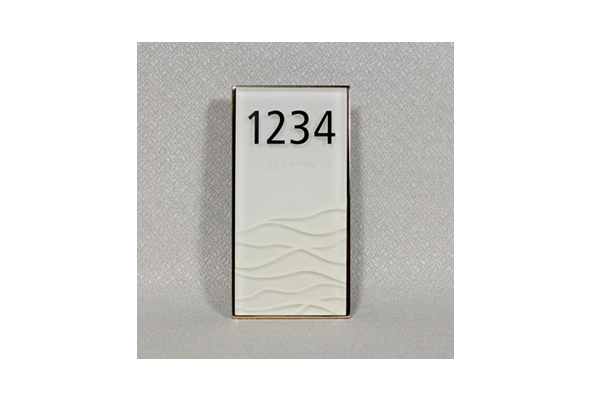 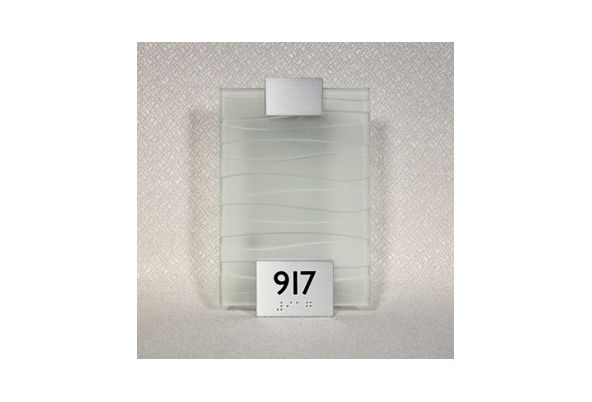 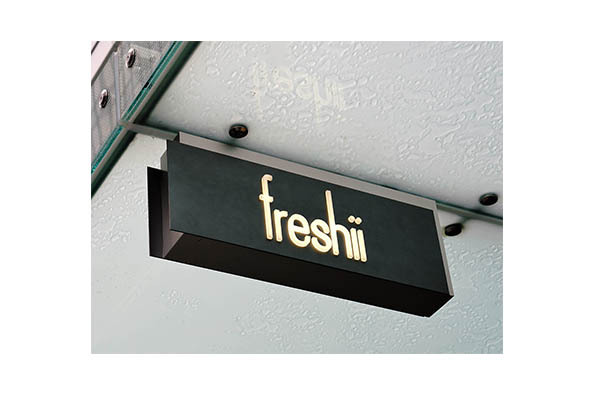 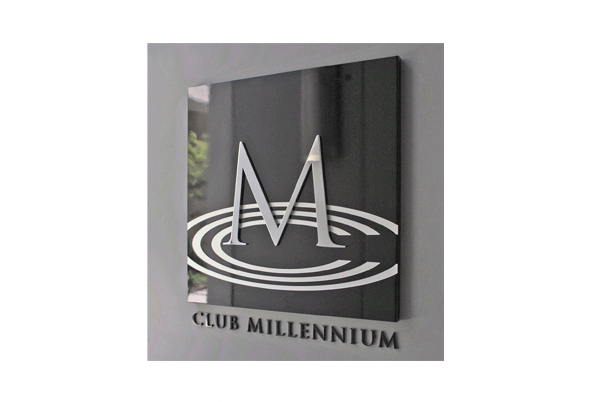 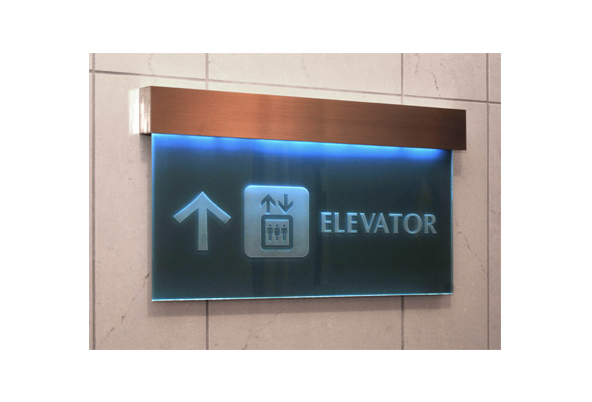 The influence of the glass and steel architecture was brought into the glass sign concepts. 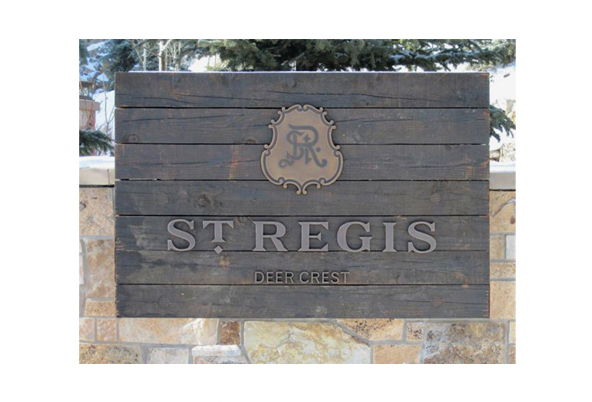 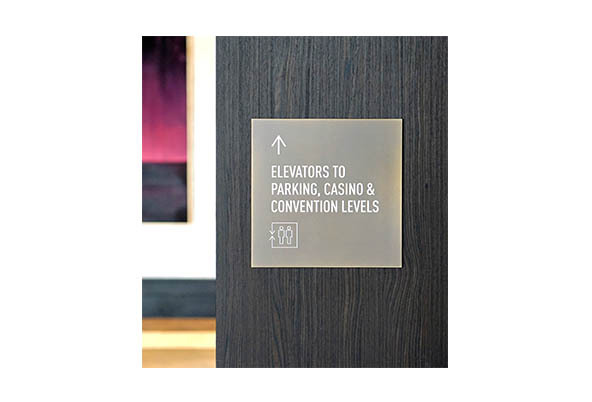 The Starwood Hotels Group was planning a brand new luxury ski resort in beautiful Park City, Utah and turned to EEC from the early planning stages to assist them with the complete signage and wayfinding program. 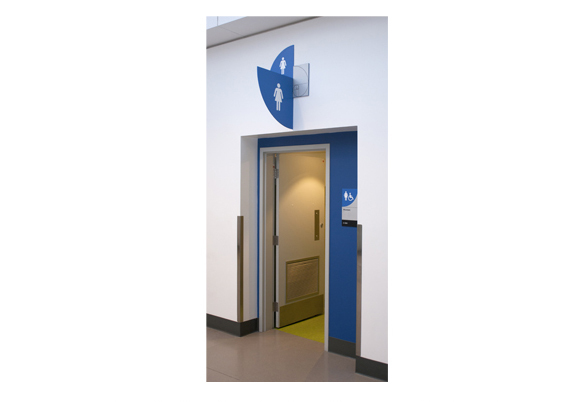 Durabilty and practical design were at the top of mind. 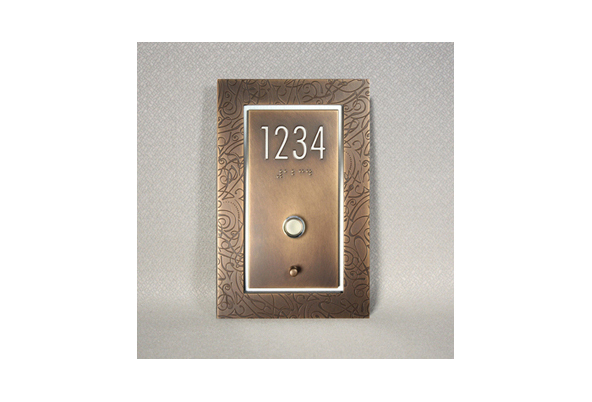 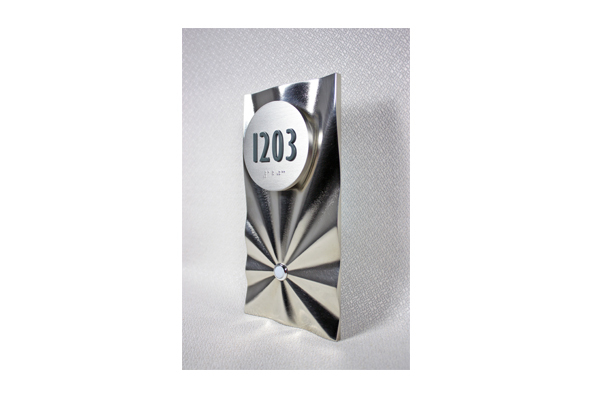 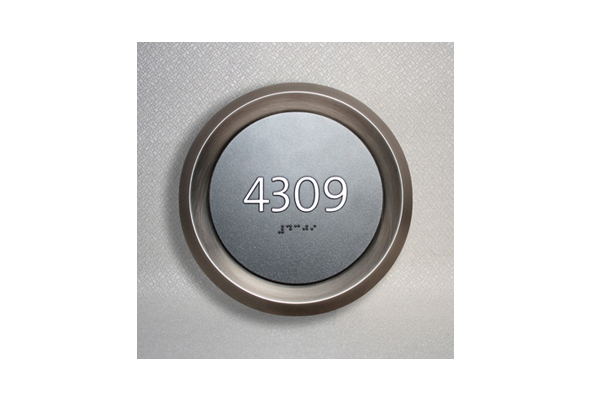 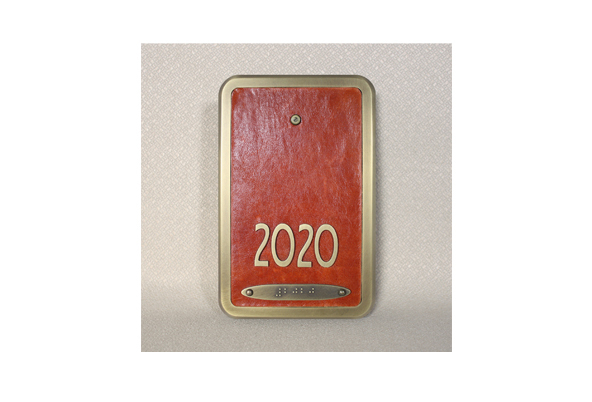 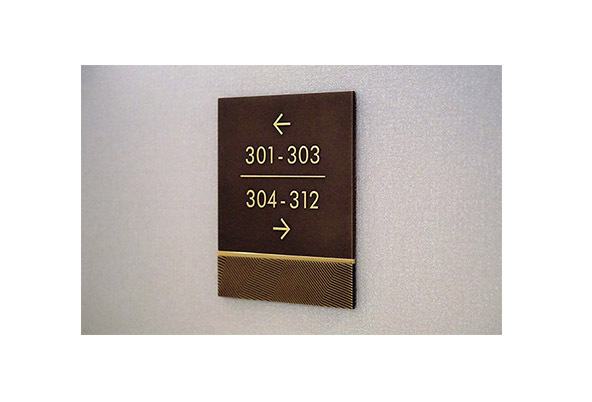 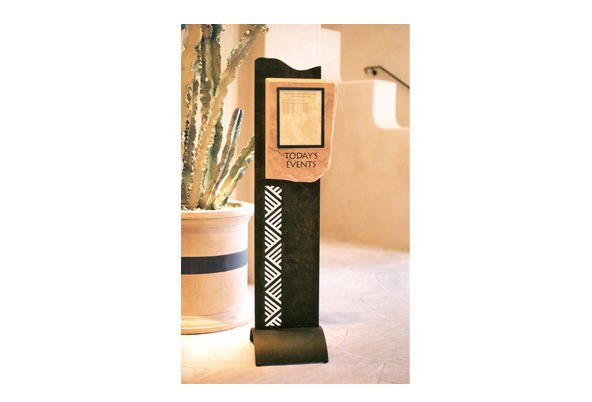 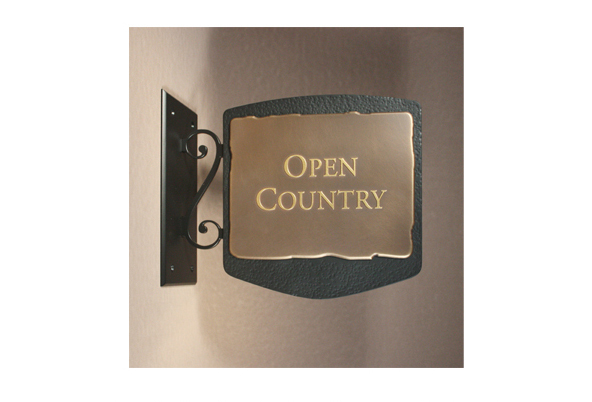 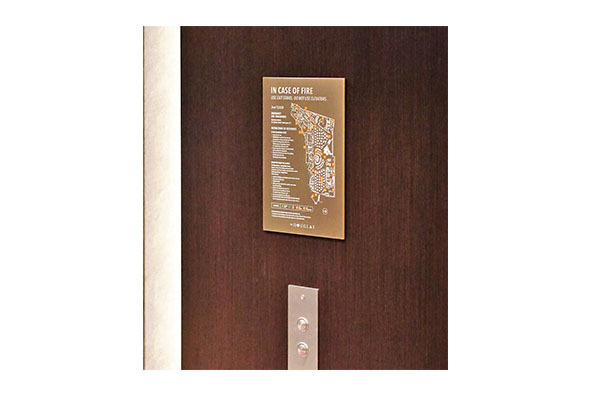 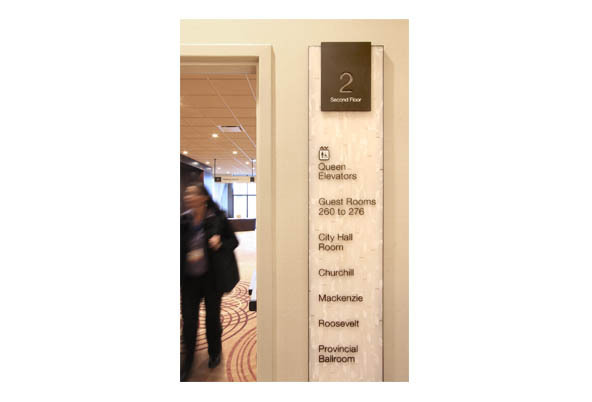 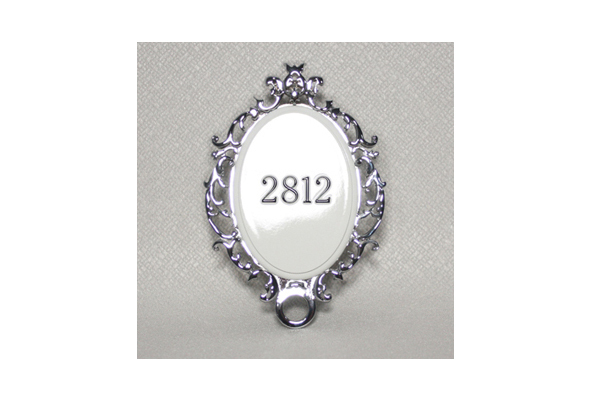 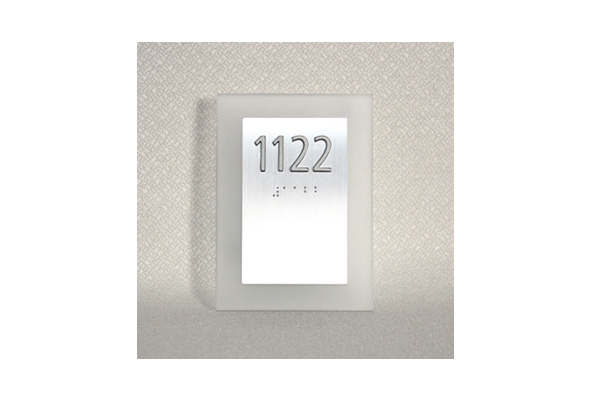 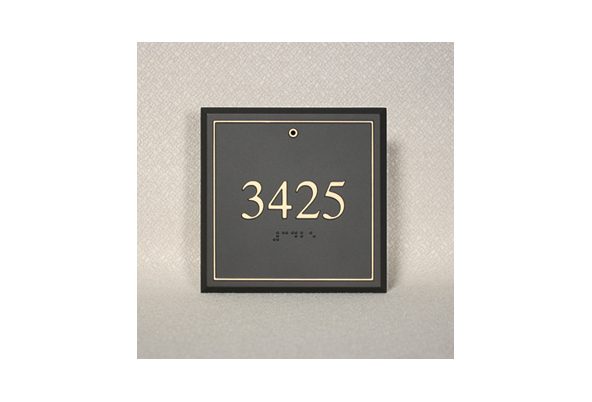 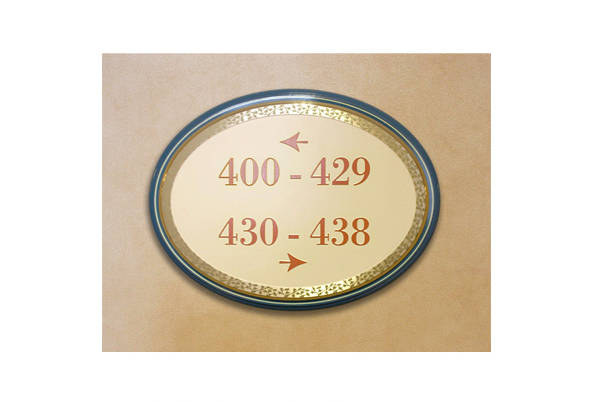 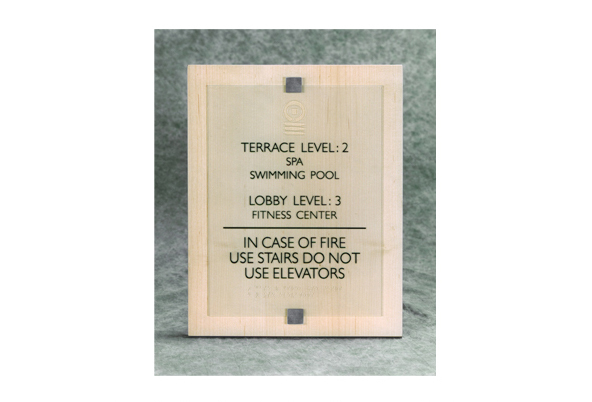 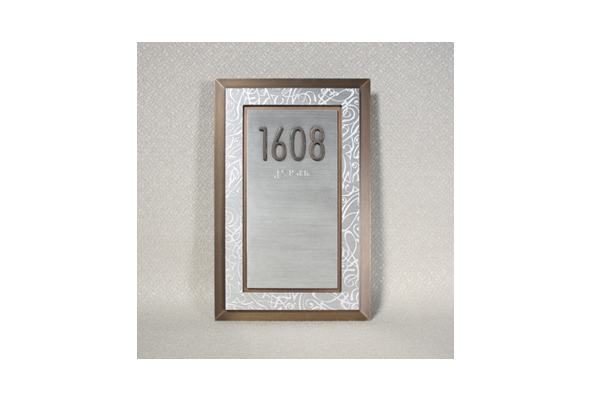 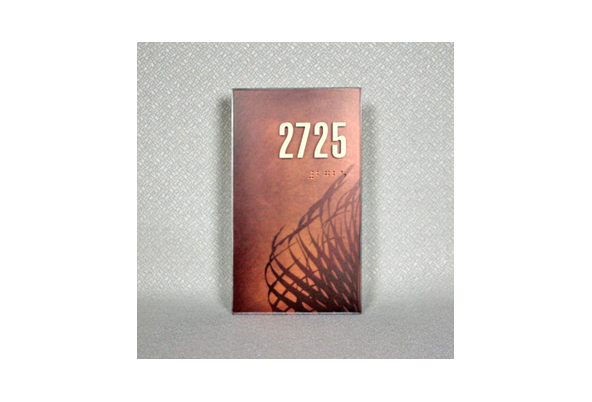 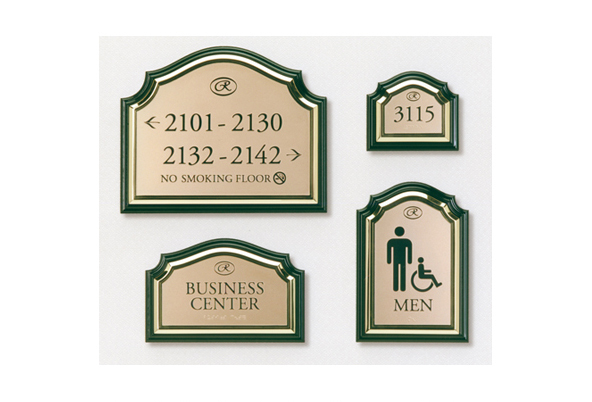 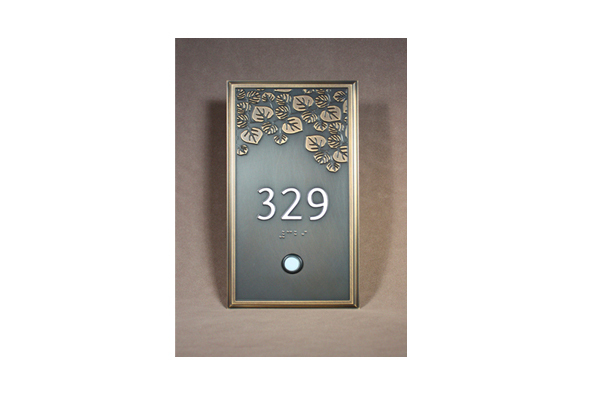 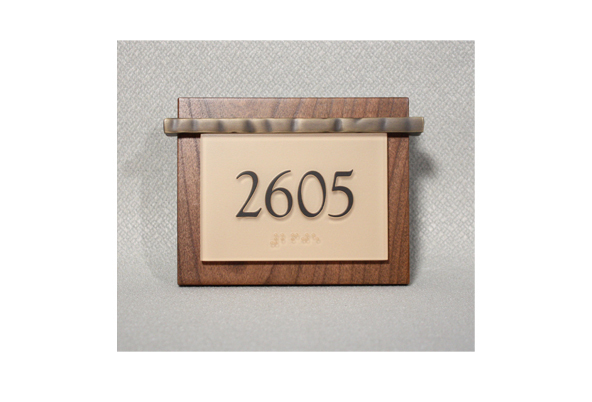 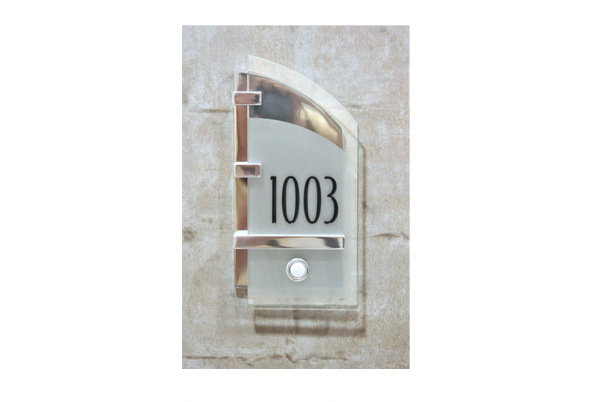 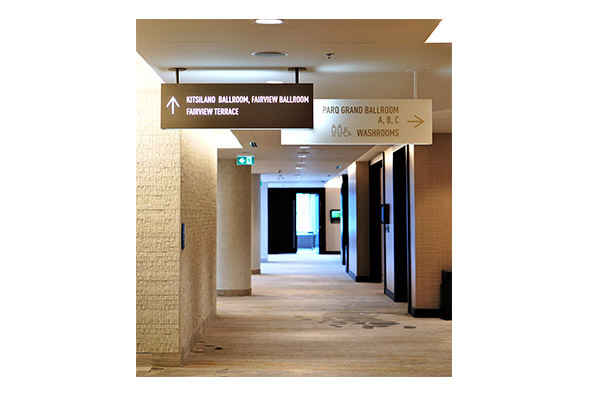 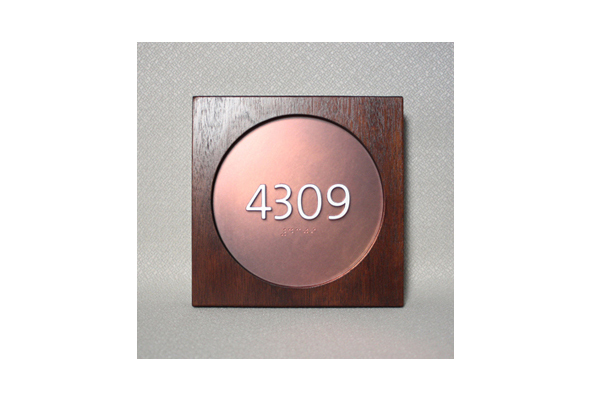 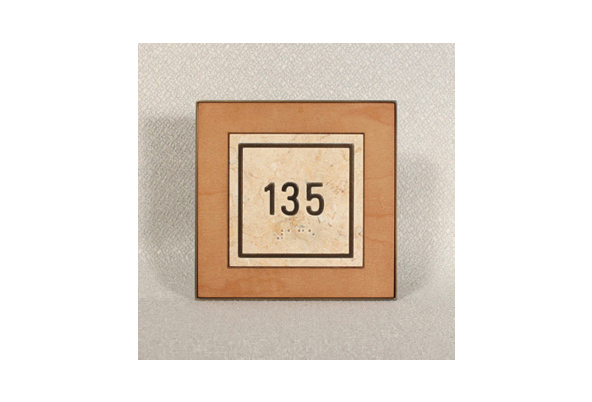 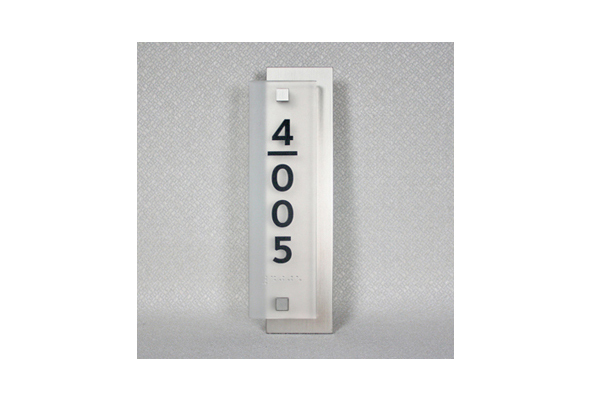 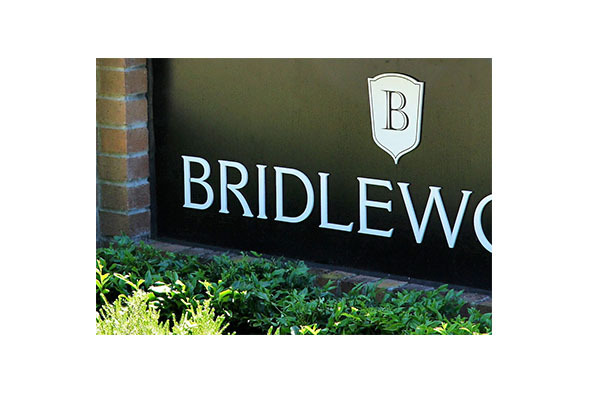 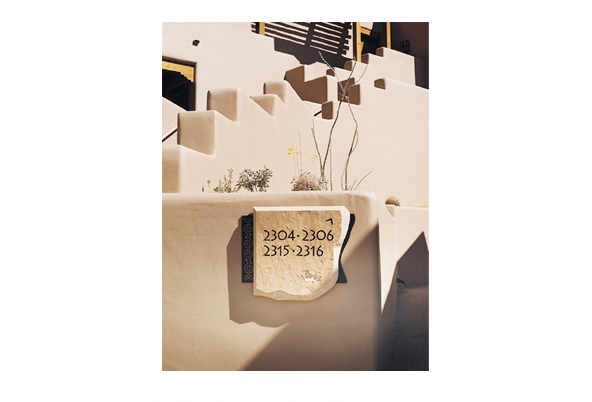 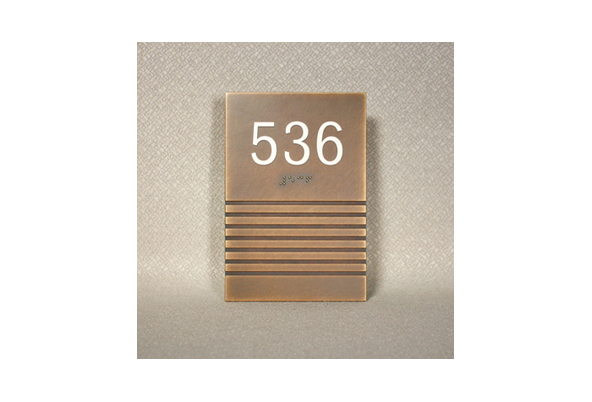 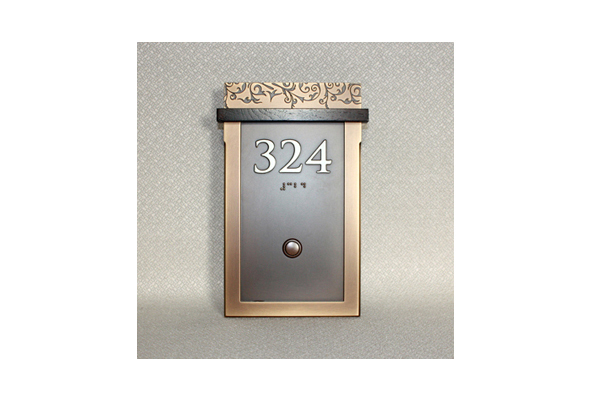 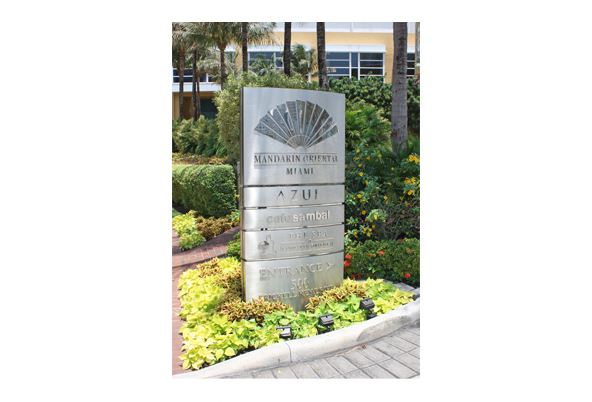 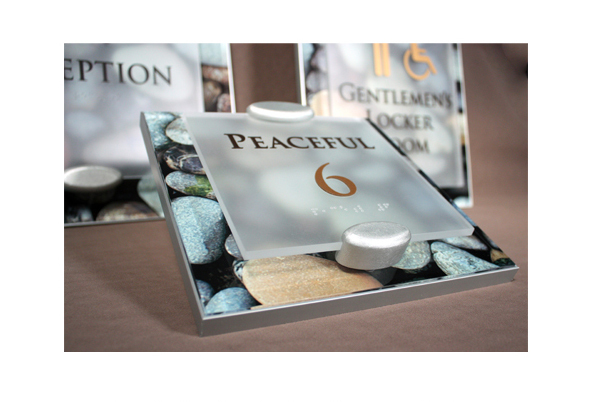 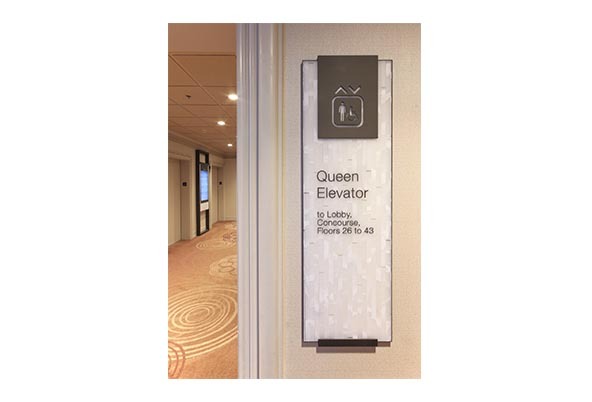 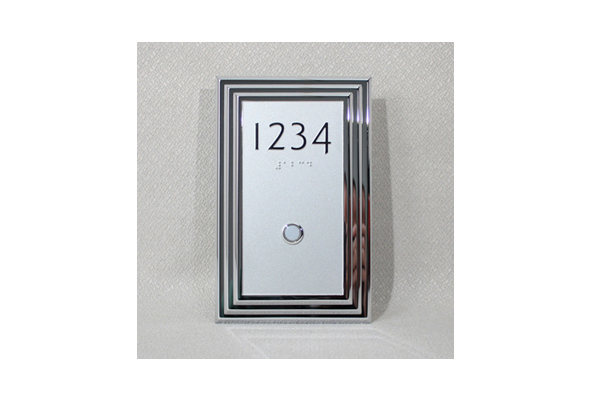 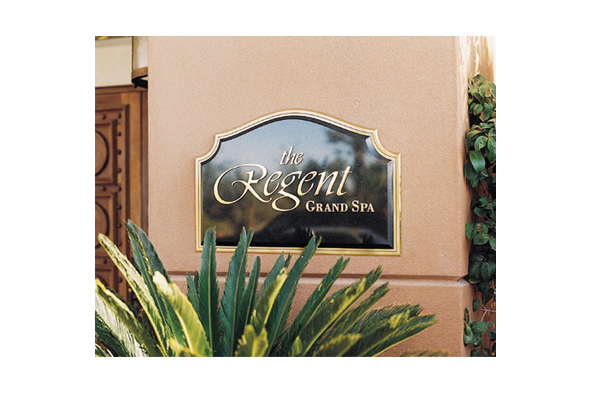 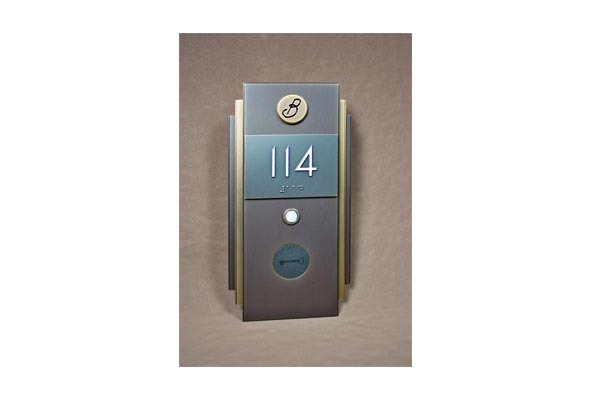 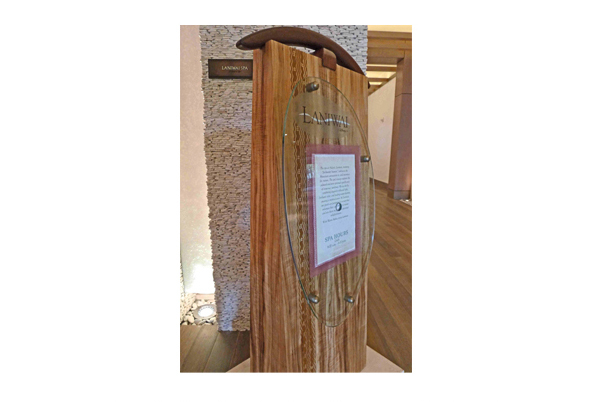 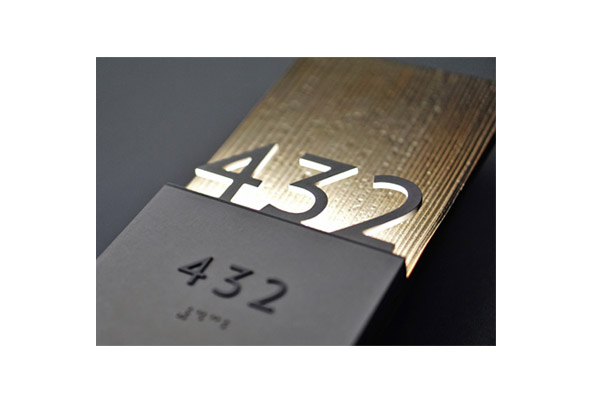 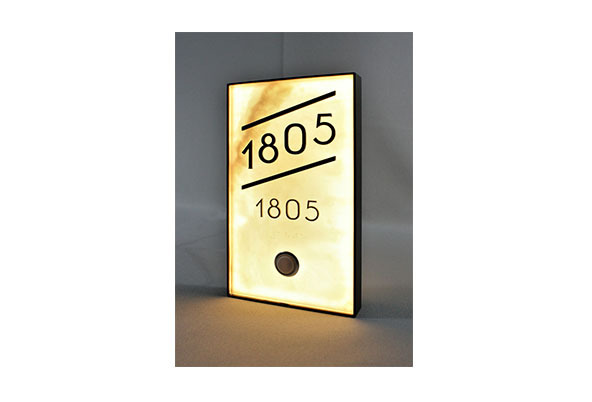 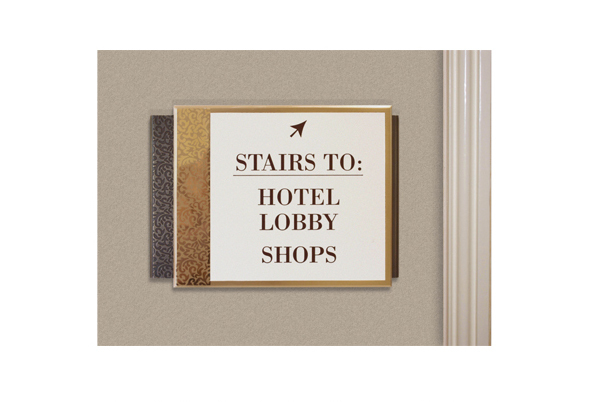 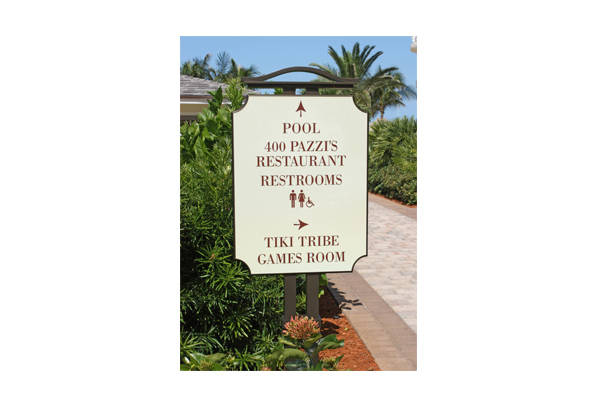 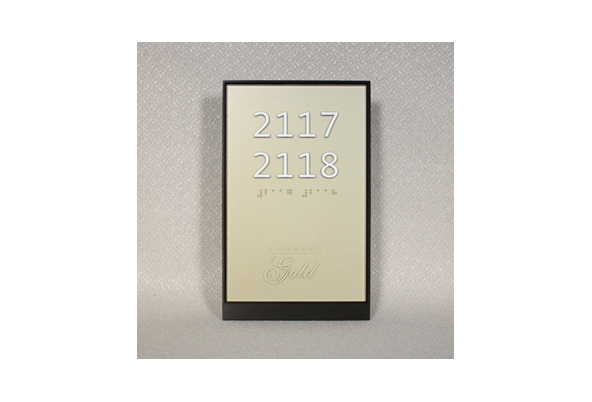 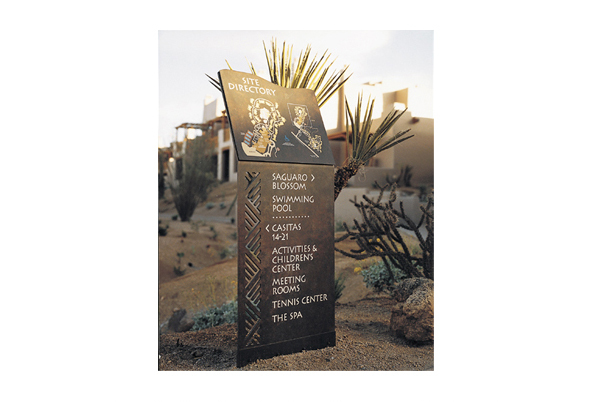 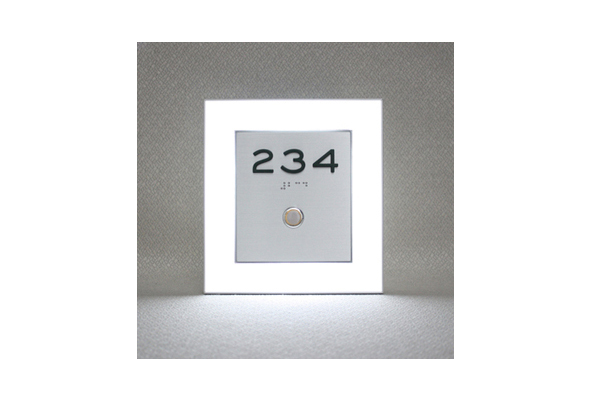 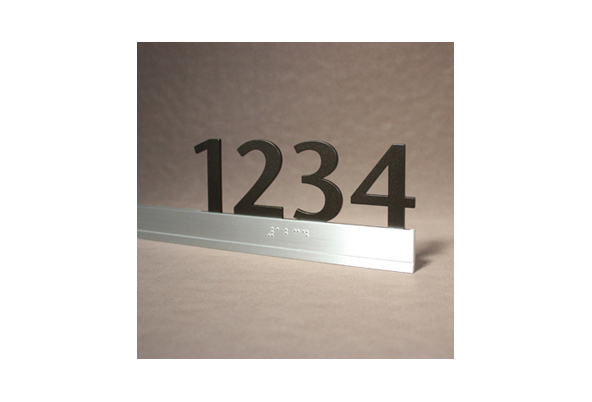 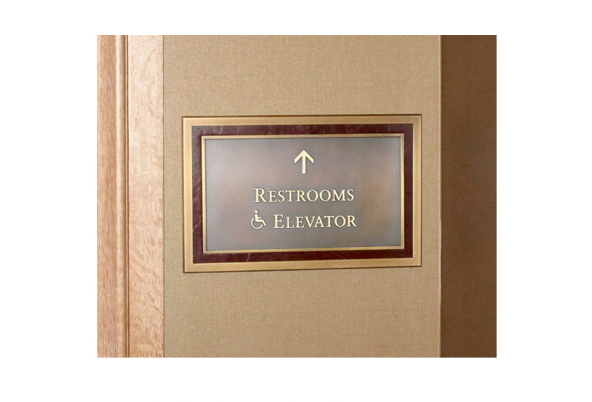 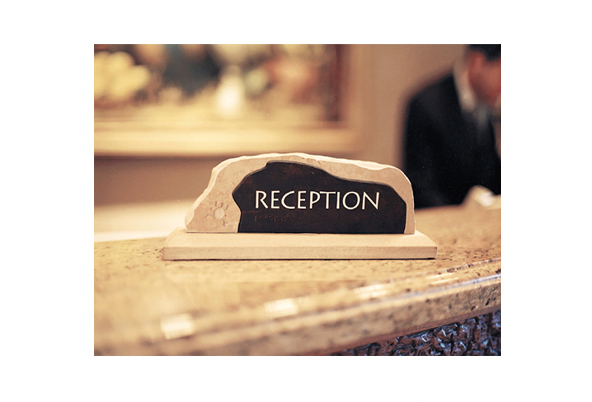 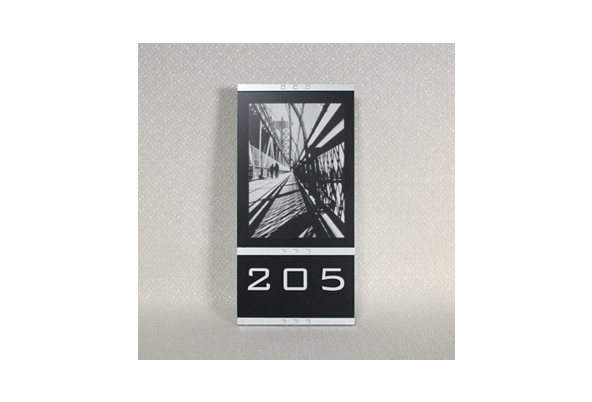 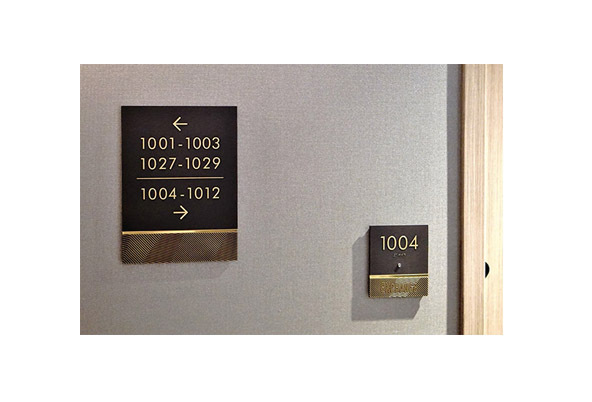 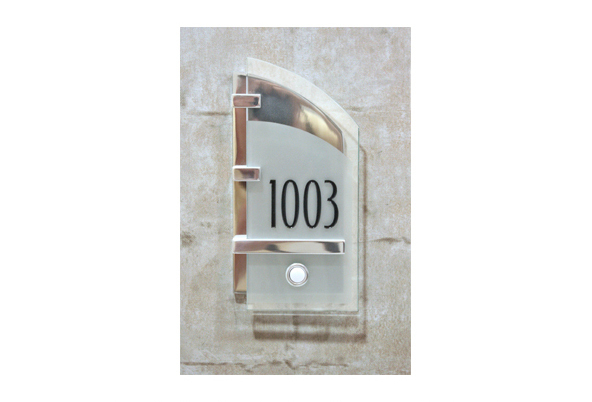 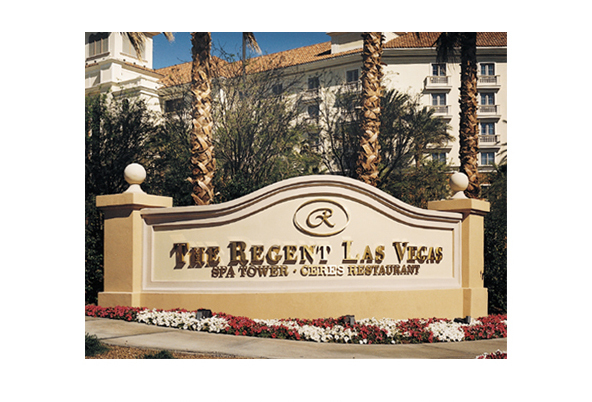 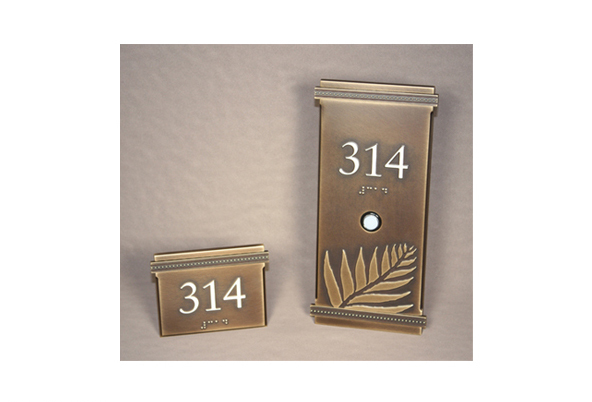 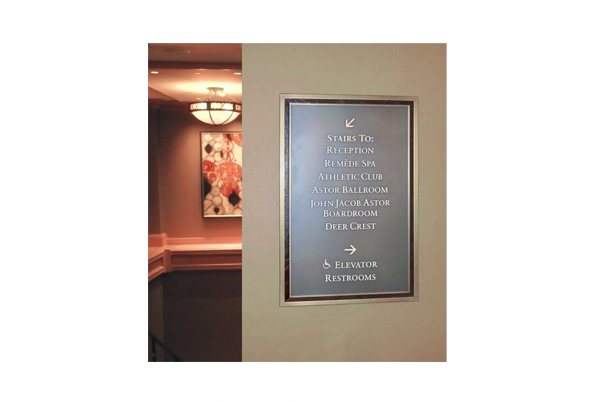 Our hotel signage solution included custom door signs, wayfinding signage, entrance signs and a monument sign. 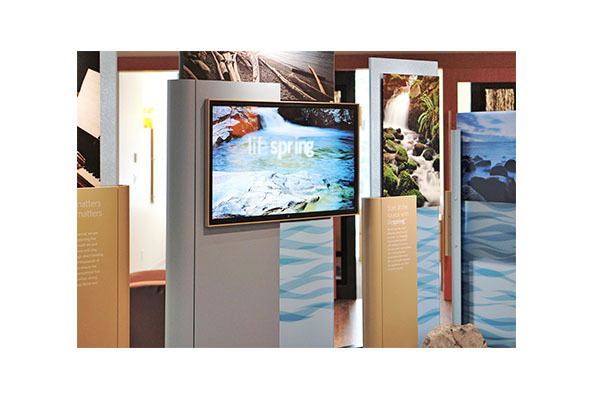 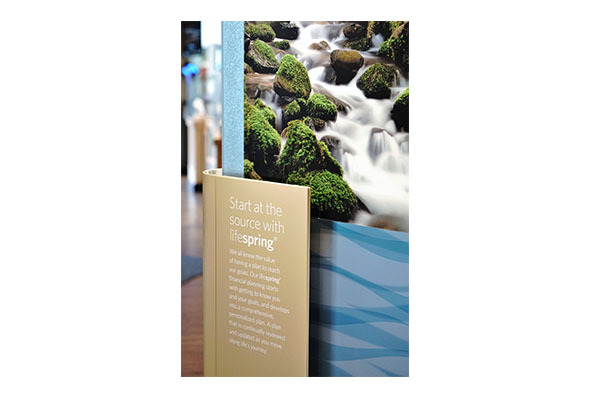 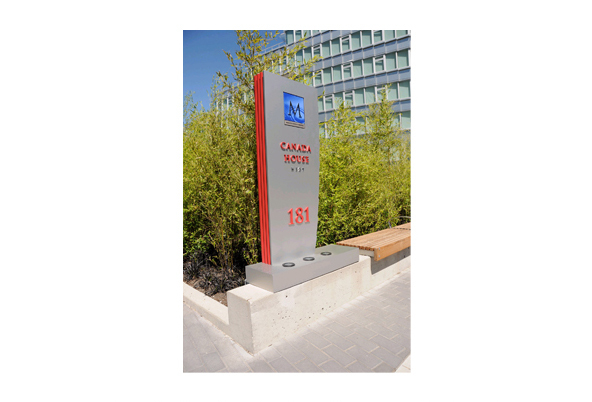 Set in the stunning and majestic landscape of the Canadian Rocky Mountains, the beautiful natural environment was the inspiration for the signage and wayfinding design. 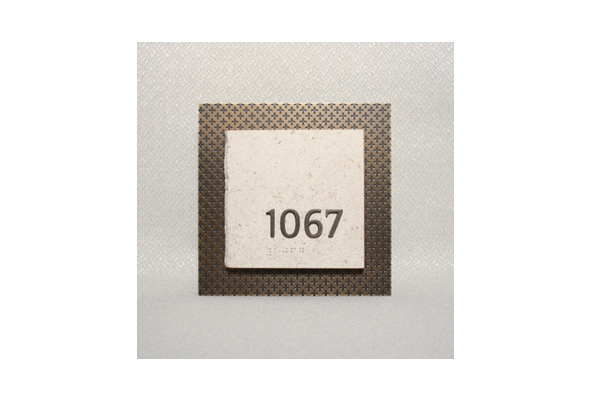 The luxury and longevity of traditional elements such as Bronze are contrasted with the light and natural finishes of glass and stone. 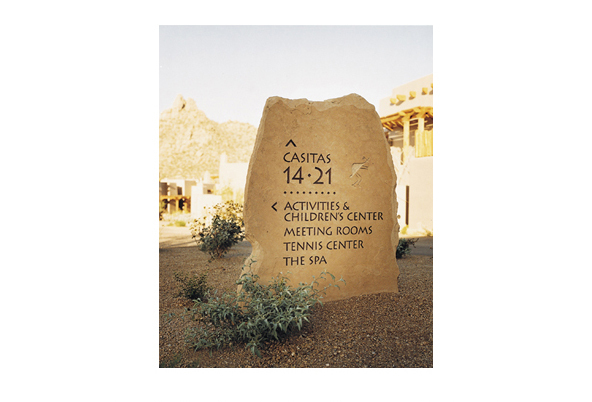 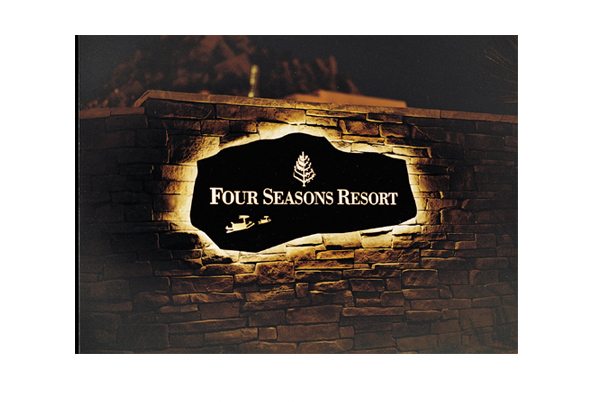 The Four Seasons Resort nestled in the foothills of Pinnacle Peak required a very unique solution in it’s signage design to complement the architecture and environment. 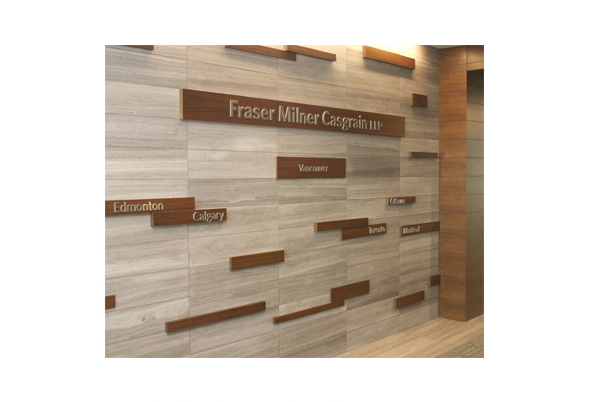 Local stone was sourced and patina finishes on metal were created for a design that is beautiful as well as practical in it’s durability. 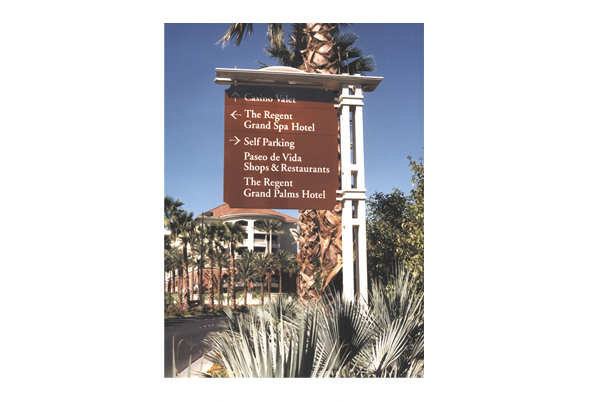 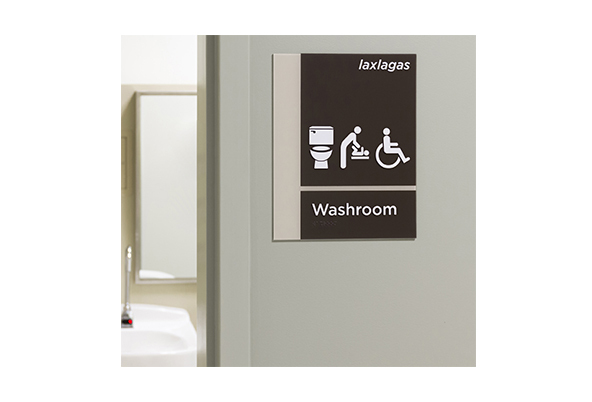 Constructed in the stunning desert landscape of Las Vegas, Nevada, the extreme heat and sun were a special consideration for the exterior sign materials. 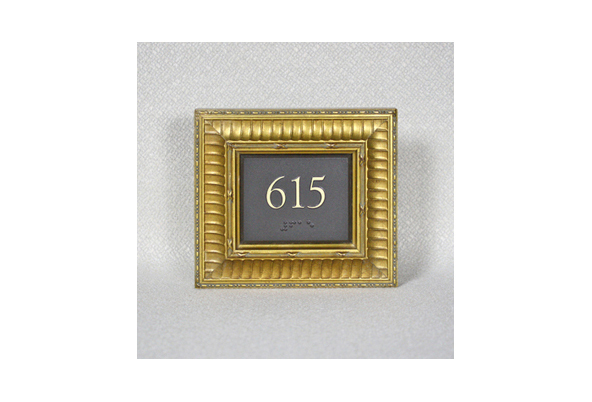 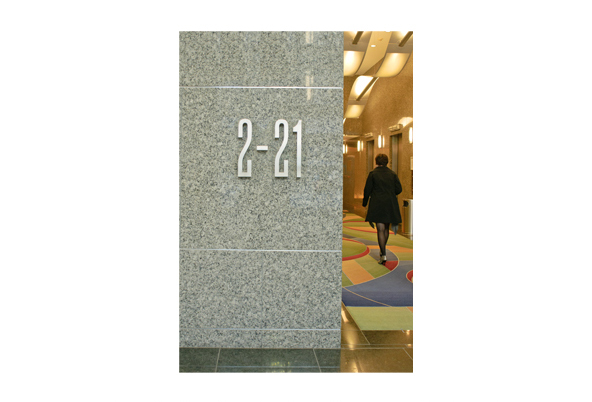 This foresight garnered inspiration for the interior materials as well in selecting black granite and polished brass. 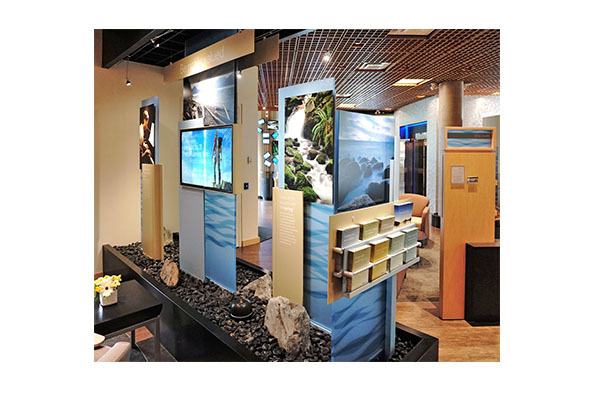 In addition, both interior and exterior design concepts complement the natural surroundings. 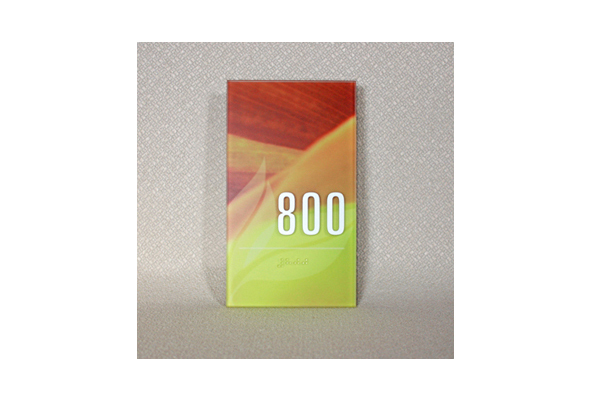 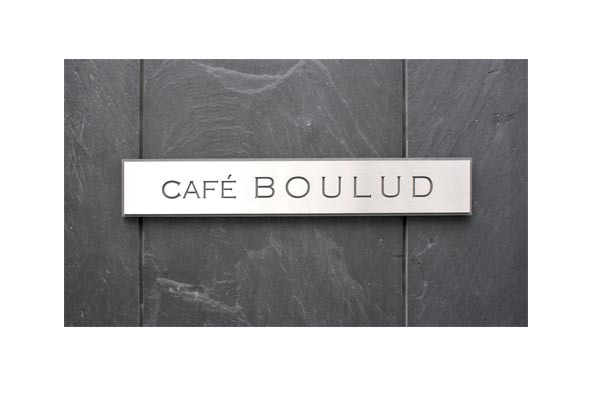 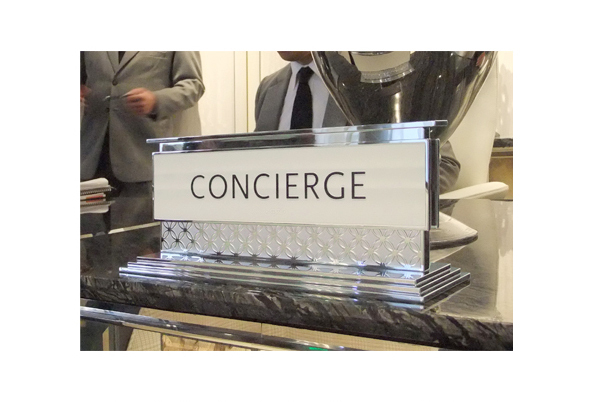 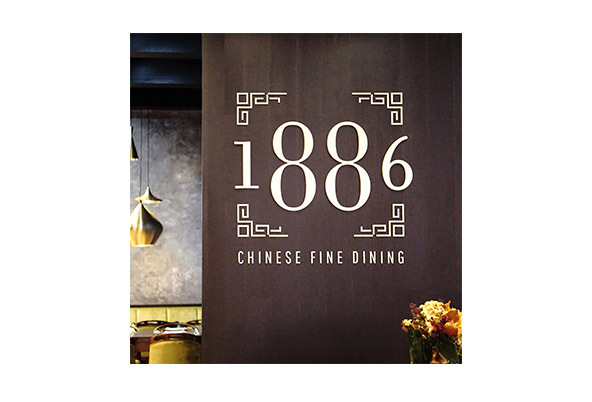 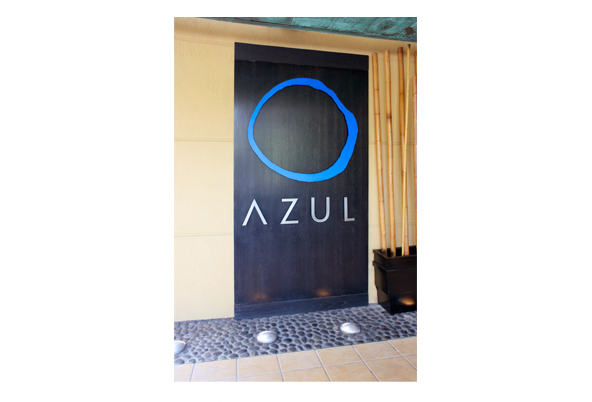 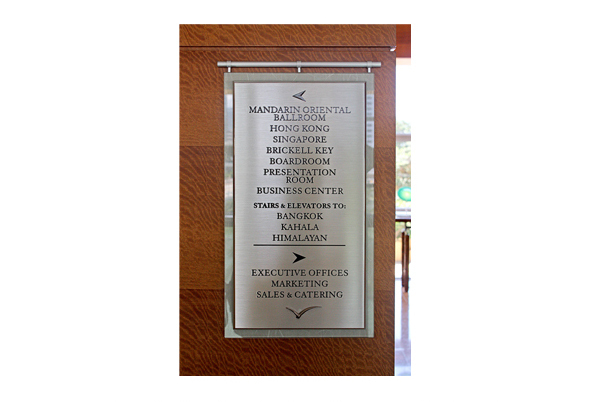 We have produced signage for some of the most prestigious hospitality brands internationally. 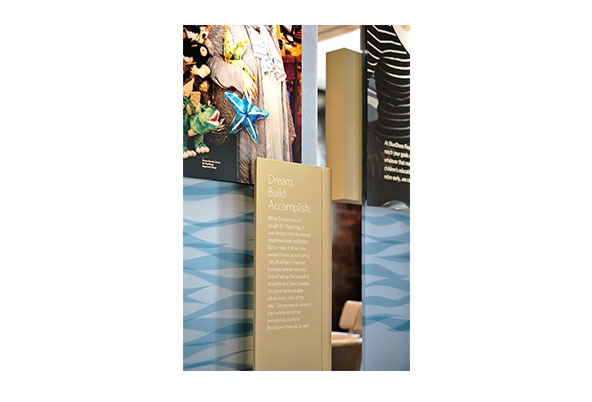 This gallery is a glimpse into some of our work. 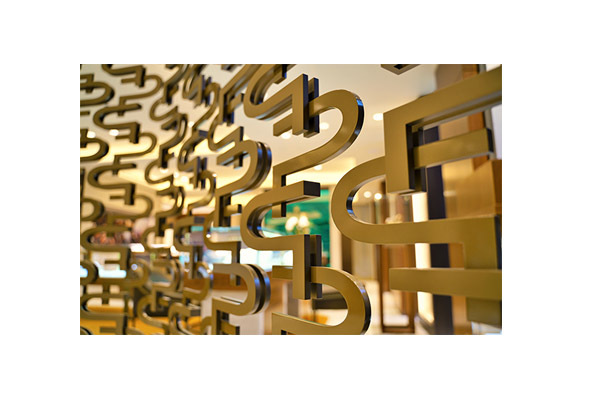 The new EXchange Hotel is built from the foundation of the Old Stock EXchange Building which first opened its doors in 1929. 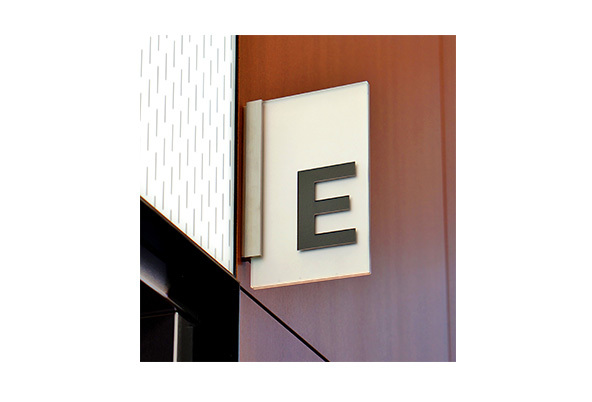 By using modern techniques, EEC has designed and fabricated a sign system that portrays the buildings new modern beginning, while also incorporating the elegance of its history. 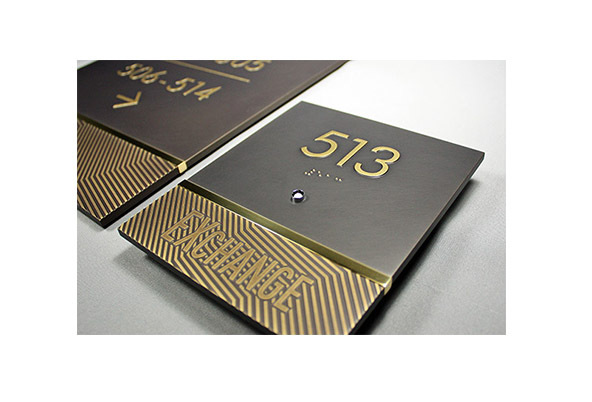 Using oxidized brass with a warm metal overlay, the architectural expression of the new EXchange Hotel won’t go unnoticed. 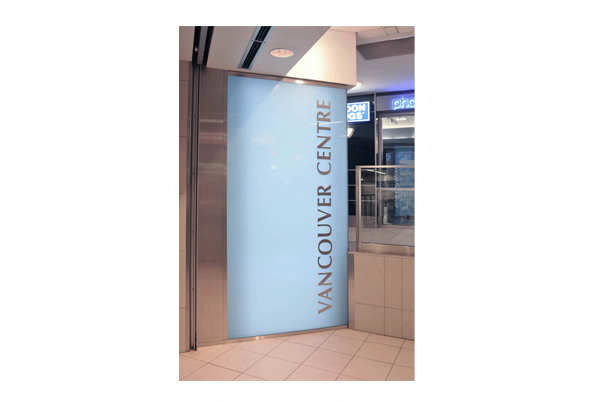 EEC designed, fabricated and installed all aspects of this vibrant entertainment sector of downtown Vancouver, BC. 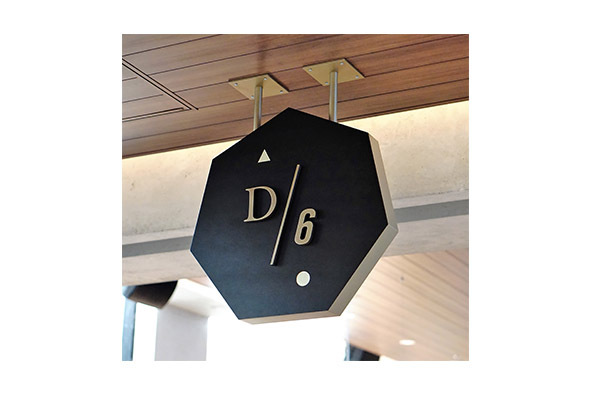 A casino, flanked by two luxury hotels in a JW Marriott and The Douglas, EEC designed wayfinding and directional signs, illuminated retail identification, and suite numbers correlating directly to the overall contemporary architectural feeling of the building. 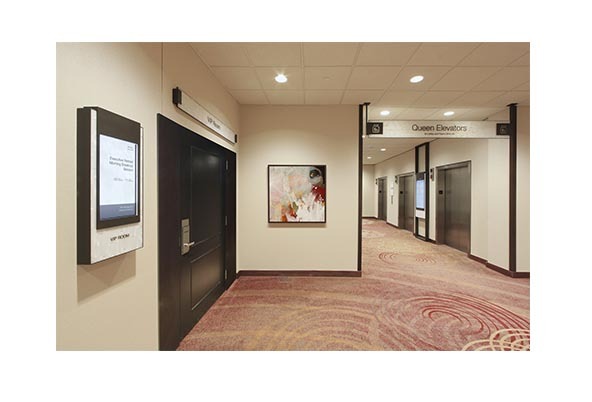 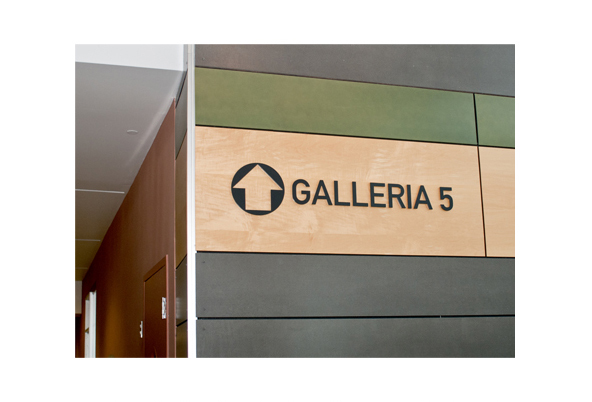 Working closely with Forge Media, EEC produced and installed the conference center’s new wayfinding sign system. 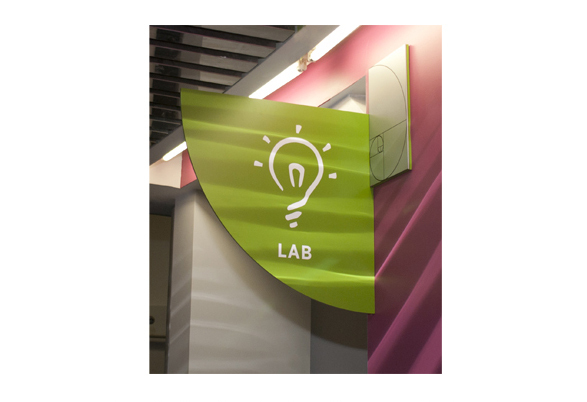 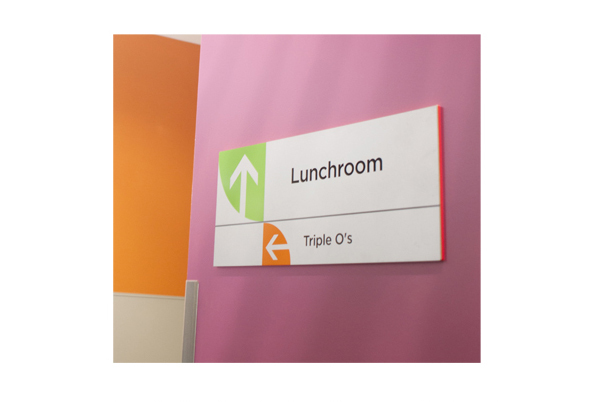 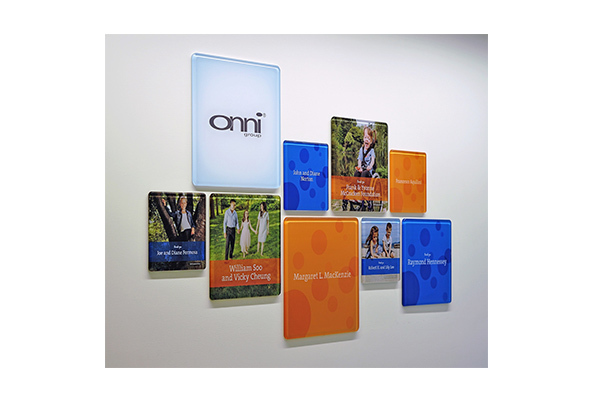 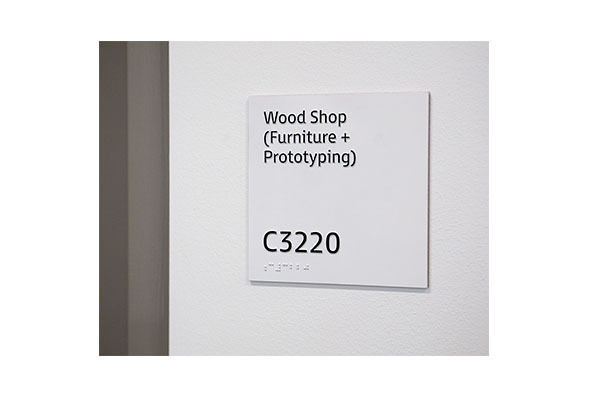 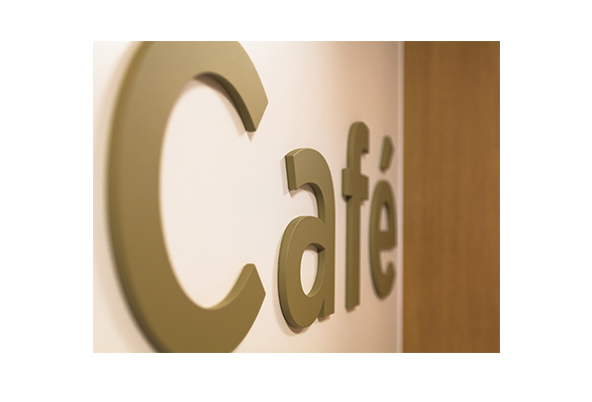 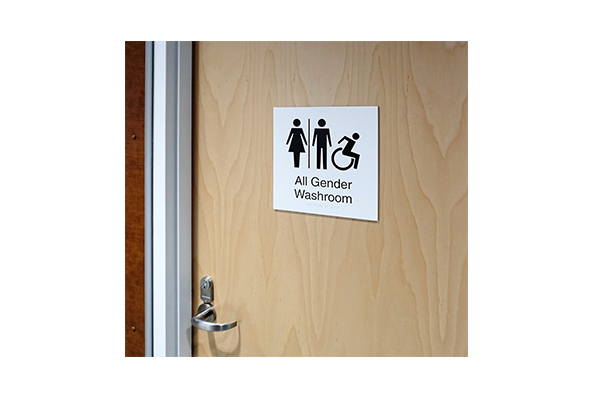 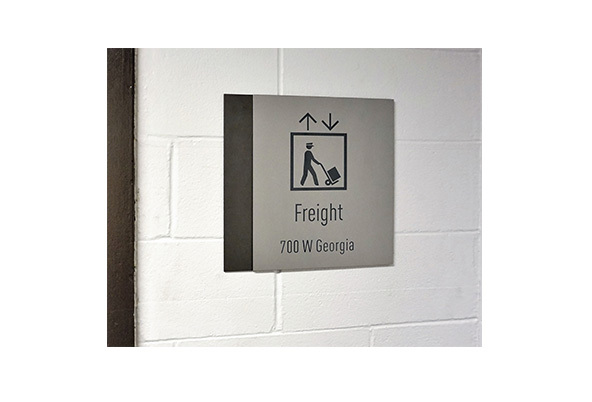 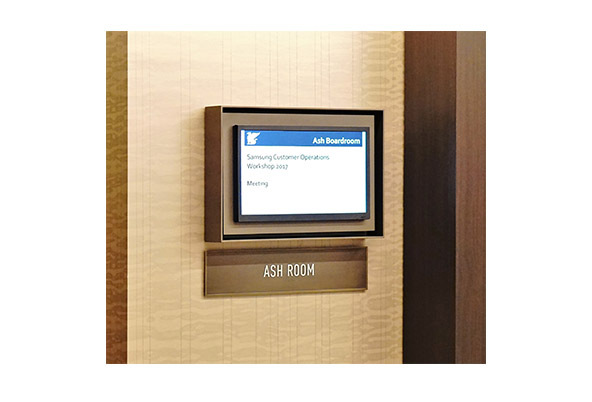 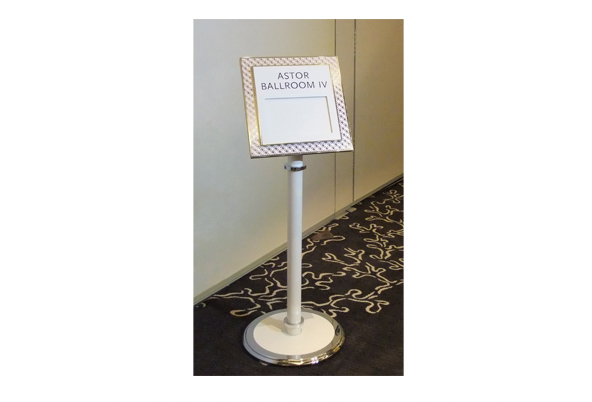 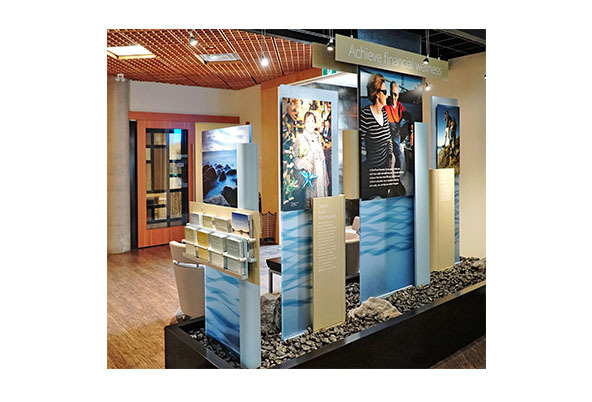 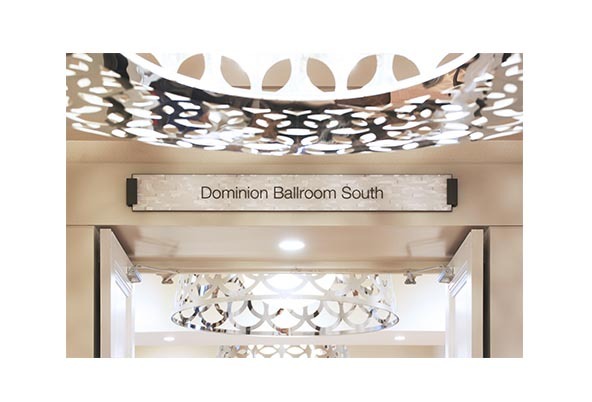 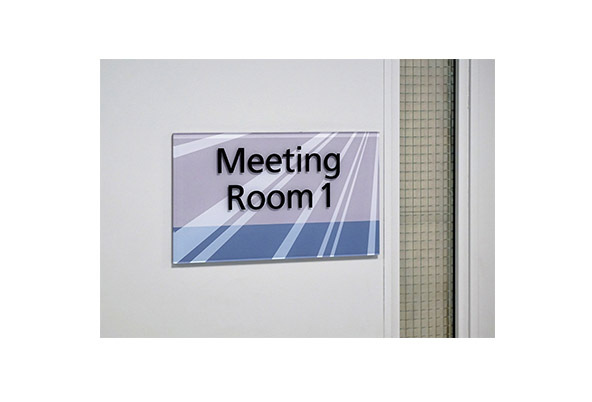 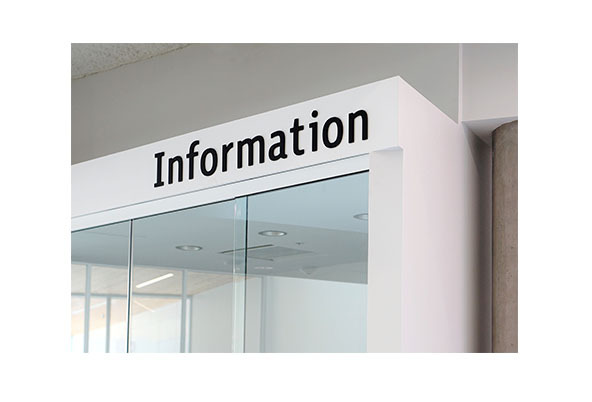 Combining innovative design and working with unique materials and advanced manufacturing techniques, resulted in a beautiful and highly effective sign program including meeting rooms, directional signs and digital directories. 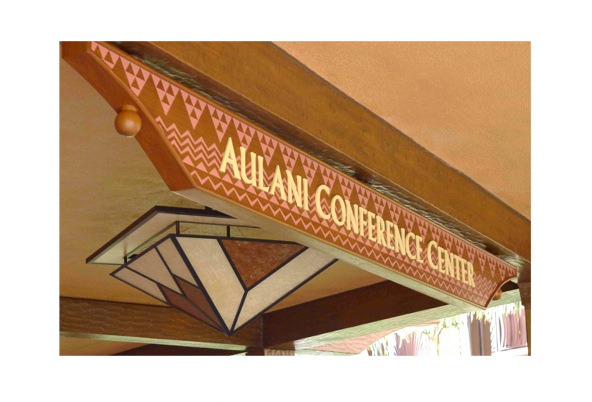 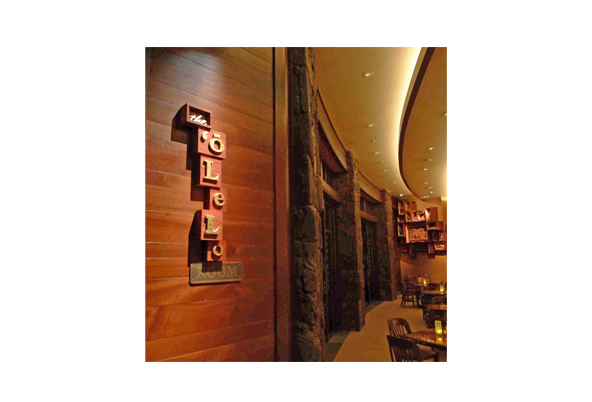 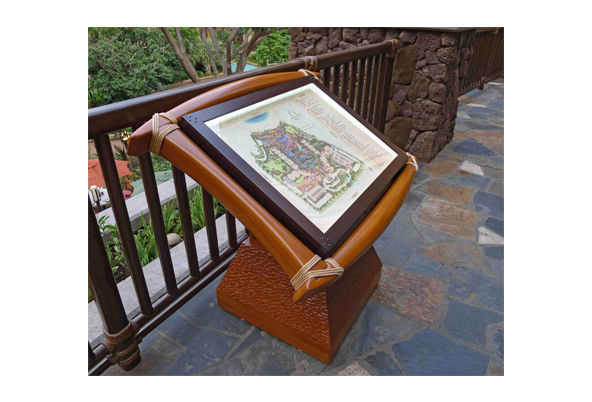 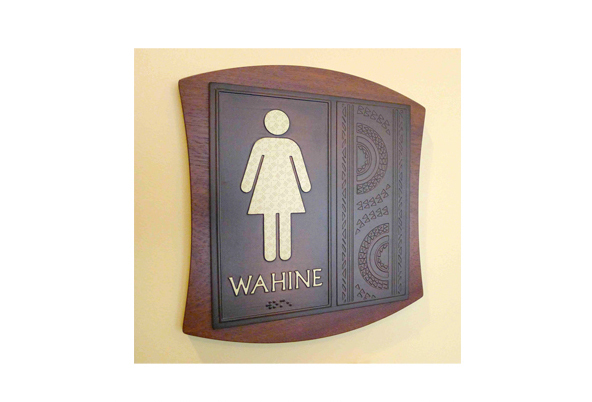 Walt Disney’s Imagineering design team worked collaboratively with EEC Industries to develop signage concepts that take advantage of indigenous themes and local materials. 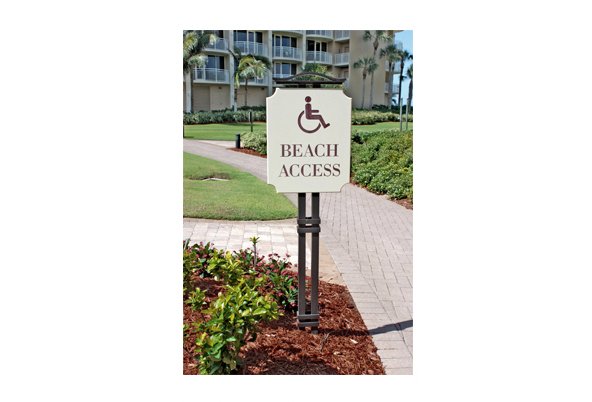 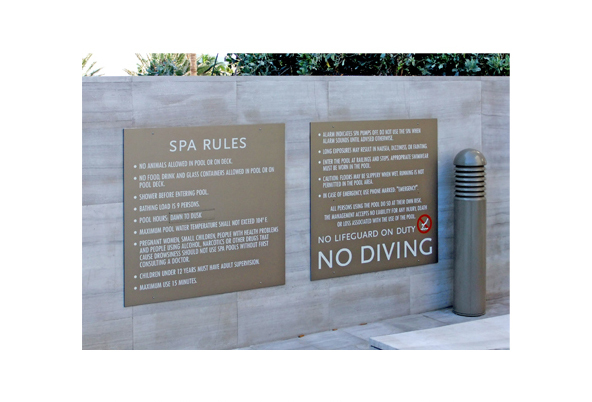 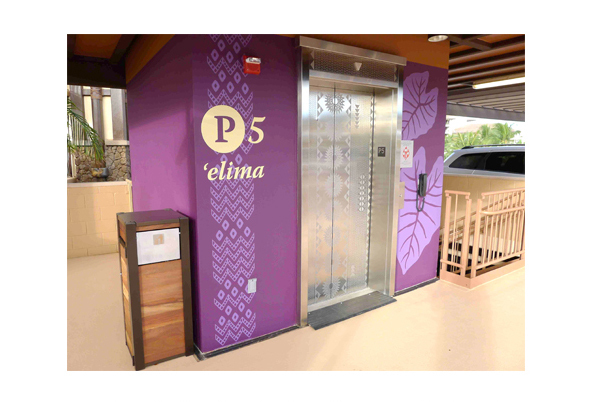 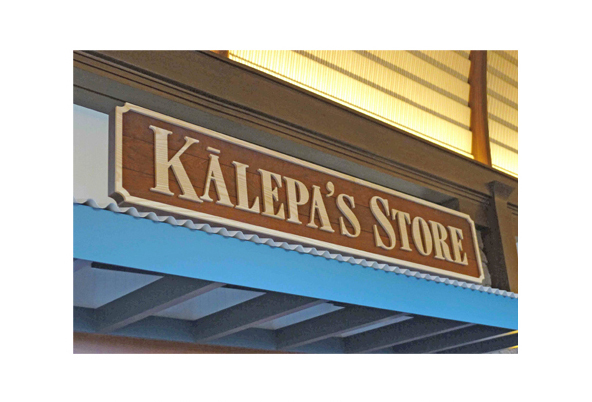 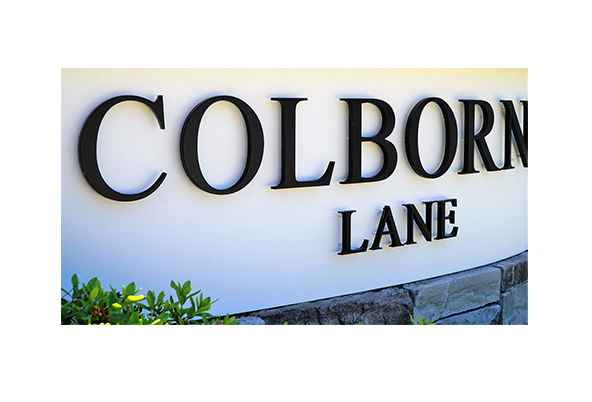 The signage program helps create a distinctive appearance and provides the durability required for the environment of Ko Olina, Hawaii. 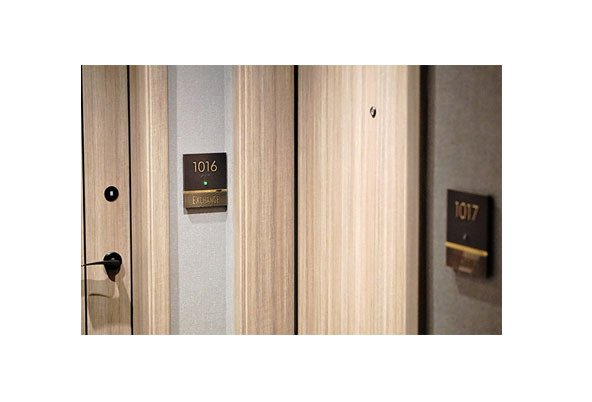 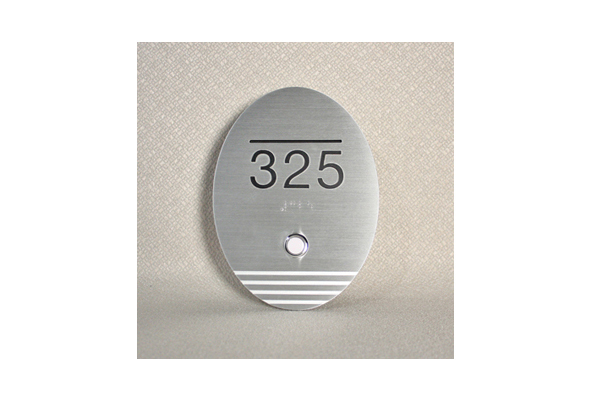 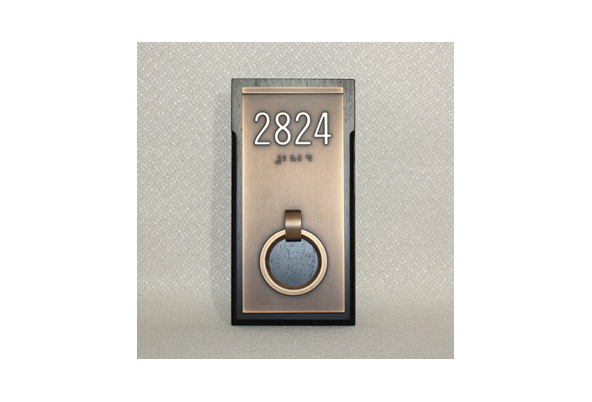 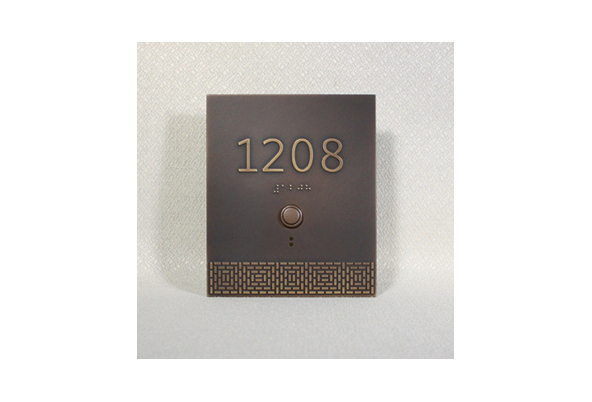 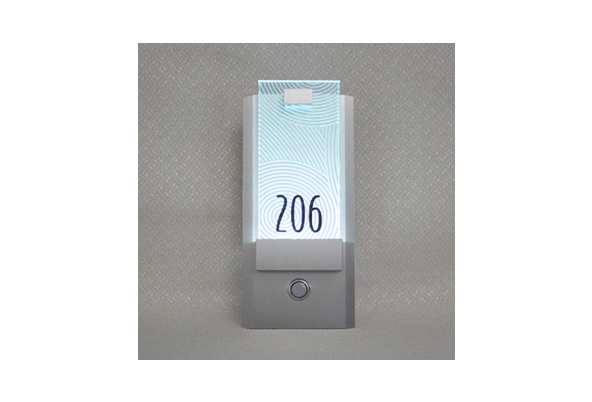 Many of the hotel and resort properties that we collaborate with have opportunities to include illuminated features within the sign design concept, or to include interactive functions such as doorbells, “do not disturb” (DND) and “make up room” (MUR) indicators. 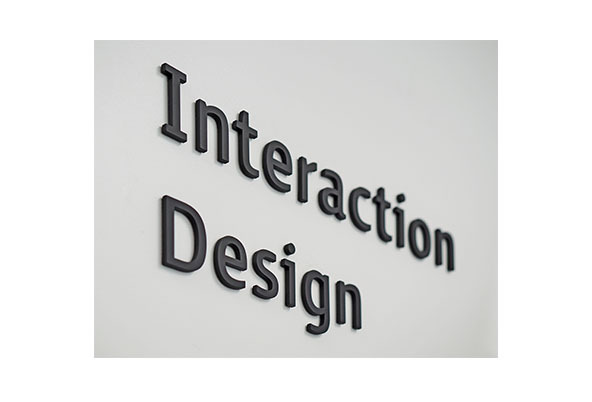 As these features become more commonplace, the potential for new and unique creative design is endless. 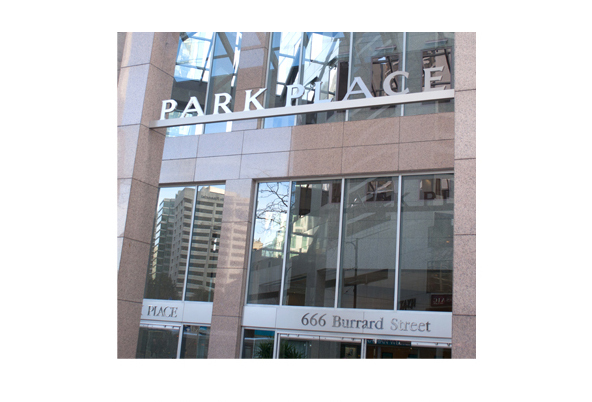 A soaring 55-floor property in the heart of Yorkville, Toronto’s glamorous shopping and restaurant district. 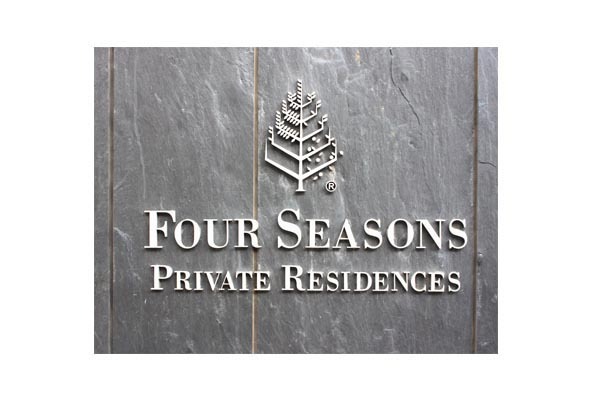 We were privileged to provide this prestigious development with exceptional signage befitting the Four Seasons brand. 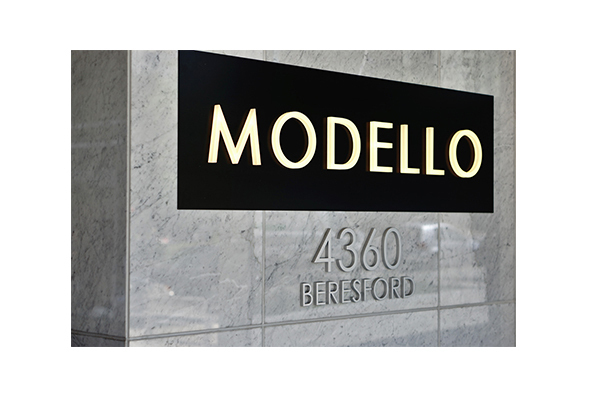 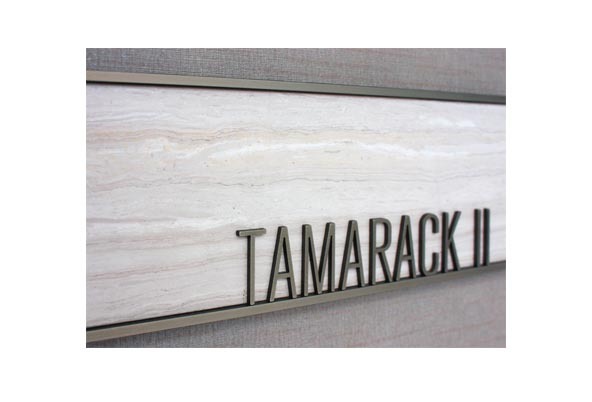 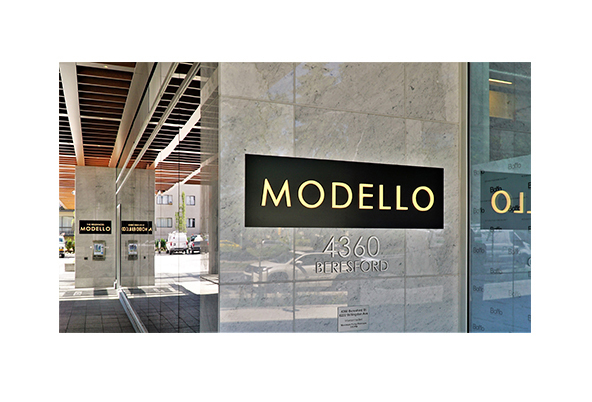 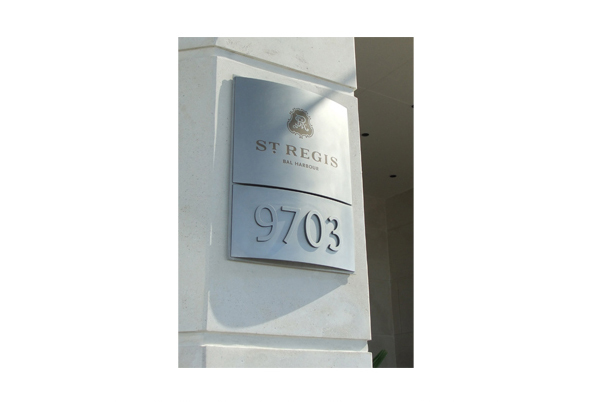 Neutral colour palettes, natural stone and warm metals define this unique, custom signage, built and installed by EEC. 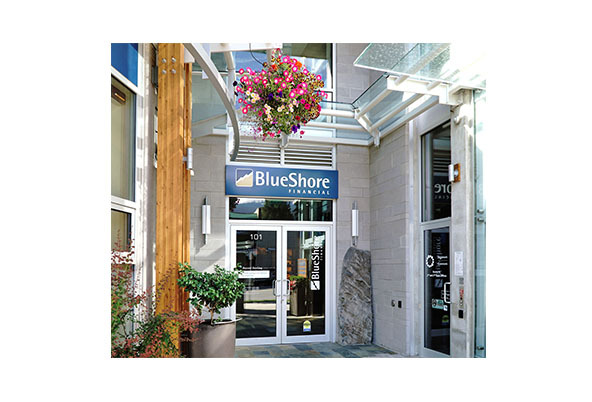 Located on the pristine harbour in Vancouver, British Columbia, the hotel and residential tower has a combination of stunning views and contemporary architecture. 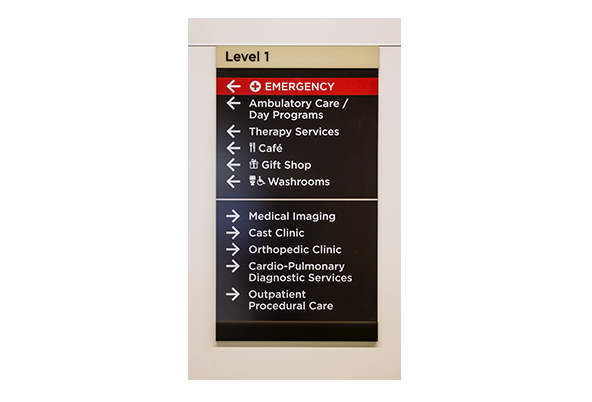 EEC manufactured and installed the complete signage program, with a strong, competent, focus on precision planning and attention to client requirements. 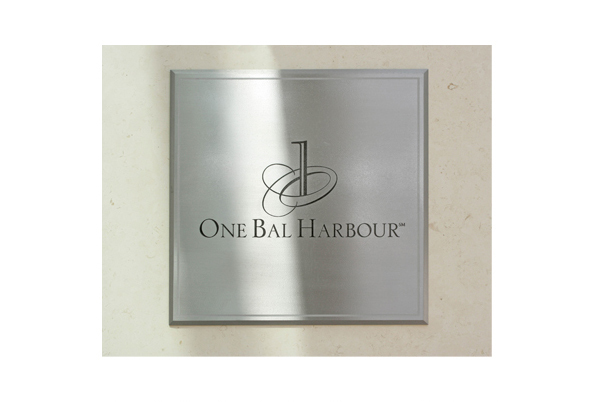 Set along the most coveted stretch of white sand Florida beaches where the wide blue ocean meets the Intracoastal Waterway, One Bal Harbour represents the finest in luxury appointments. 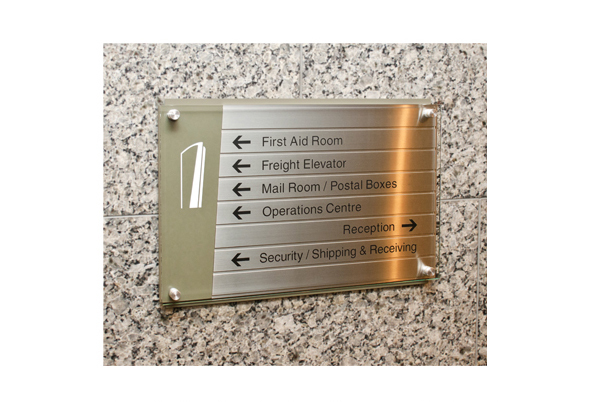 The signs designed and supplied by EEC Industries are no exception. 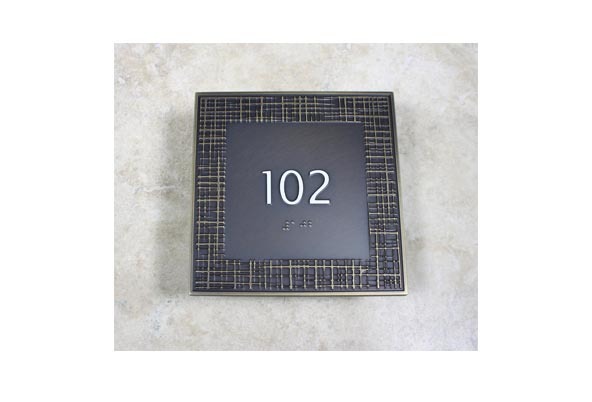 The materials and finishes represent the level of luxury their guests expect. 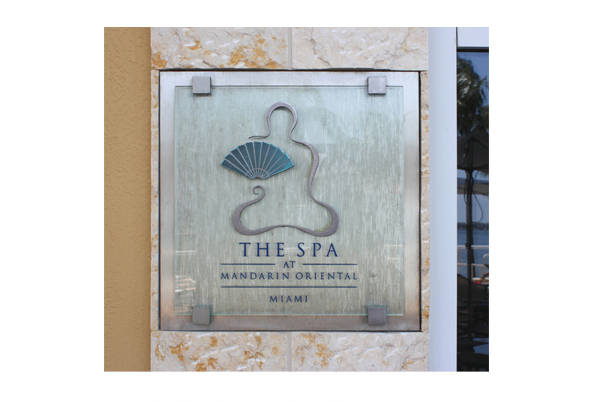 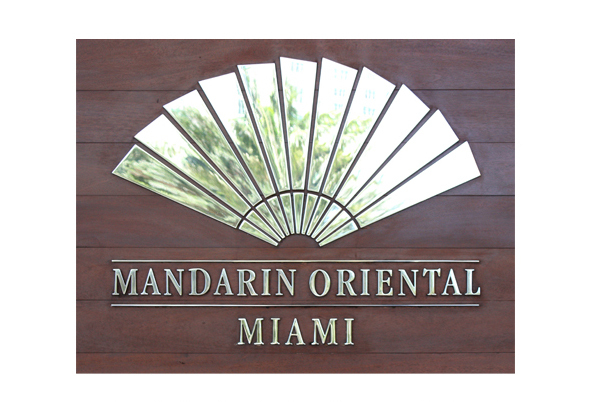 Mandarin Oriental Miami represents a wonderful fusion of design concepts, both modern and traditional. 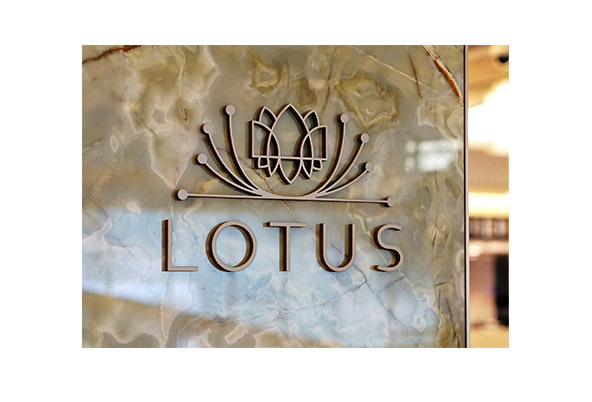 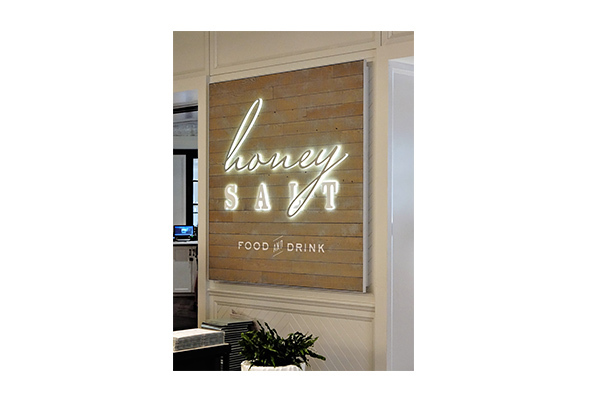 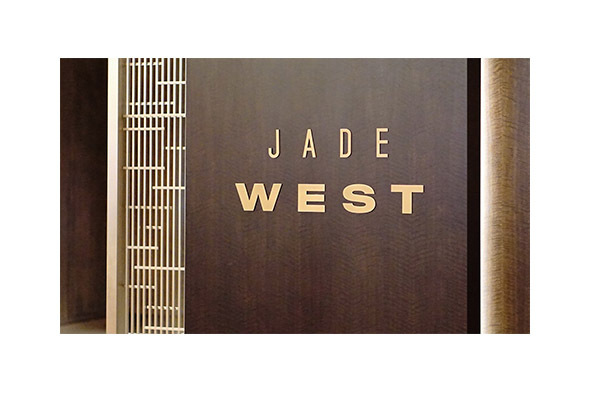 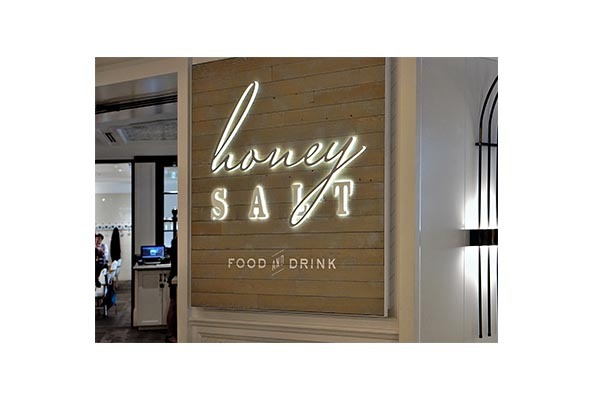 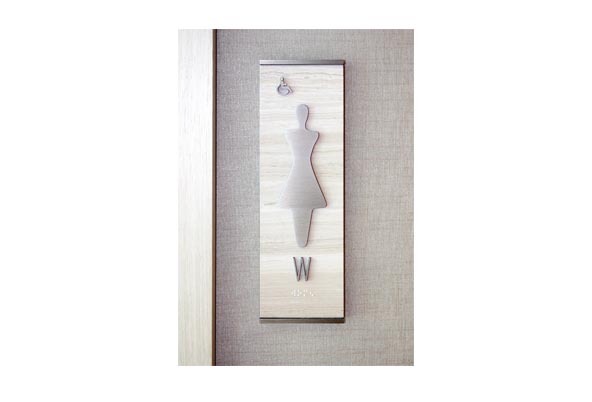 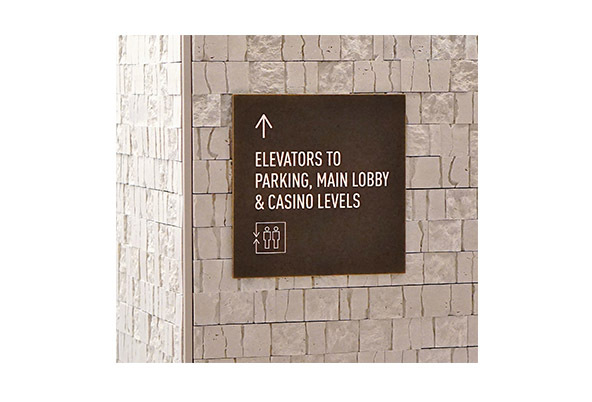 The sign program designed for the hotel uses delicate patterns and rice paper combined with beautiful natural material finishes of wood and aluminum. 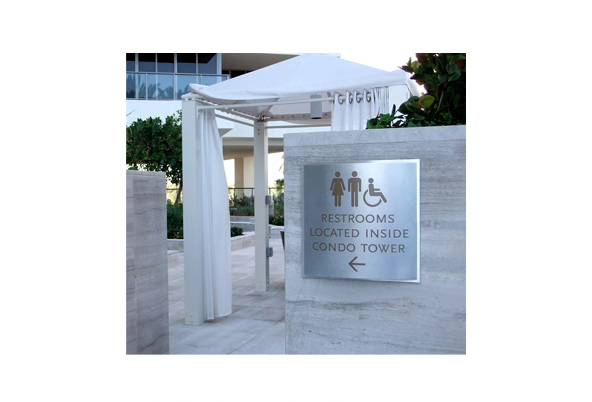 The designs complement the modern interiors and were developed to consider the effects of the elements in a marina side location. 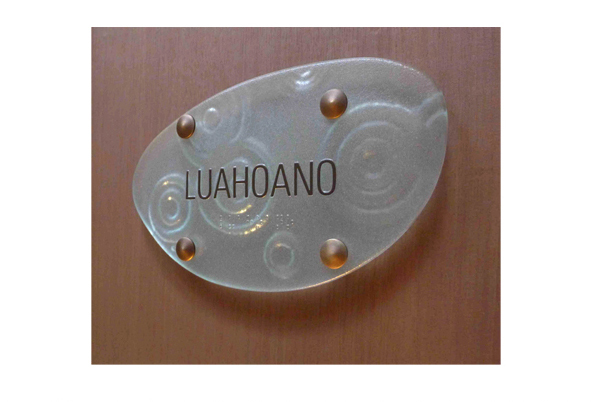 The resort is designed as a tranquil retreat with features to transport the guest away from the every day. 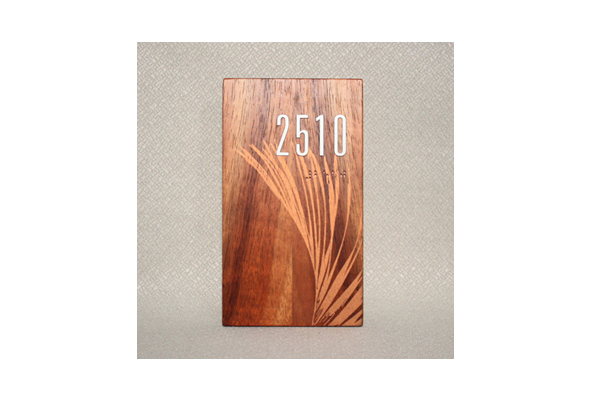 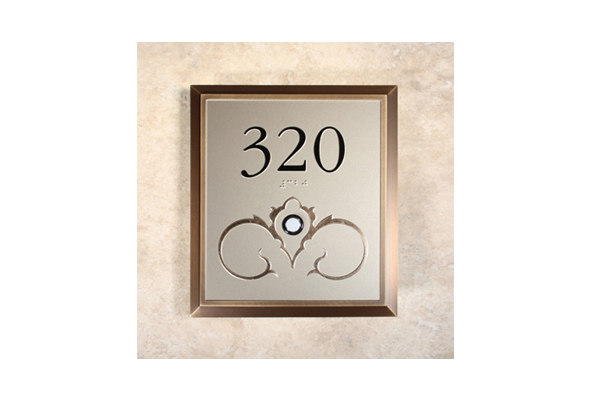 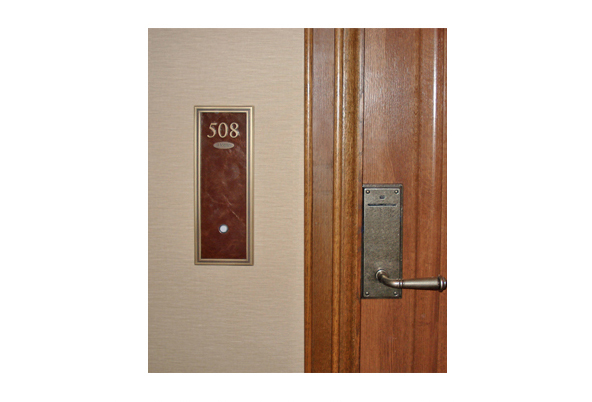 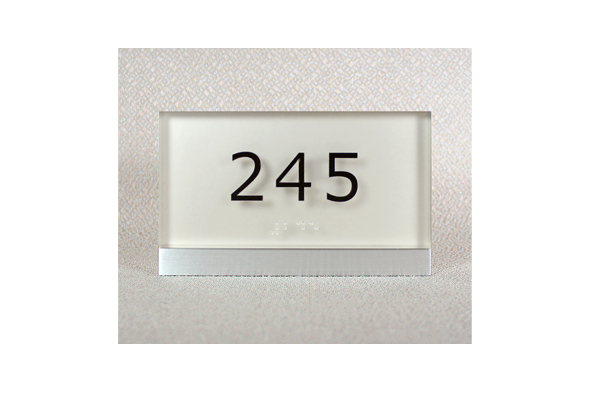 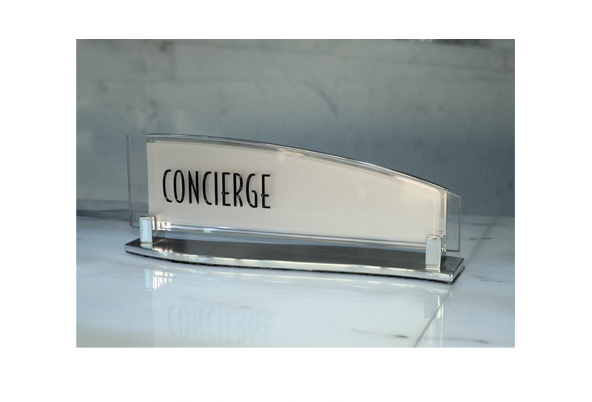 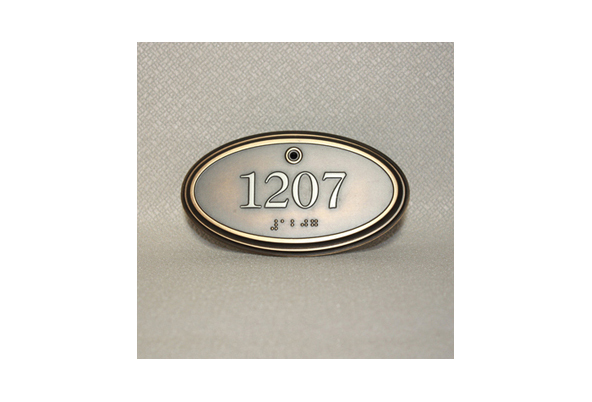 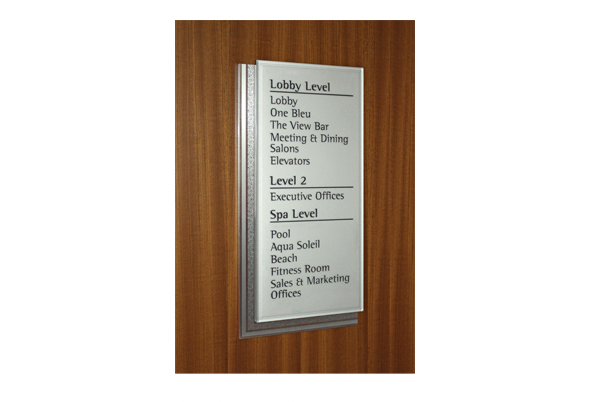 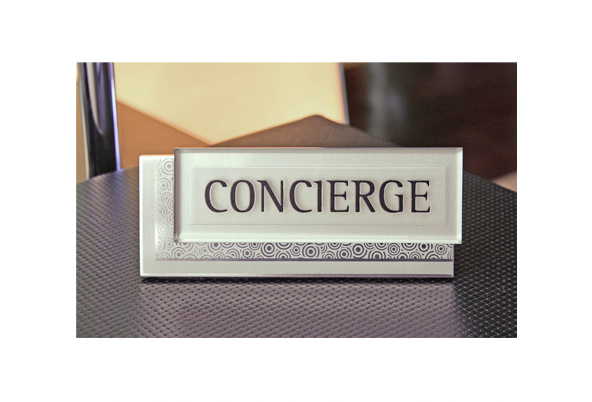 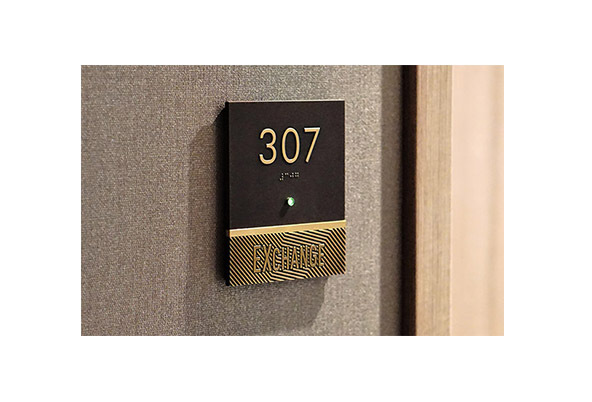 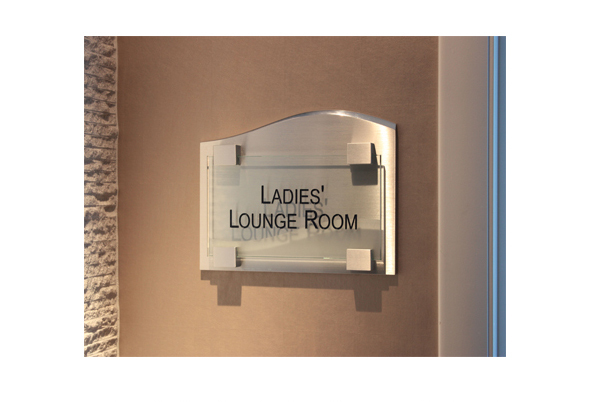 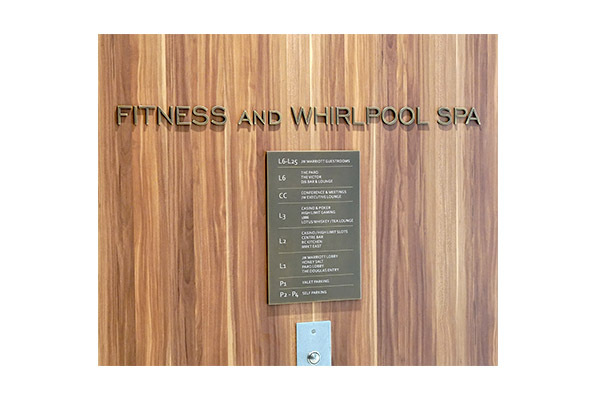 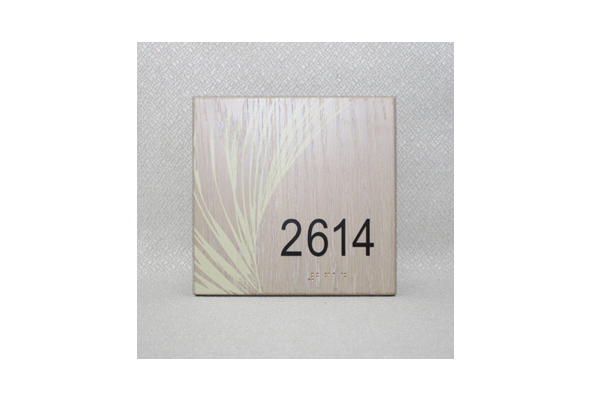 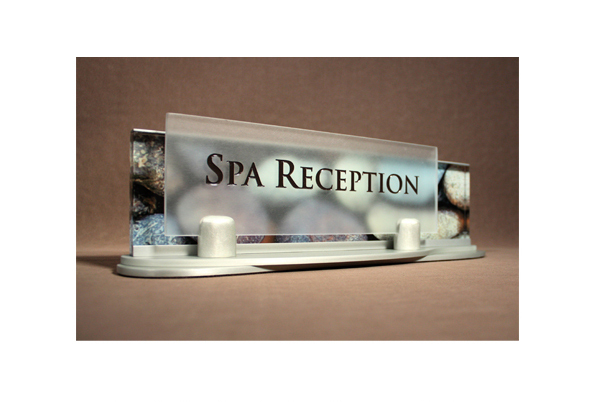 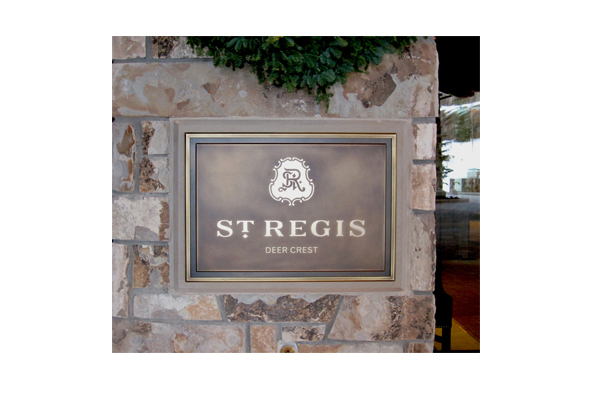 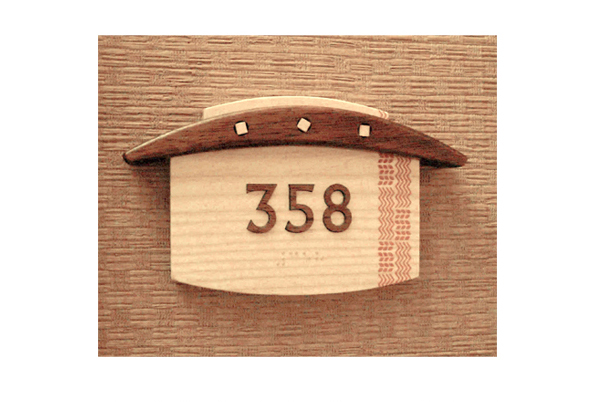 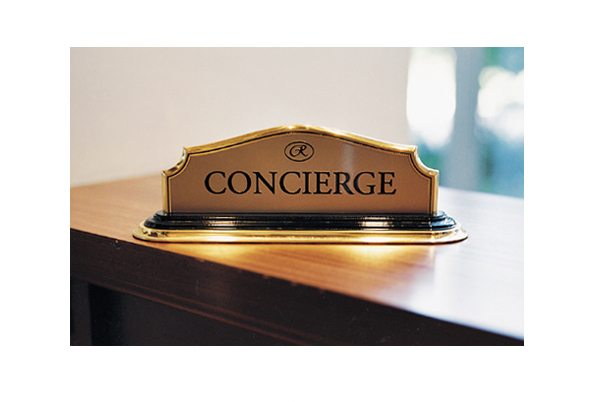 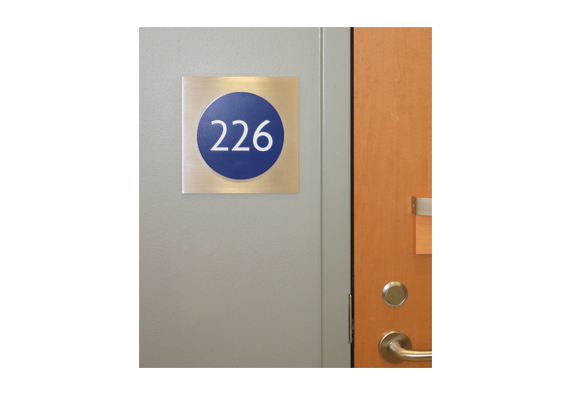 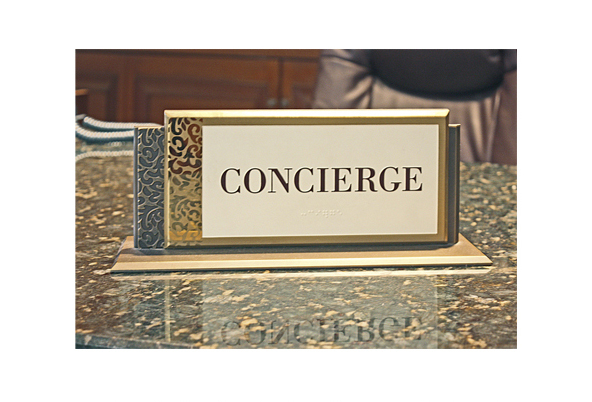 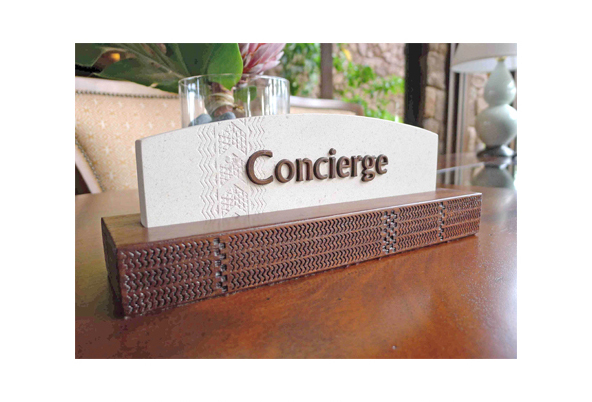 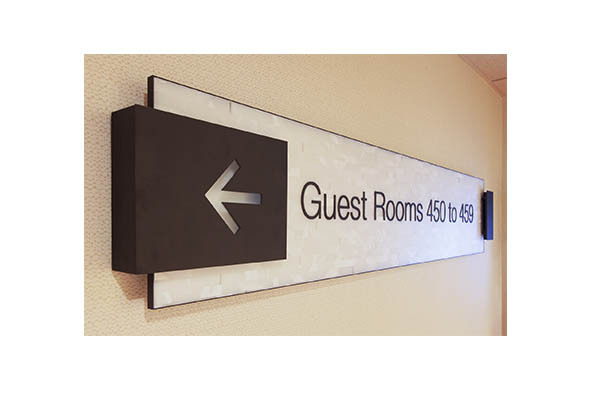 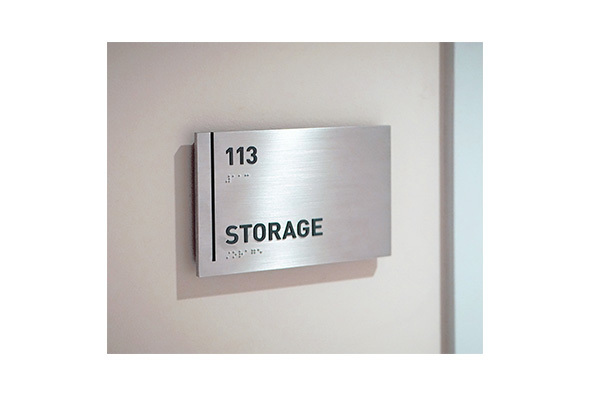 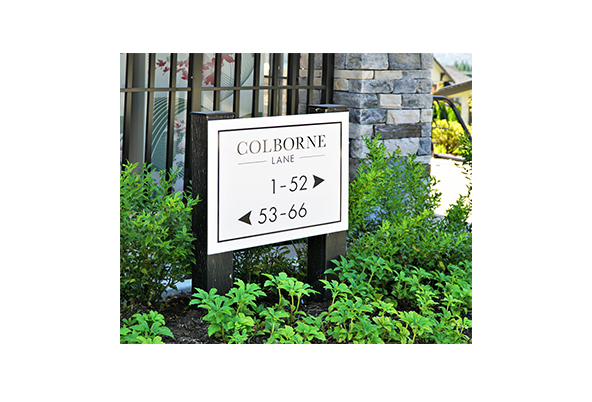 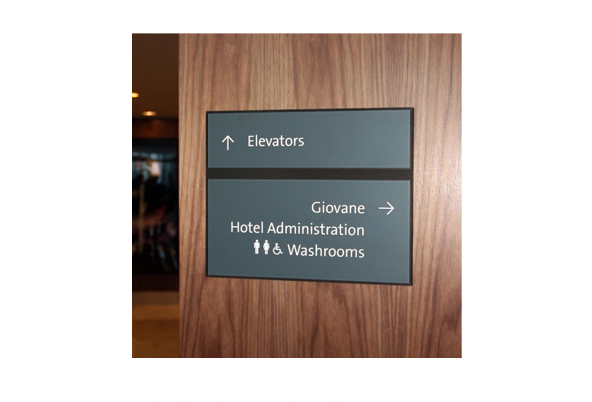 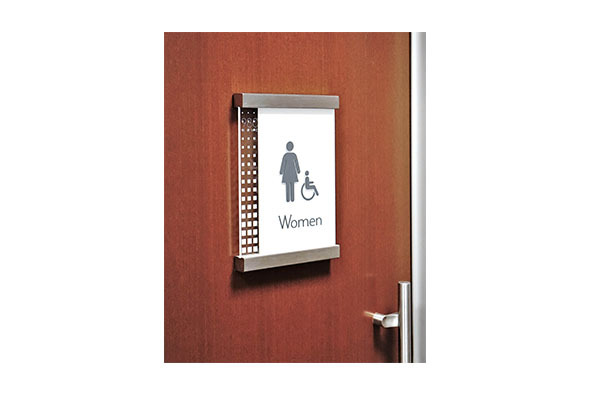 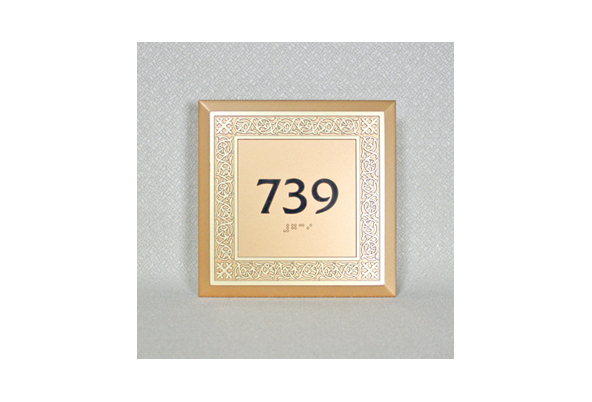 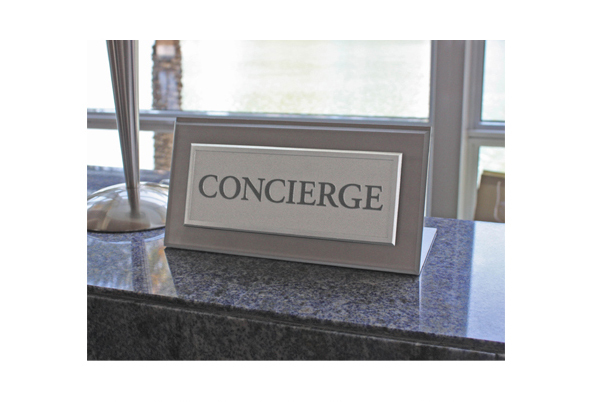 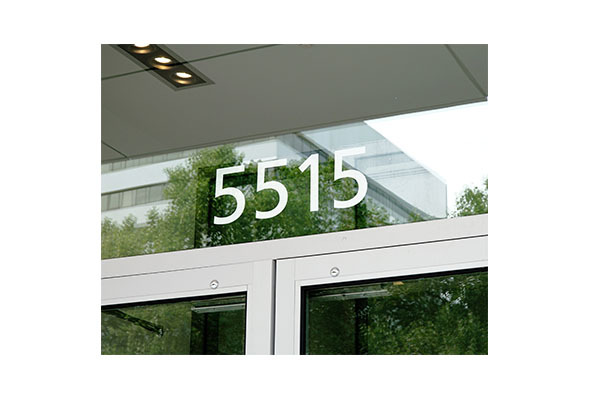 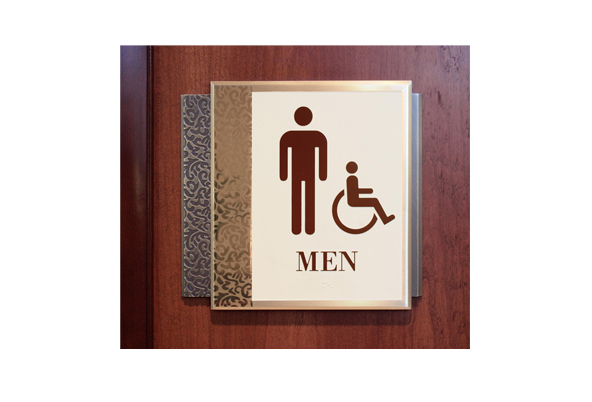 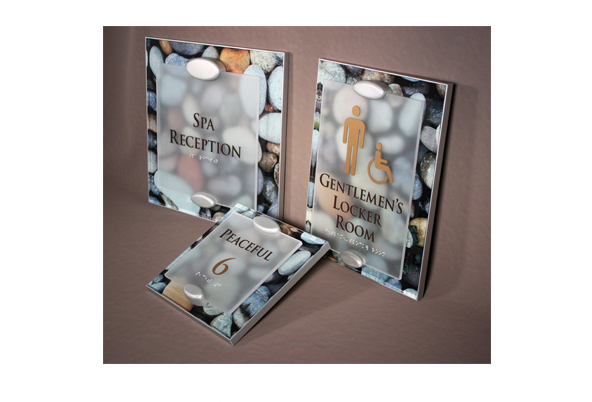 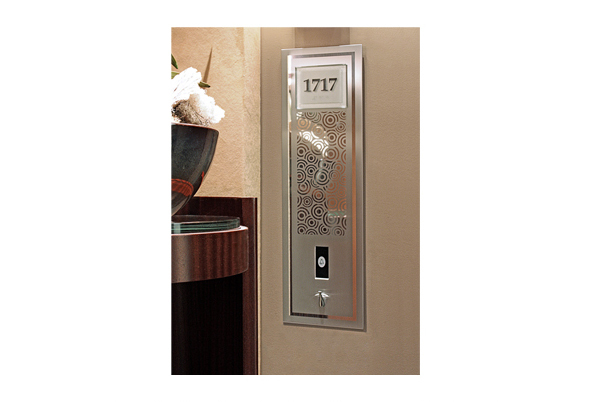 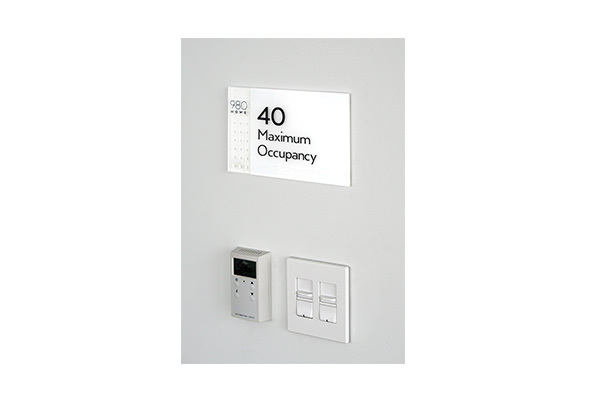 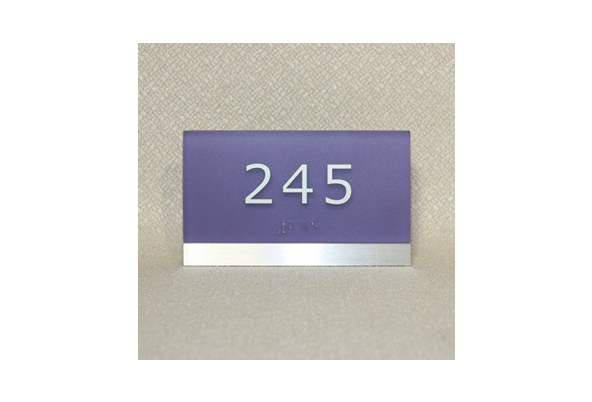 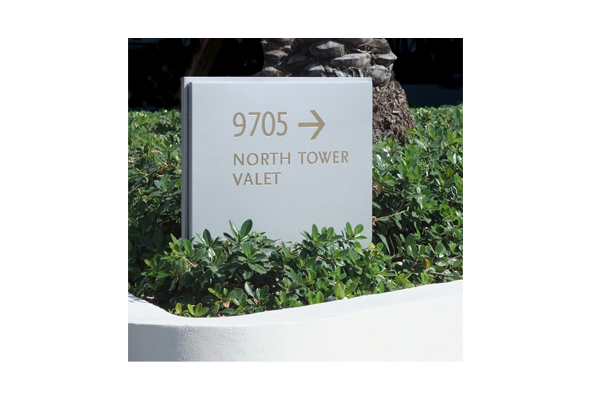 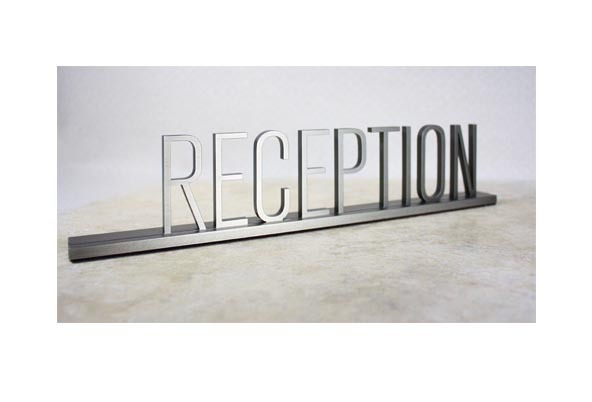 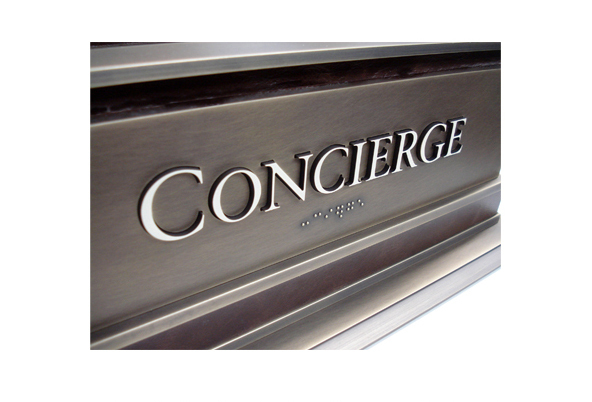 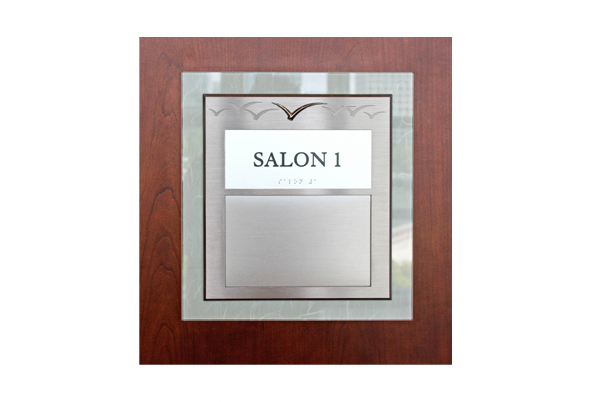 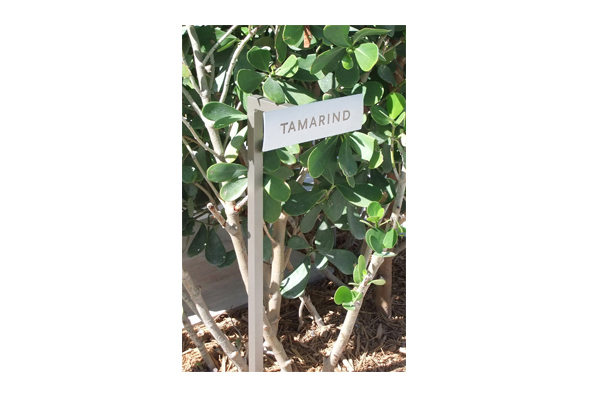 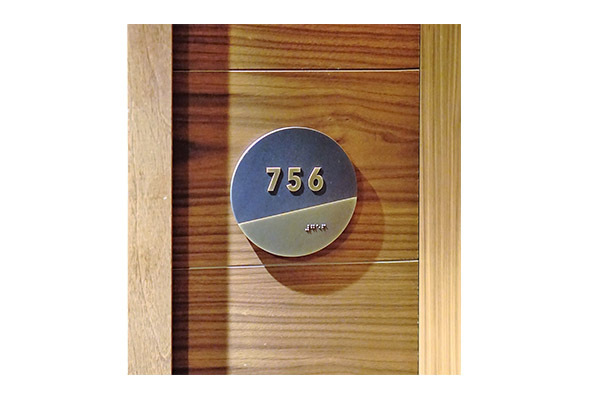 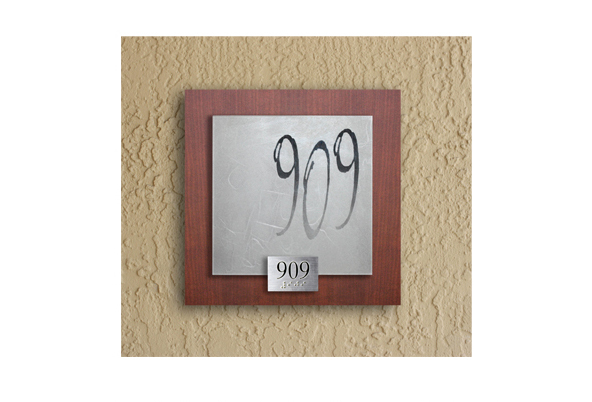 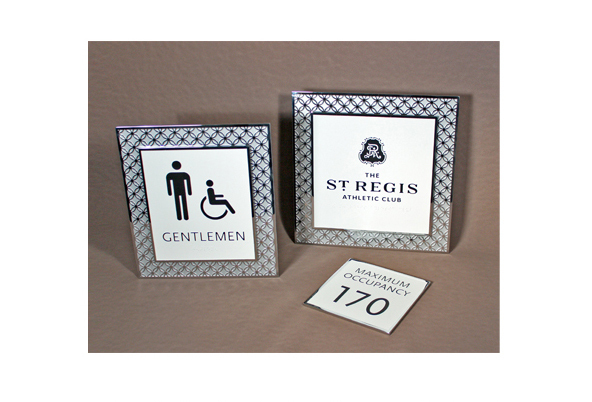 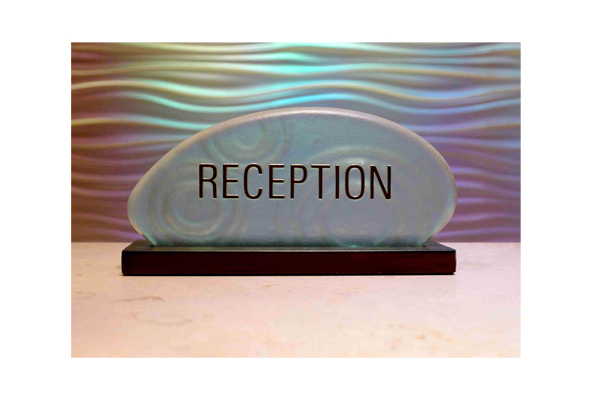 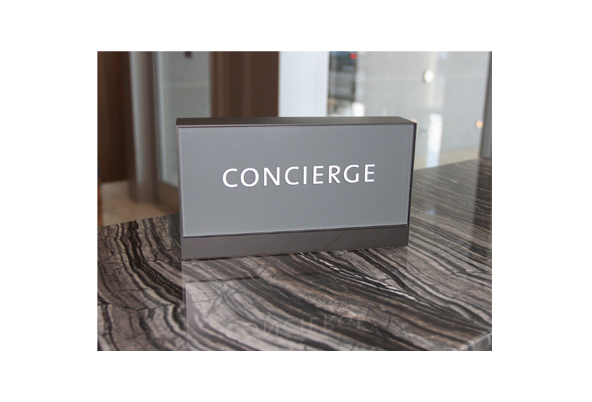 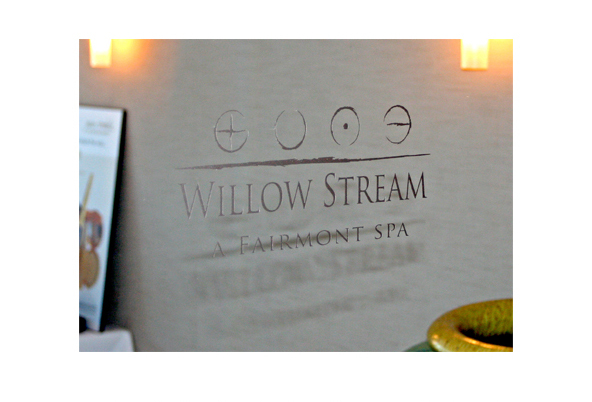 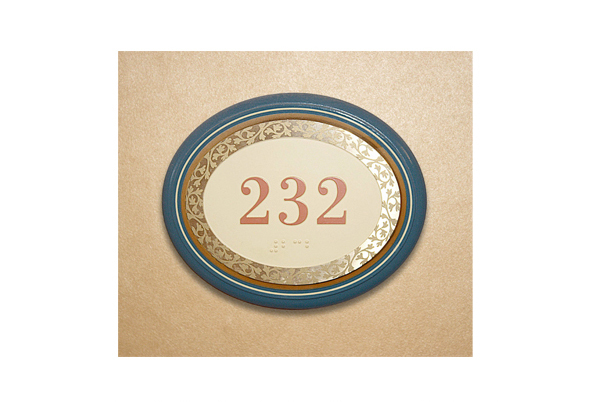 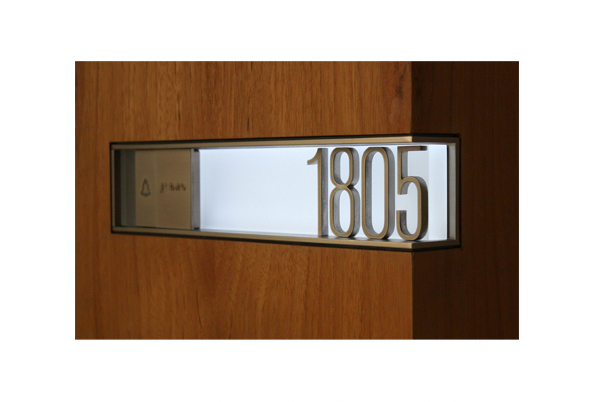 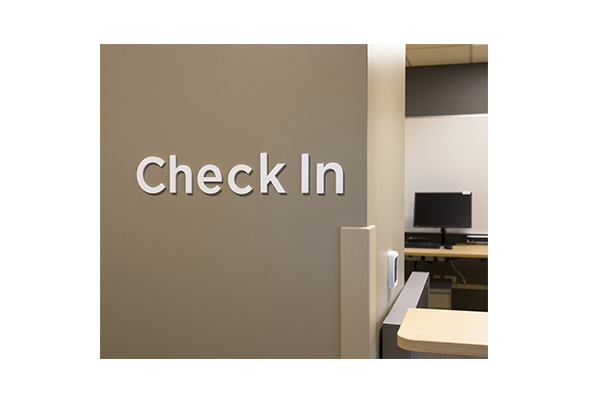 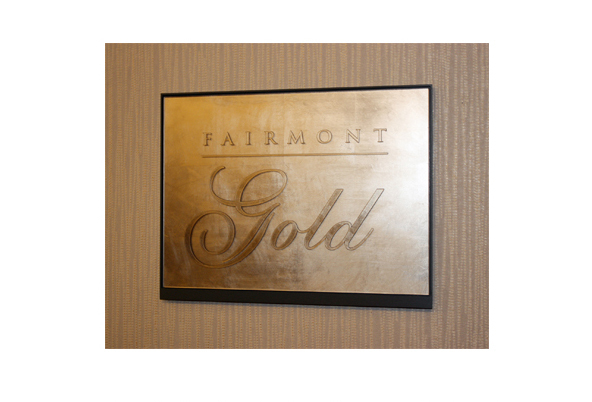 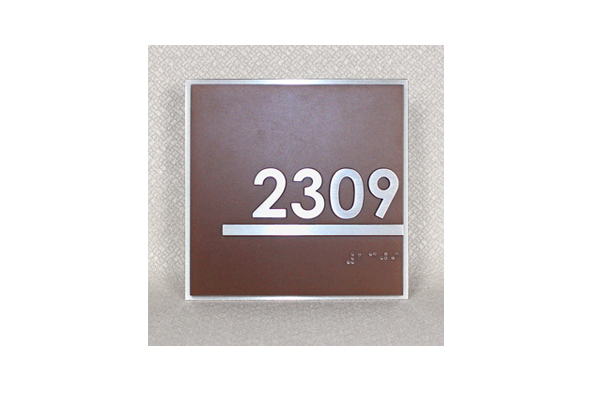 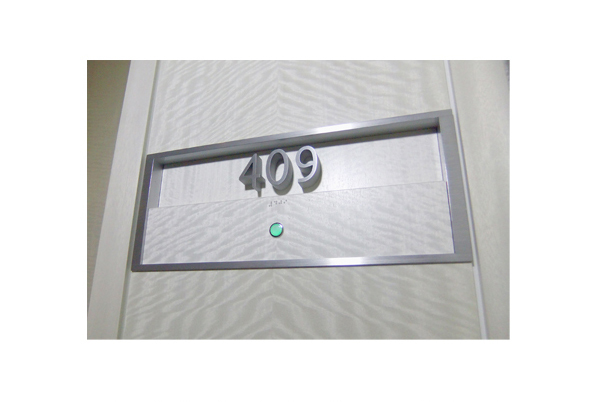 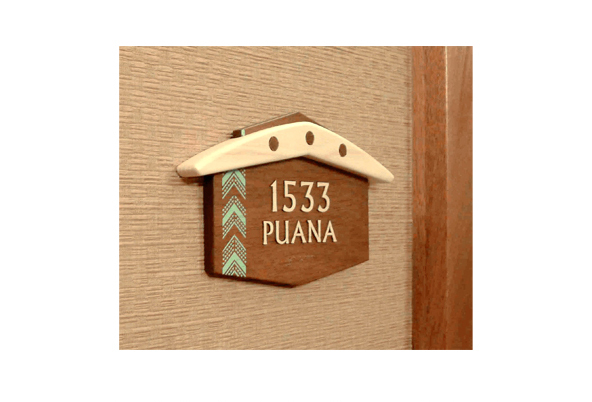 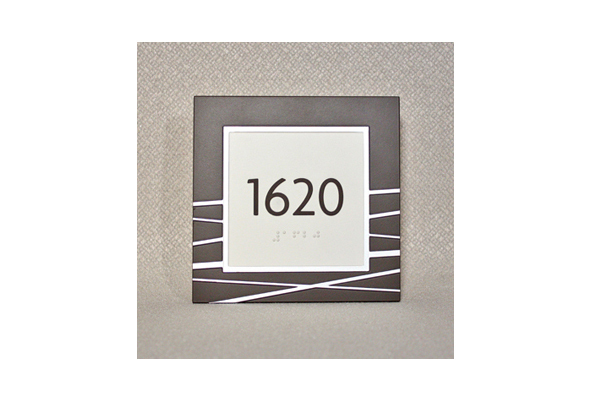 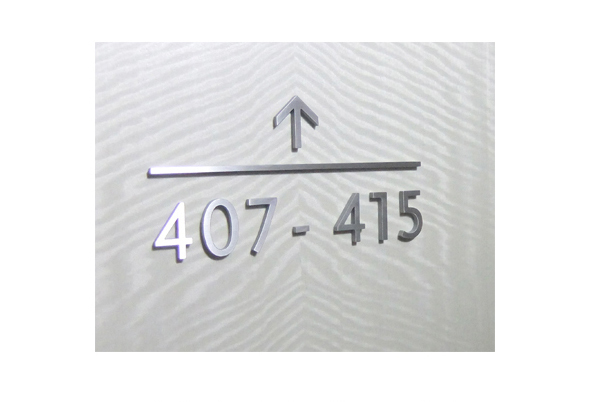 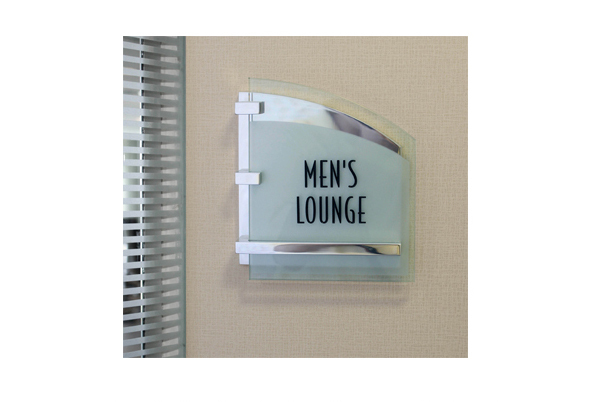 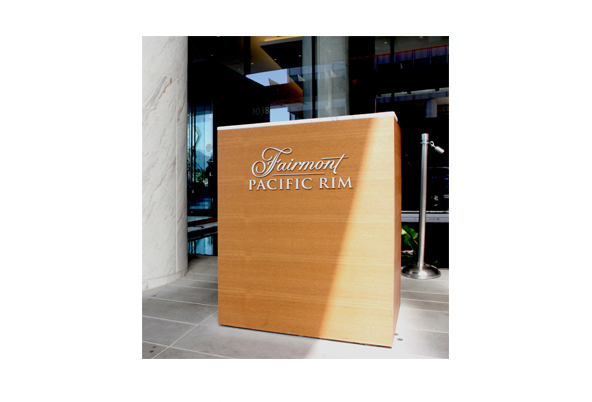 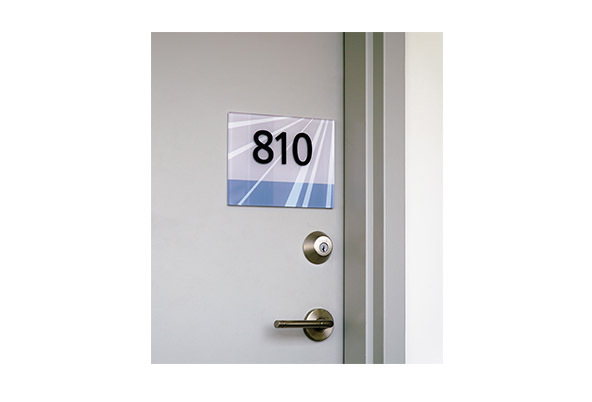 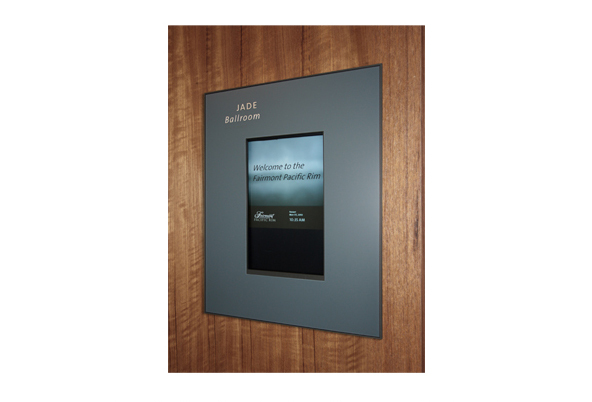 The custom designed sign program uses subtle finishes and patterns to provide clear guest information with elegant appearance. 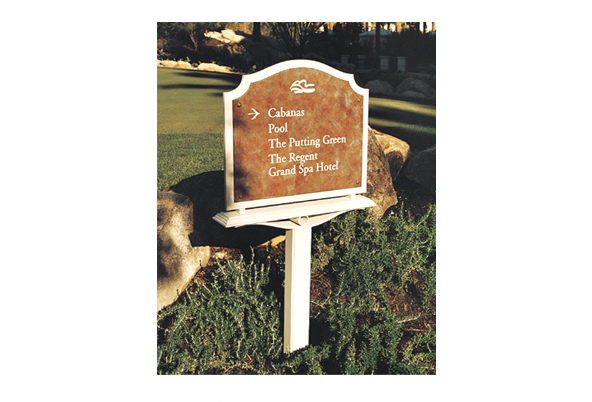 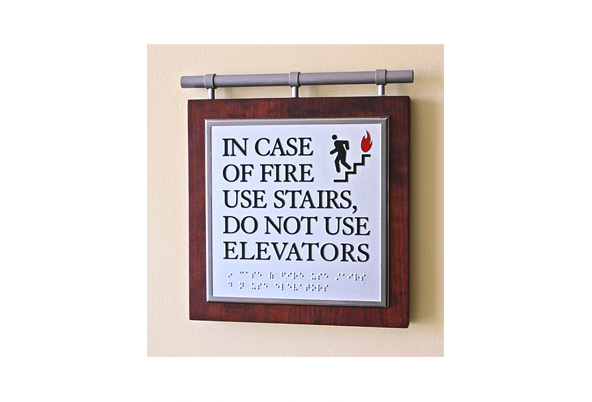 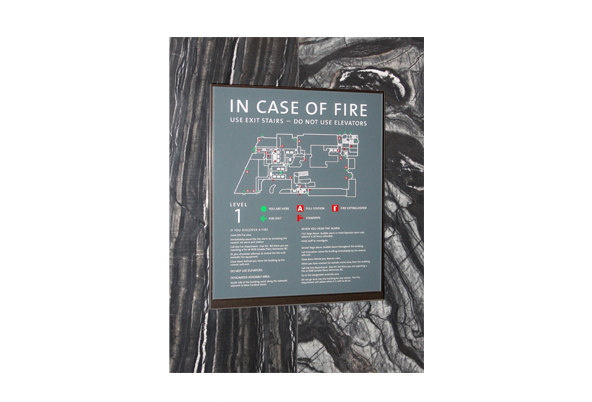 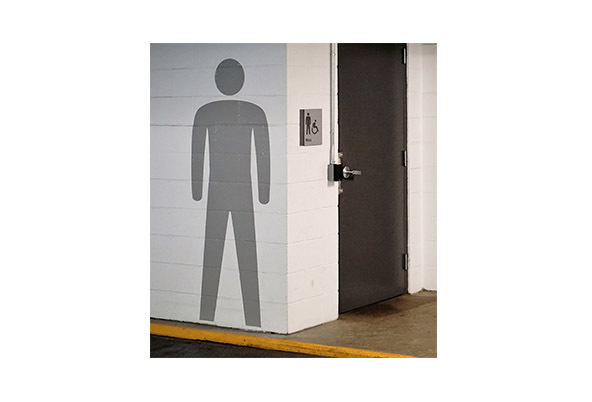 Many of the wayfinding and feature signs were developed to consider the heat and humidity. 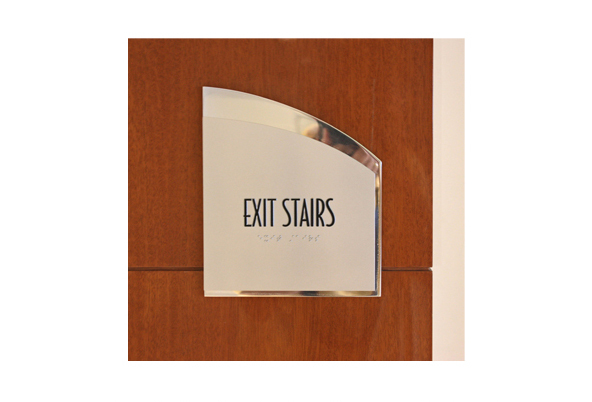 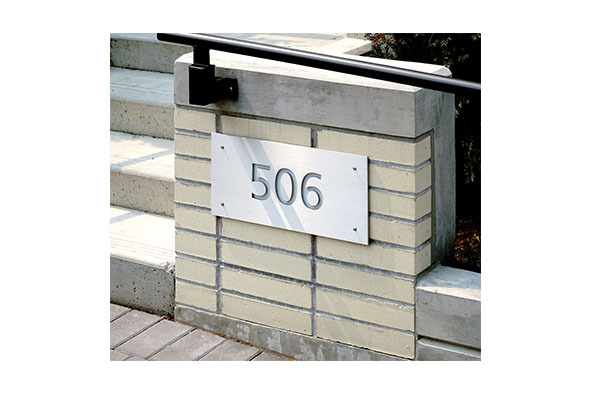 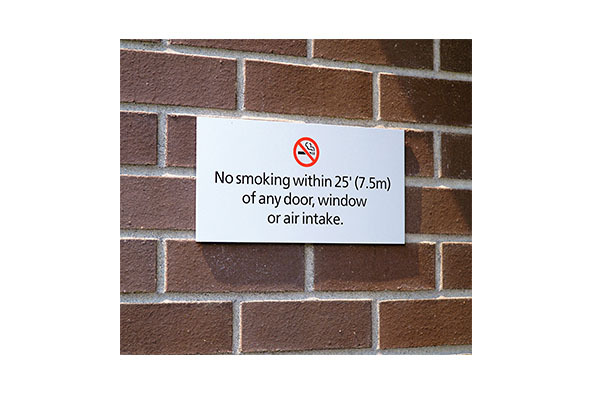 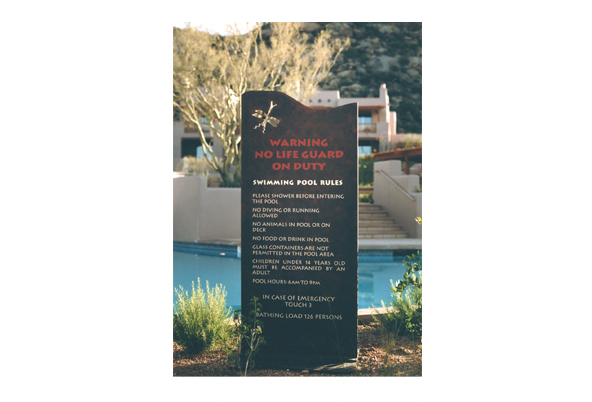 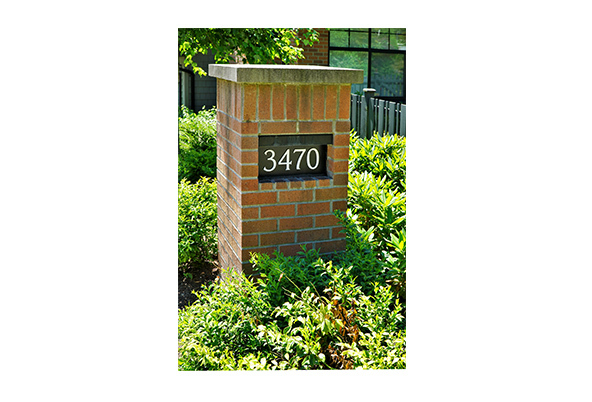 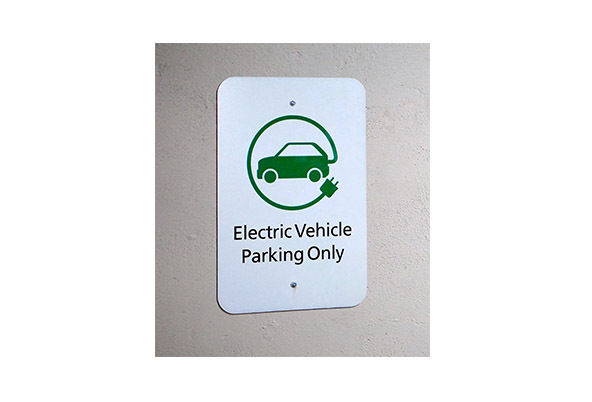 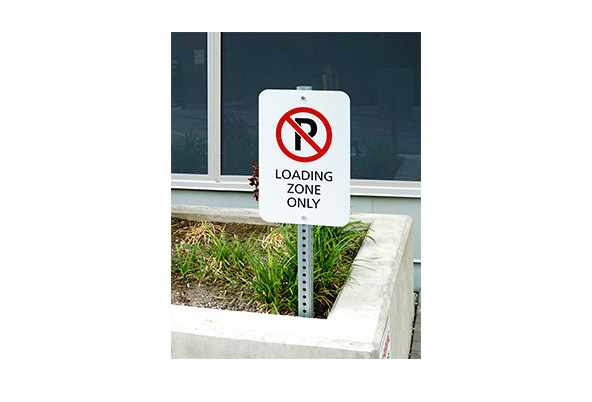 EEC provides the full suite of signage for residential buildings with a noticeable difference in quality and durability. 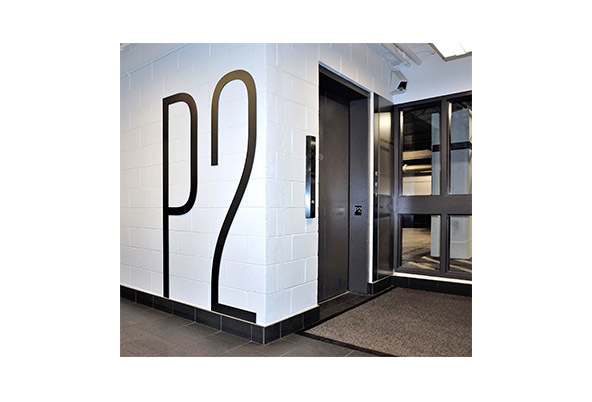 A three-phase development in the bustling area of Collingwood, this impressive collection of condominiums and amenities incorporated a design concept inspired from both the old and the new. 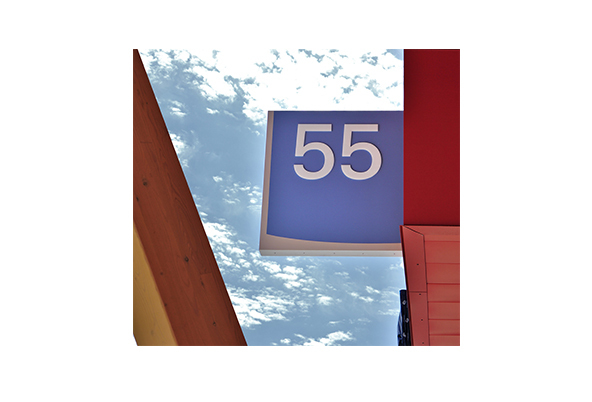 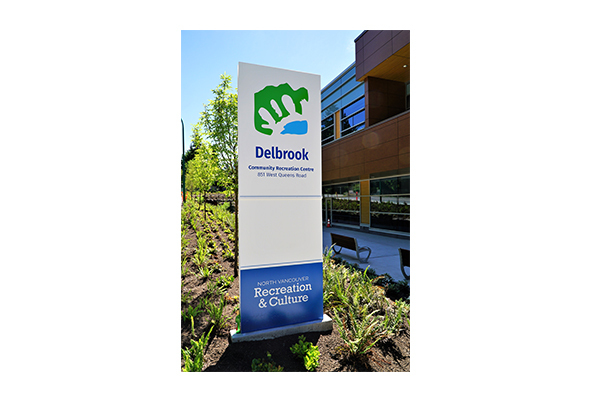 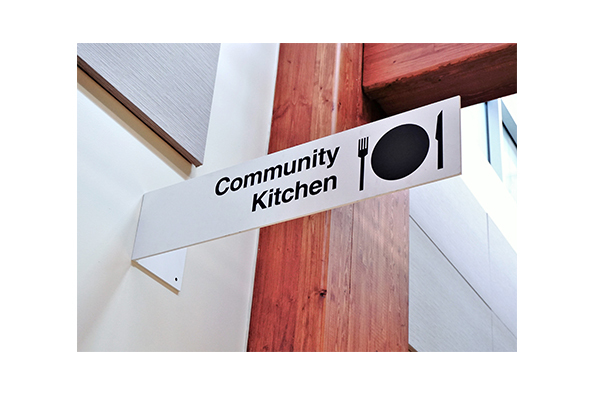 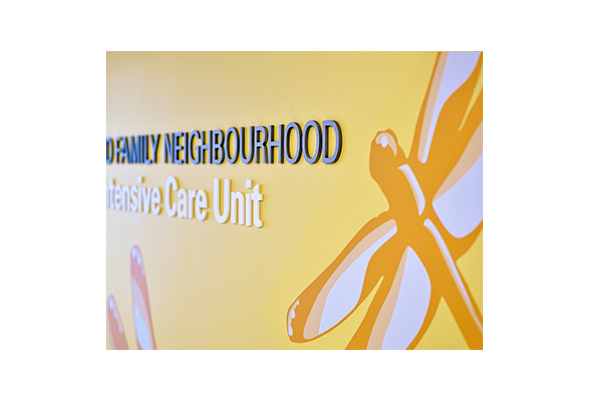 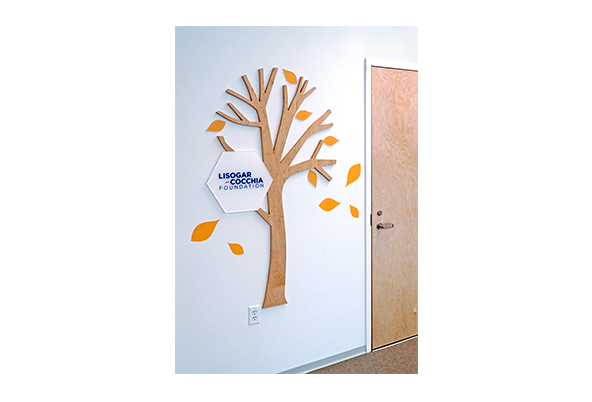 A simple, playful design with the community fabric in mind, EEC created signage that was on point. 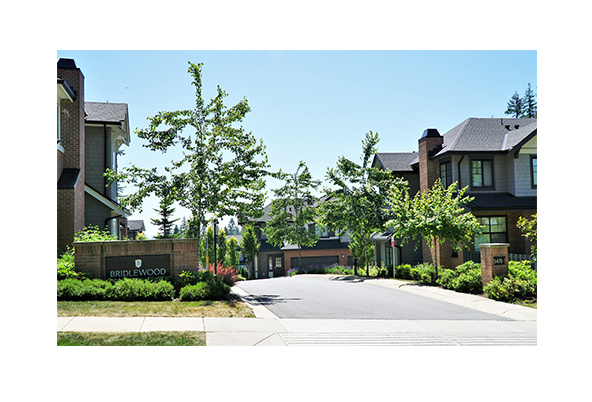 Surrounded by unmatched natural beauty, this collection of townhomes in the picturesque community of Smiling Creek on Burke Mountain are truly unique as they were inspired by an ‘Arts and Craft’ concept. 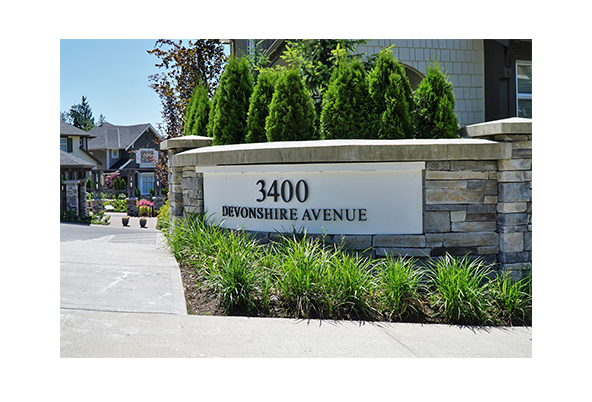 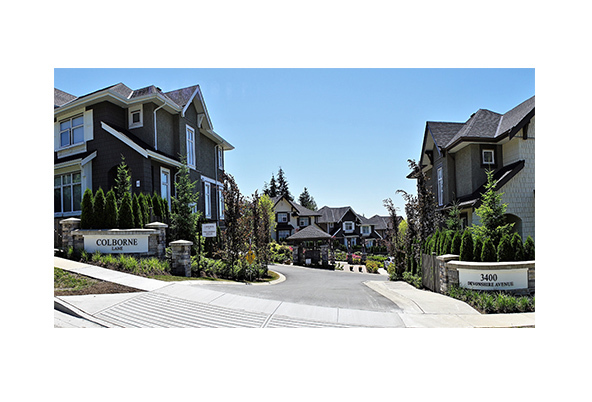 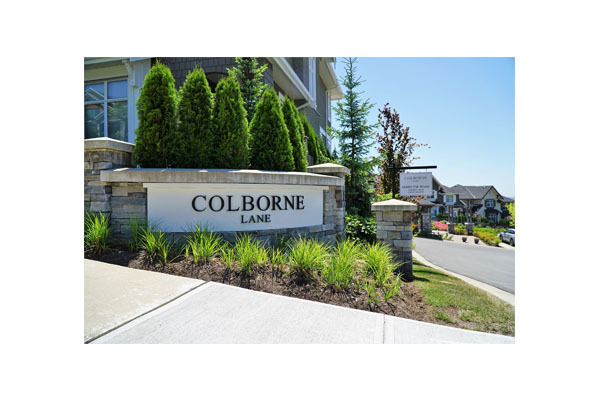 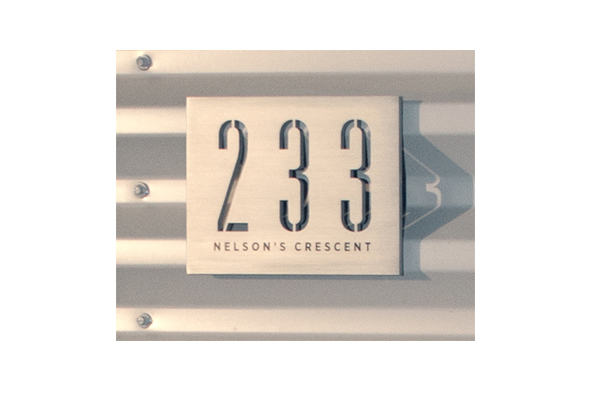 The exterior entrance, townhome suite numbers, and community directionals, were all manufactured and installed by EEC and we are proud to have contributed to a neighbourhood with so much character. 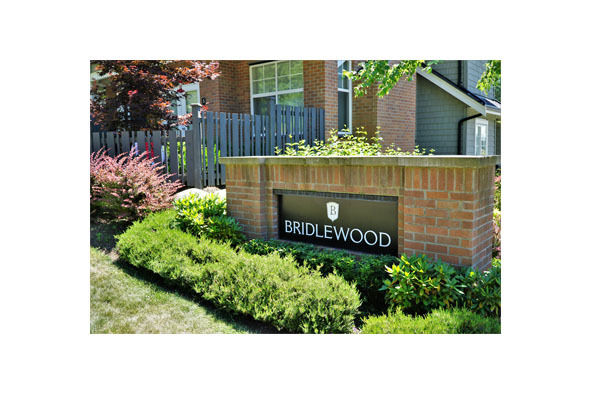 Amid tall evergreens on the east bank of Smiling Creek you’ll find the craftsman style executive townhome community of Bridlewood. 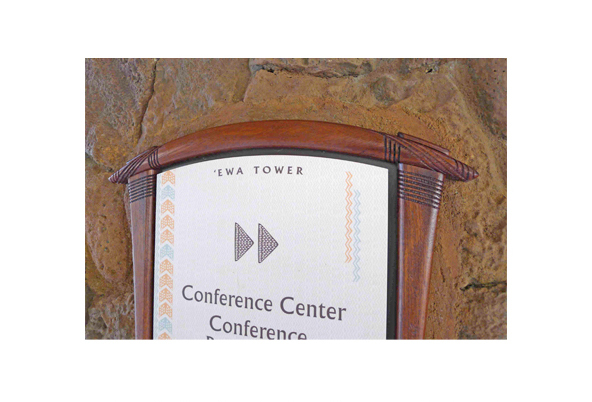 In keeping with the refined architectural elements of the craftsman-style, EEC designed and fabricated classic signage to complement the bravura. 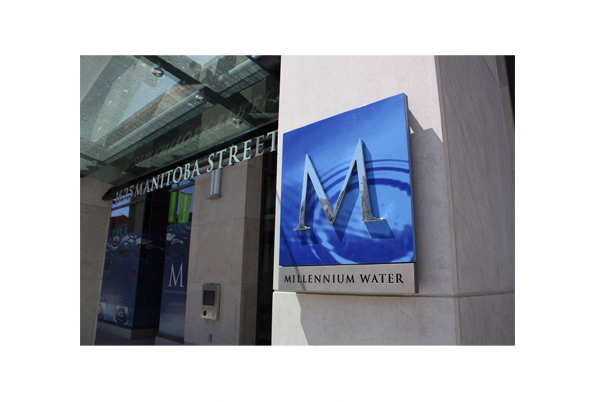 Originally housing for the world’s athletes participating in the 2010 Olympic and Paralympic Games, Millennium Water is now home to hundreds of Vancouverites. 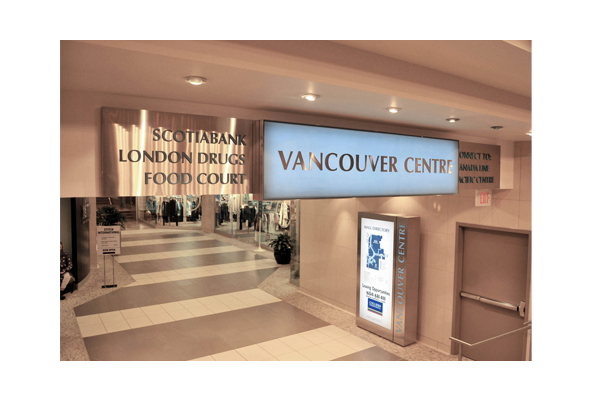 This project included the manufacturing and installation of digital signage, building signs, and corporate signage. 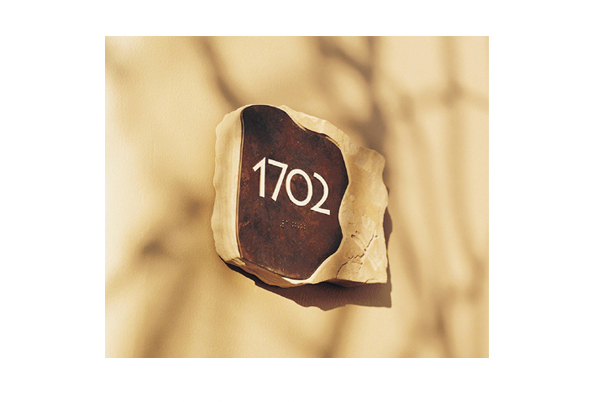 A step away from beautiful Central Park, this design was vitalized by modern concepts and the simplicity of the natural environment. 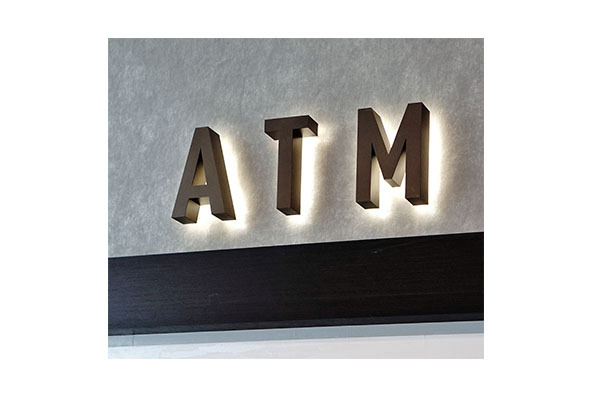 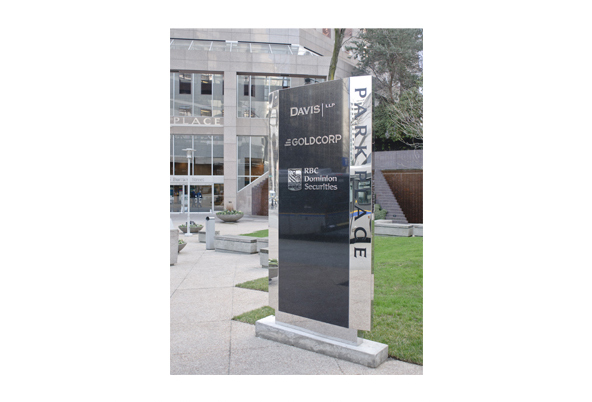 To add to the sleek lines and modern font, EEC created a backlit illuminated effect using thick translucent acrylic for the main monument sign. 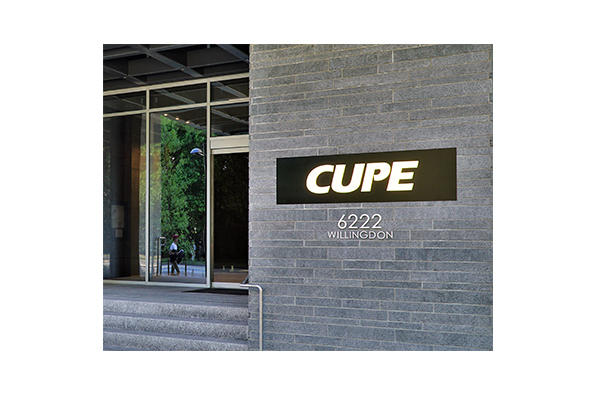 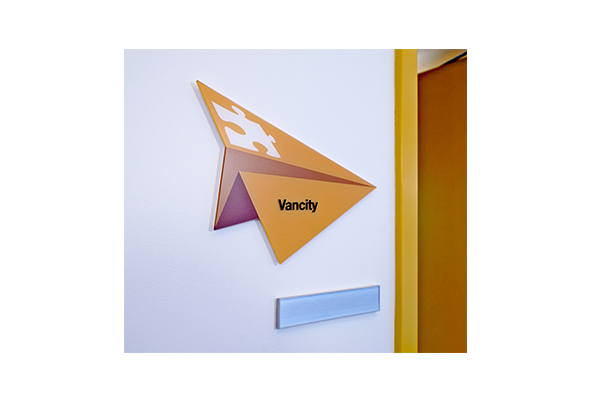 We also manufactured and installed the exterior building signage and identification. 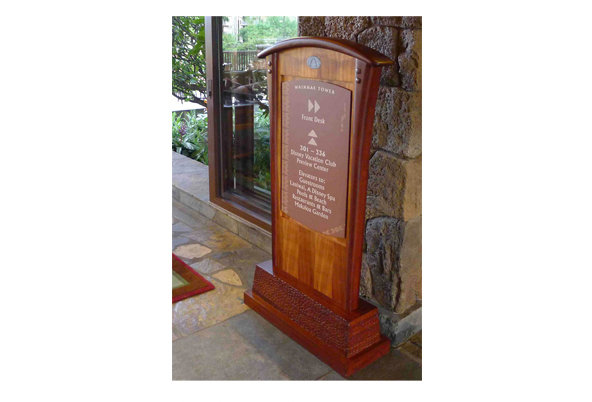 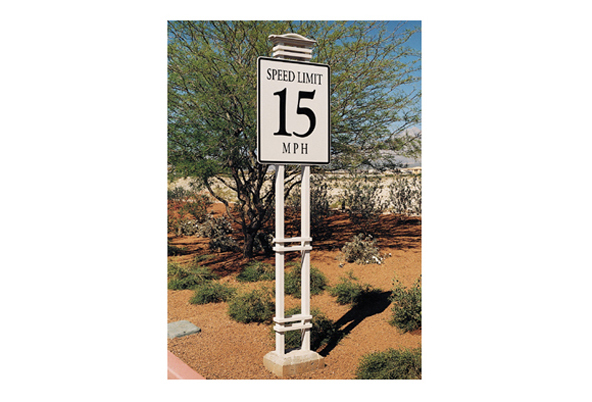 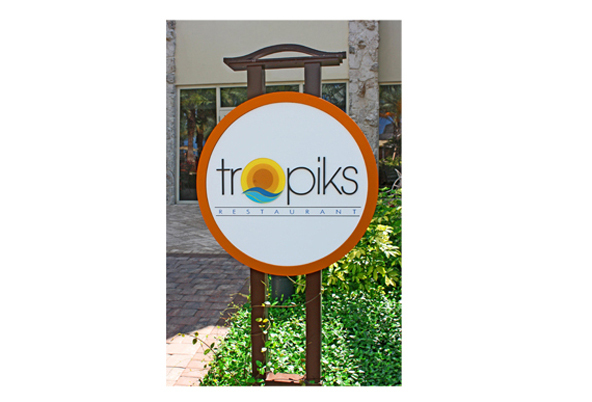 Clients have turned to us to provide signage with a superior level of design and craftsmanship. 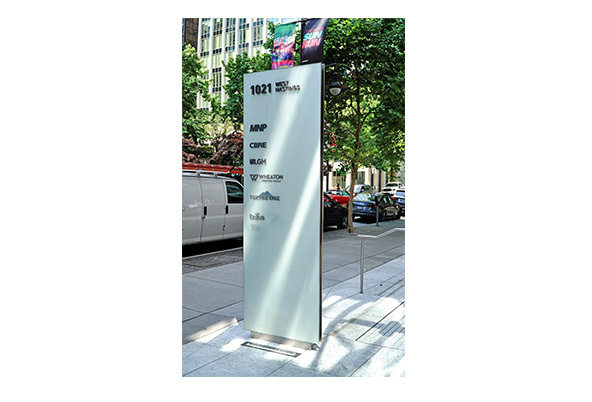 An office space that exemplifies sophistication and excellence in every architectural detail, this high performing (LEED Gold Certification) office building in the heart of downtown Vancouver, was a great project to be a part of. 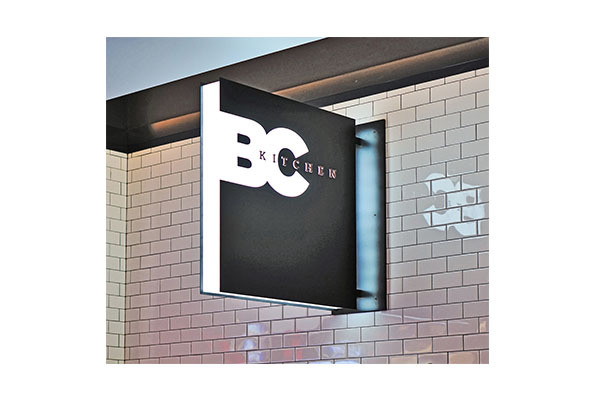 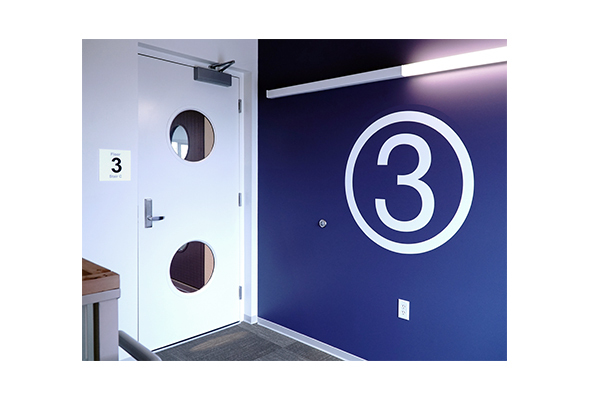 Collaborating with Kramer Design Associates, EEC fabricated and installed all aspects of interior and exterior signage. 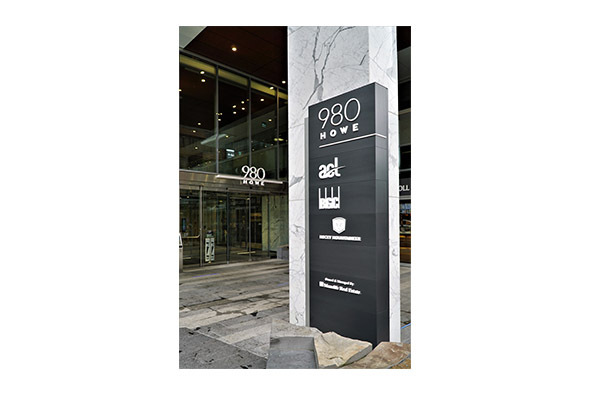 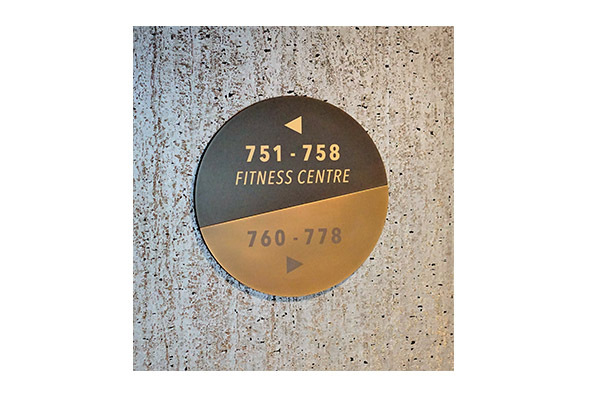 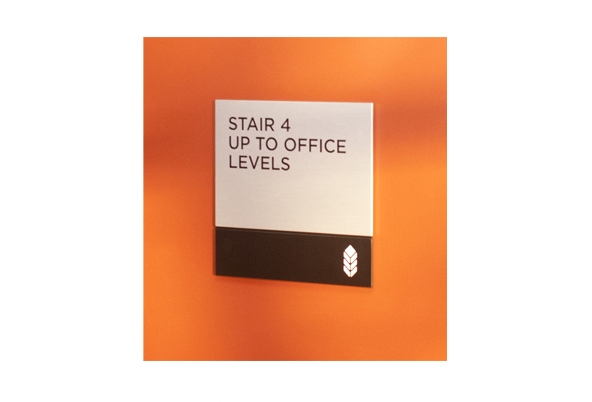 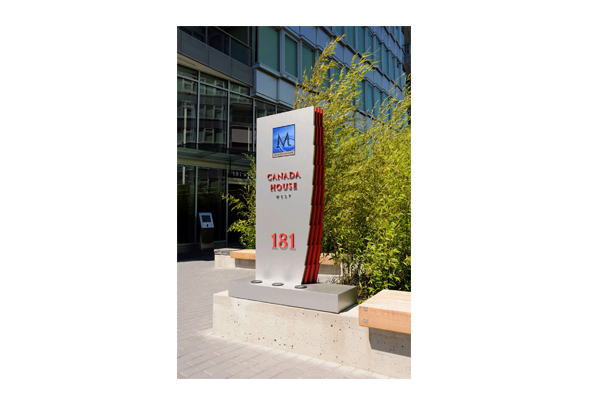 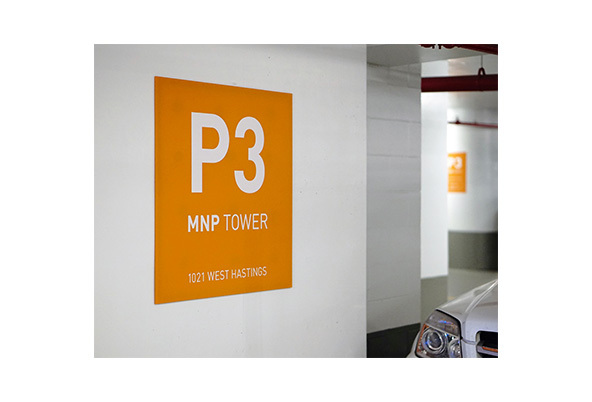 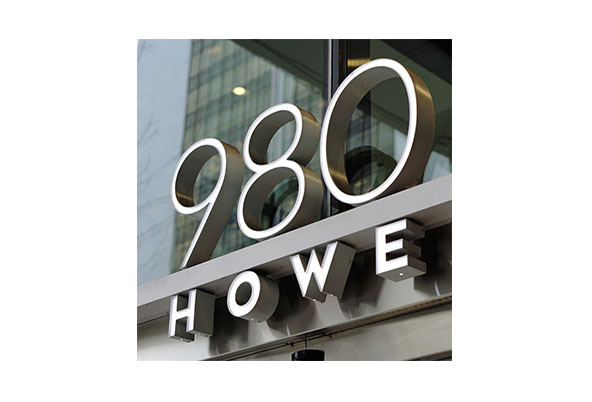 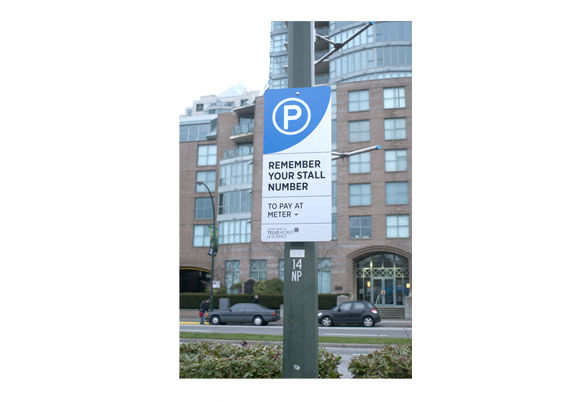 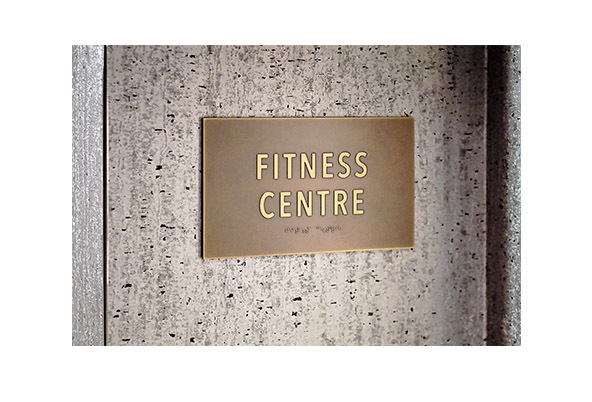 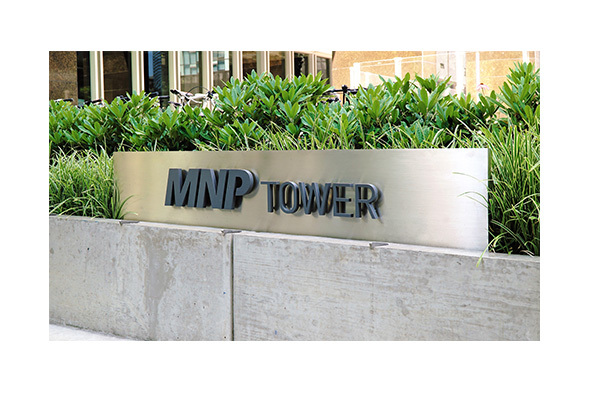 Another concerted design approach with Entro, the MNP tower in the business core of Vancouver’s harbour district, is an architectural landmark and the accompanying signage is second to none. 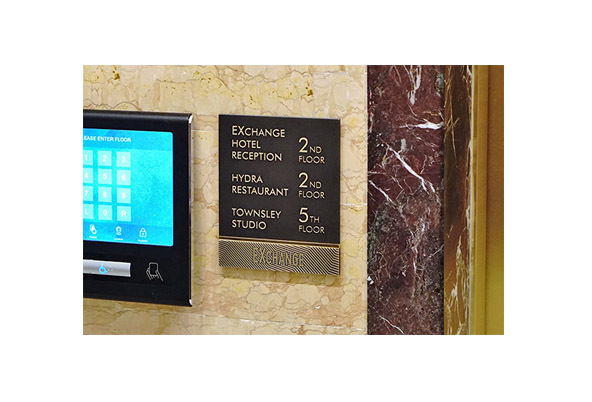 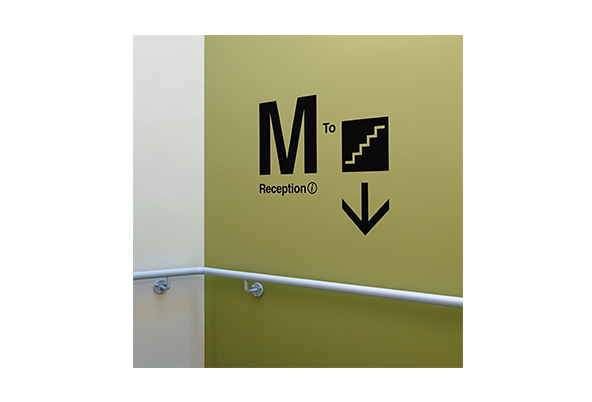 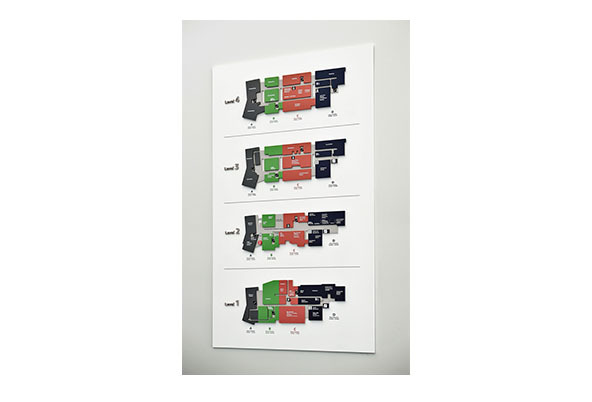 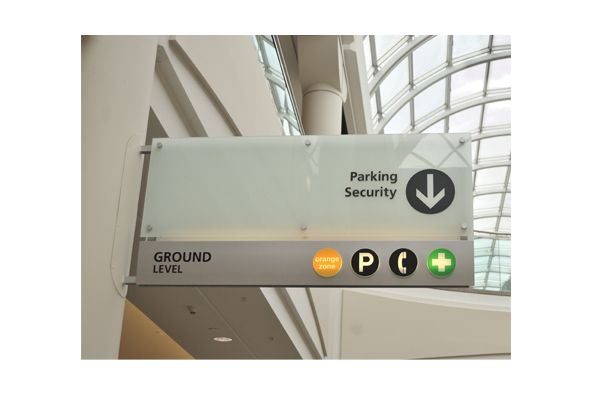 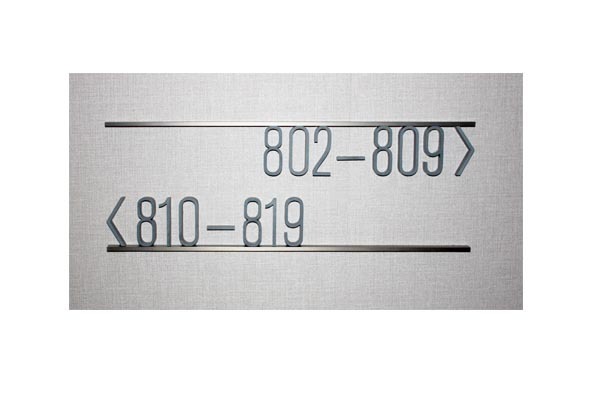 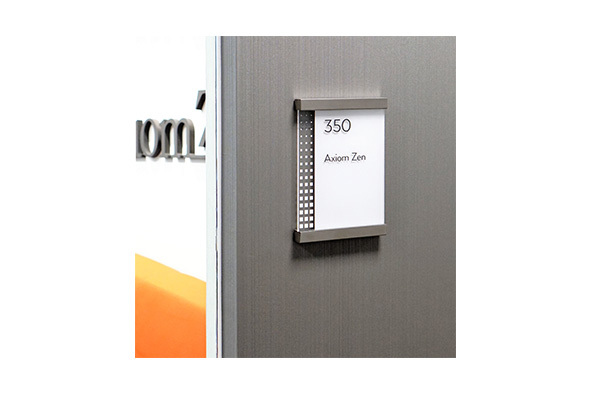 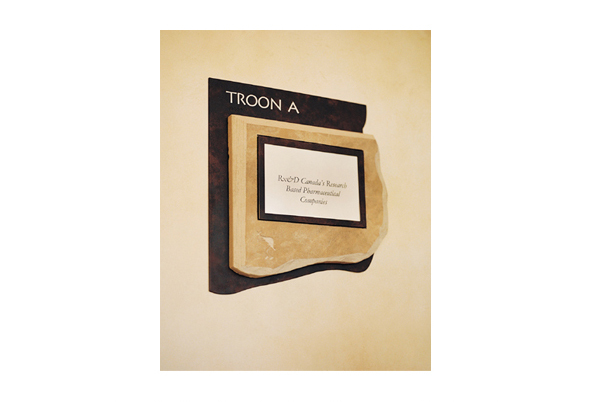 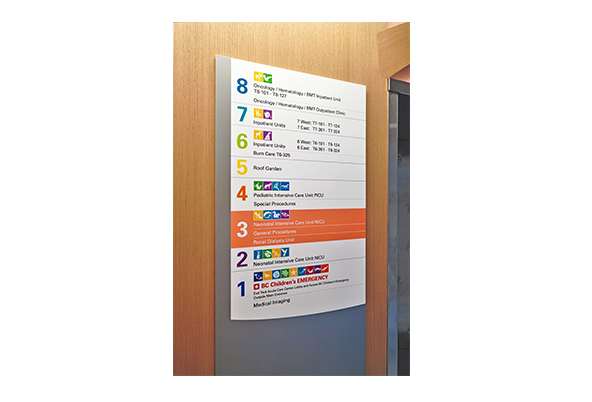 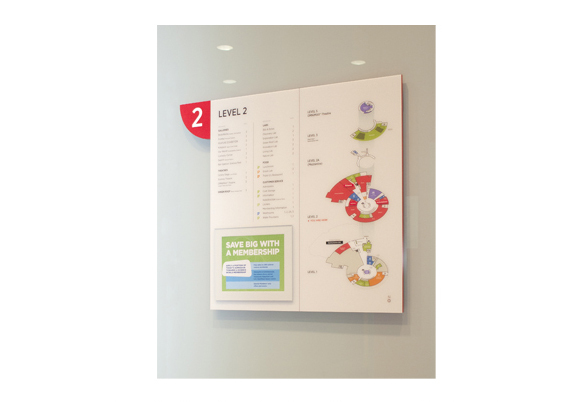 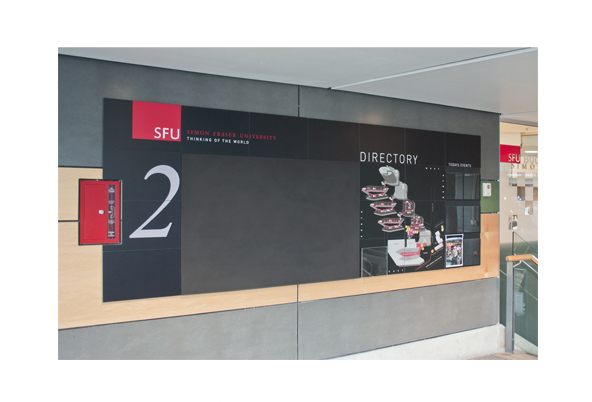 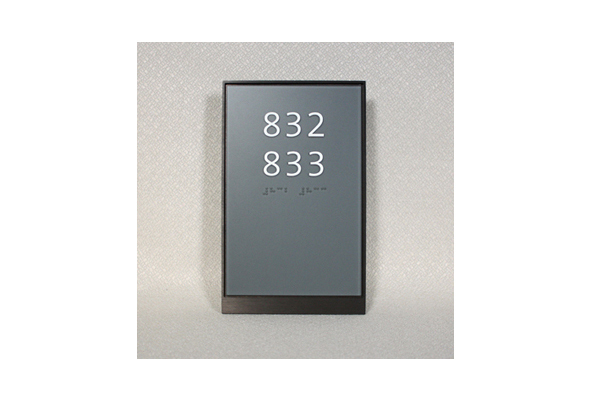 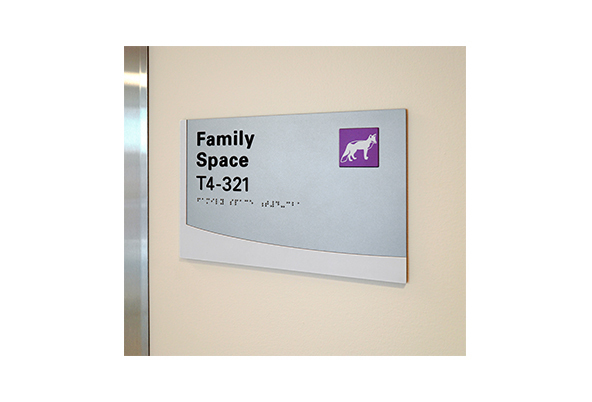 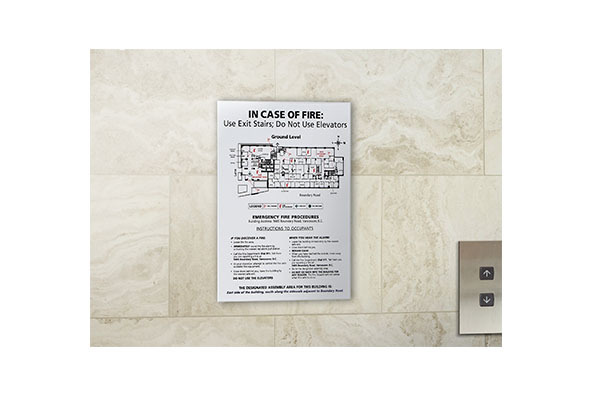 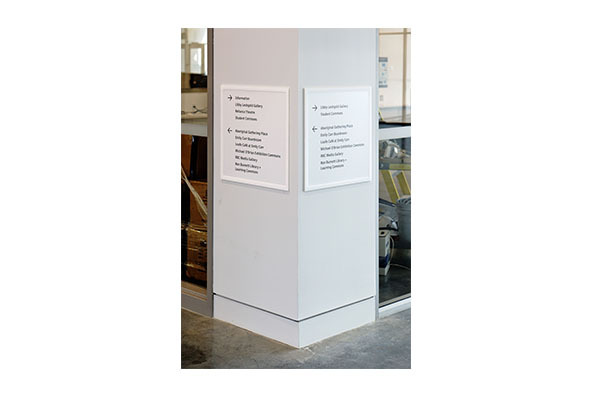 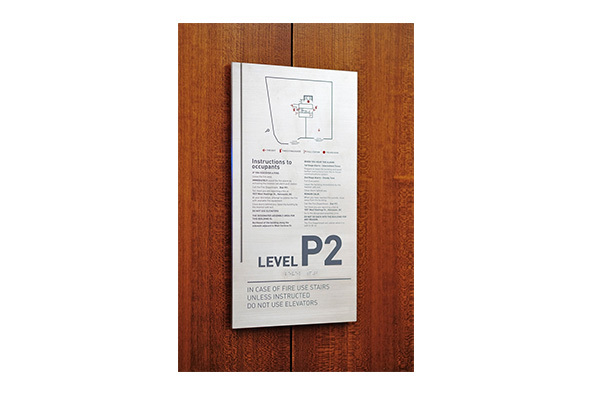 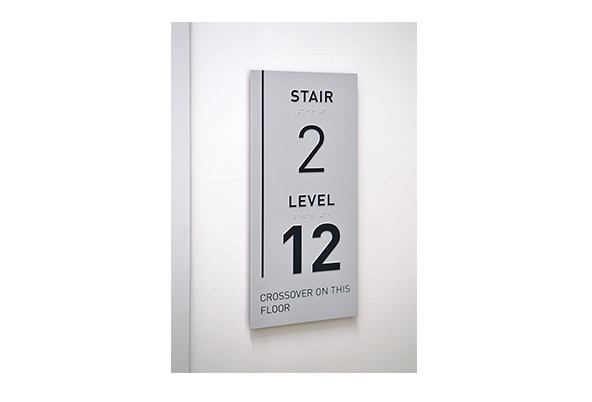 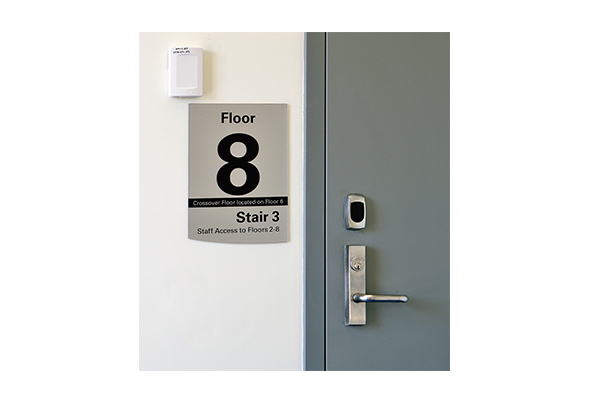 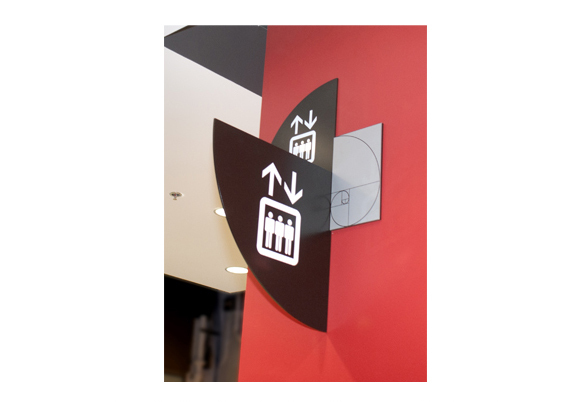 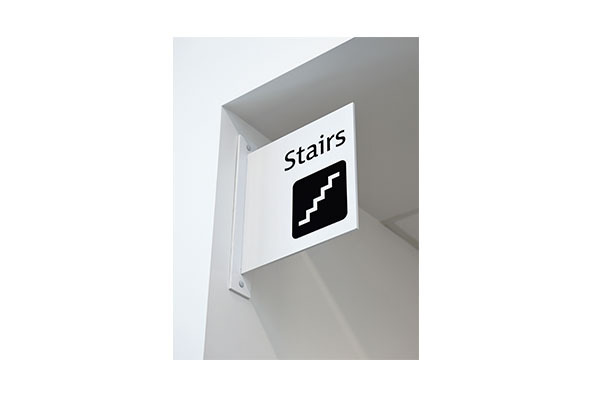 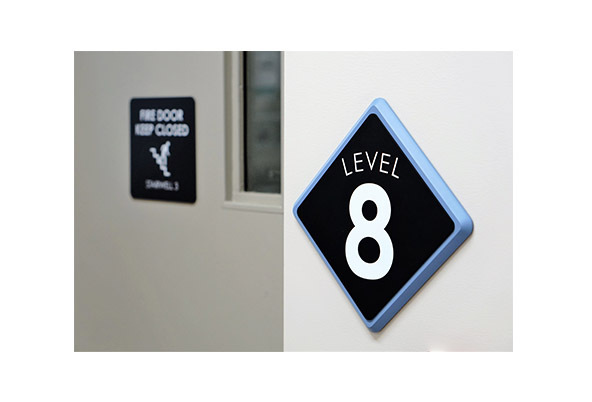 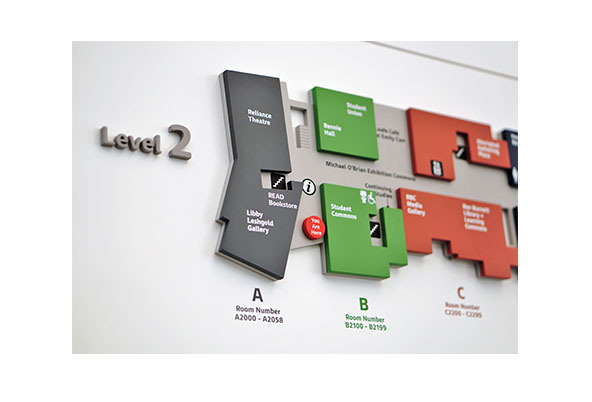 Sleek, trimmed down wayfinding and identification signage program was designed to match the contemporary structure. 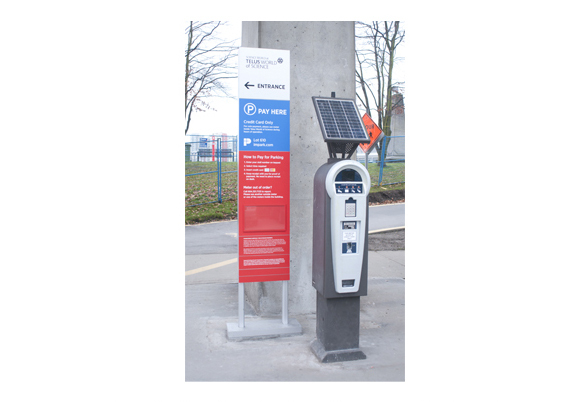 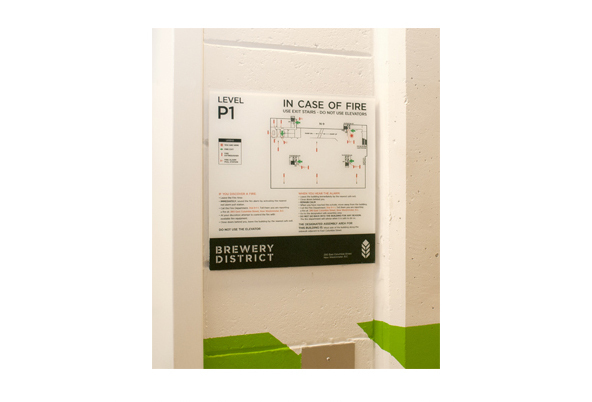 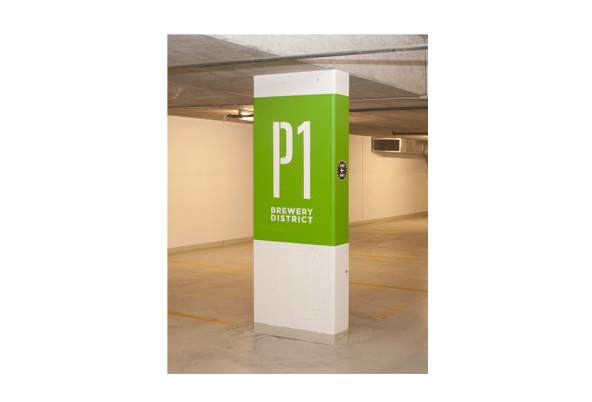 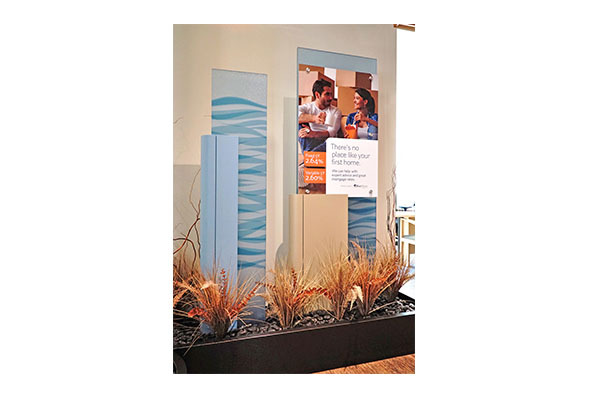 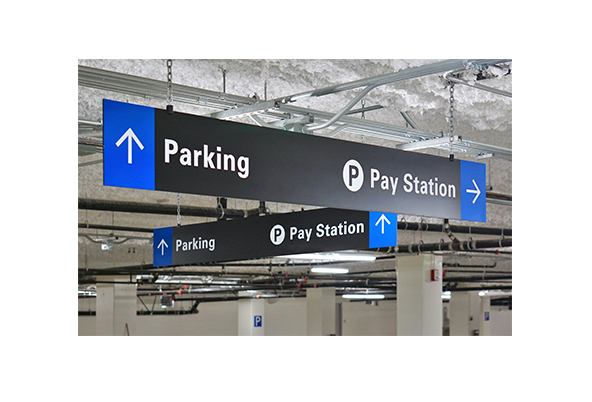 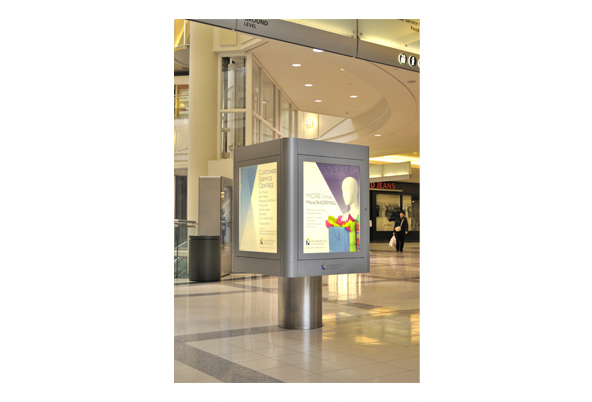 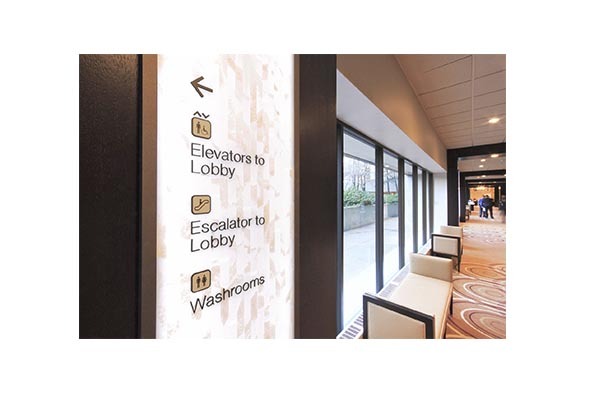 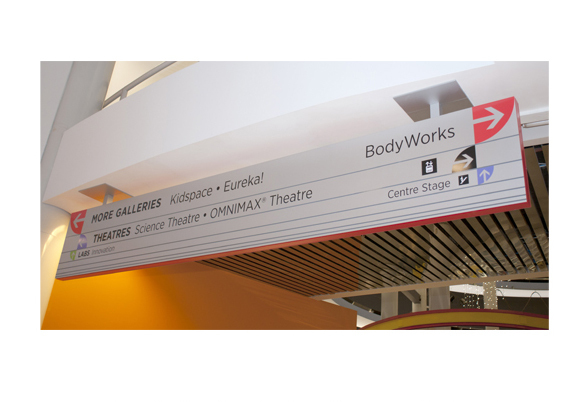 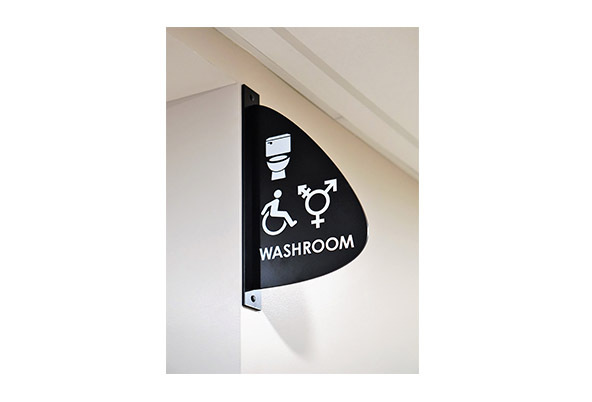 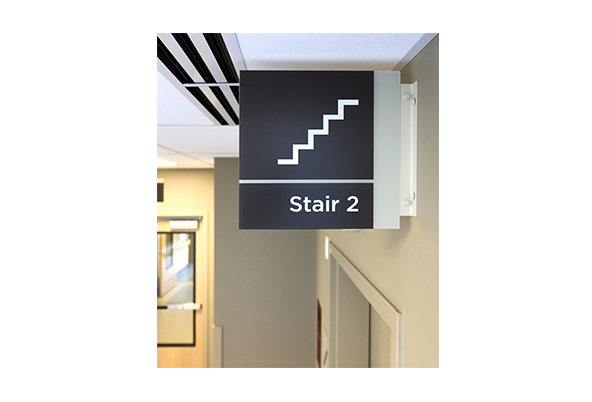 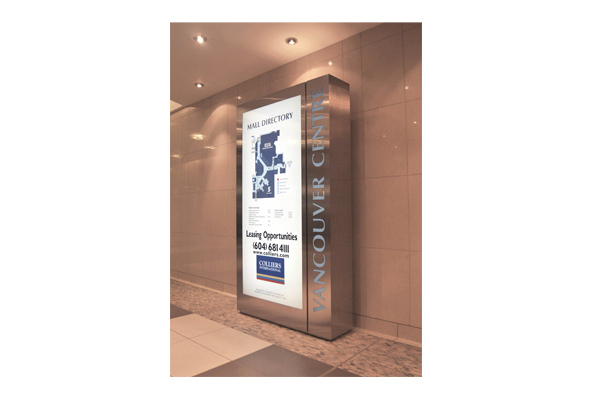 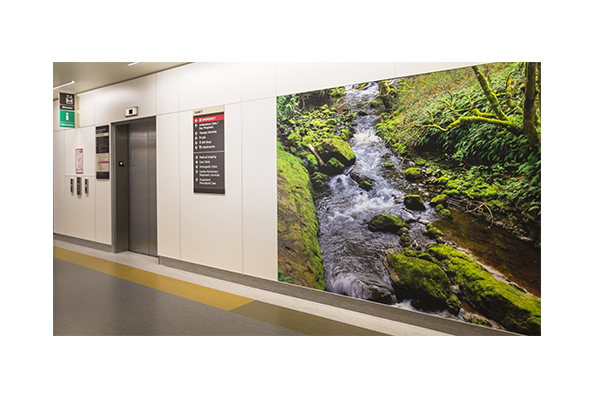 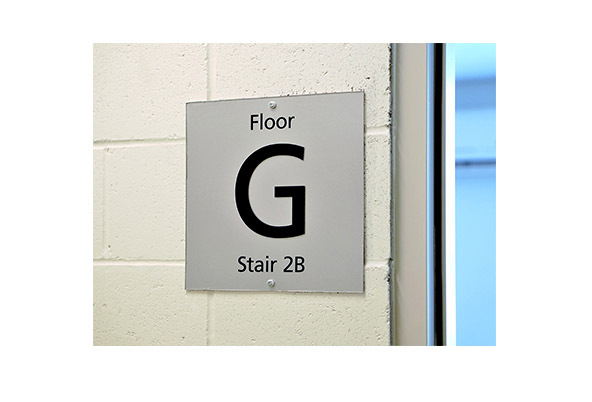 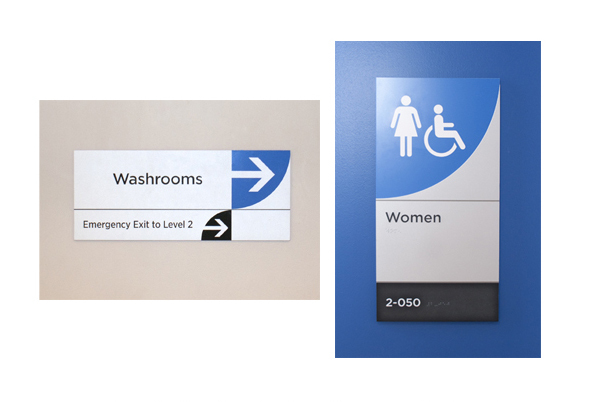 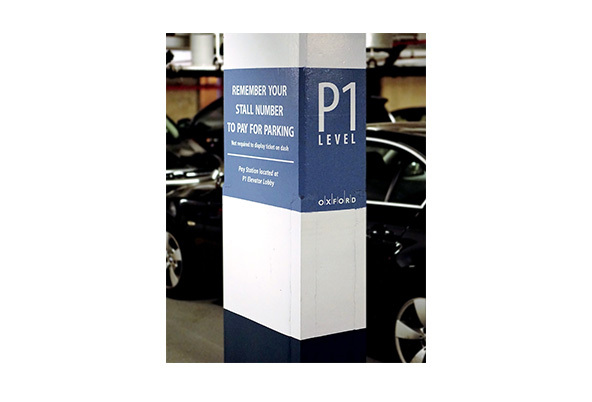 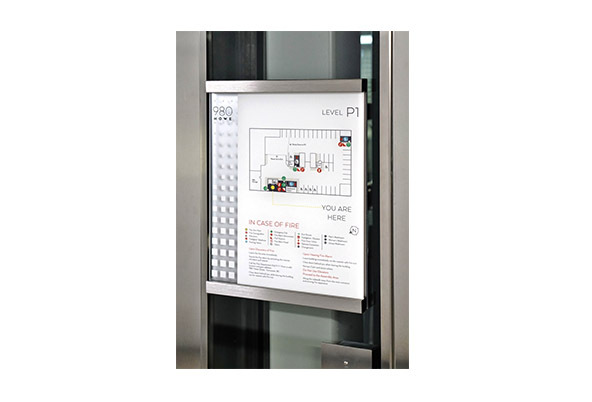 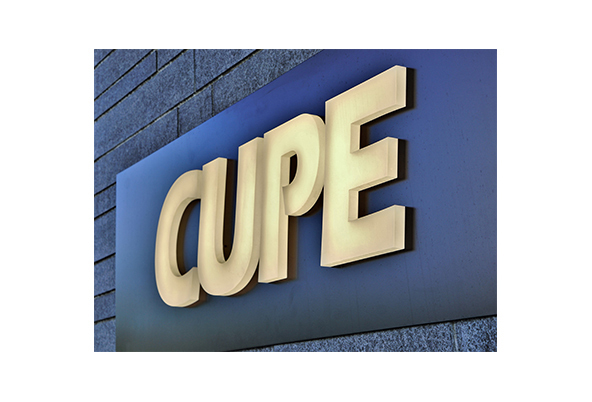 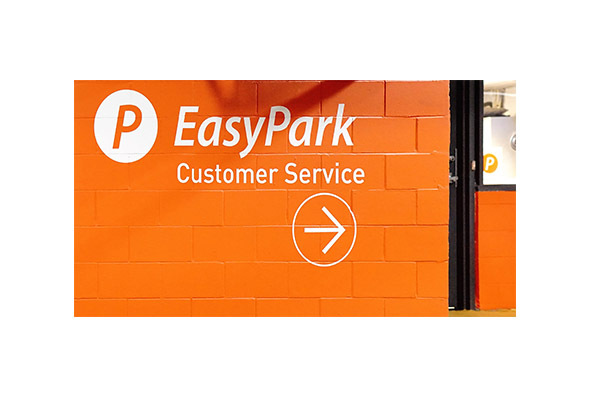 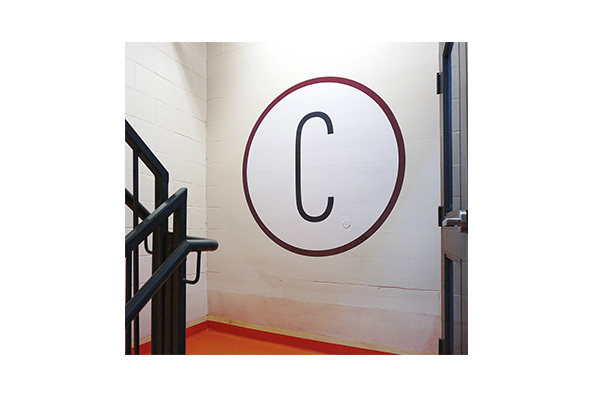 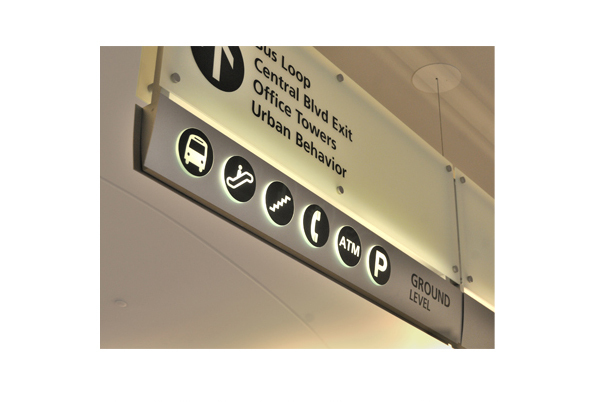 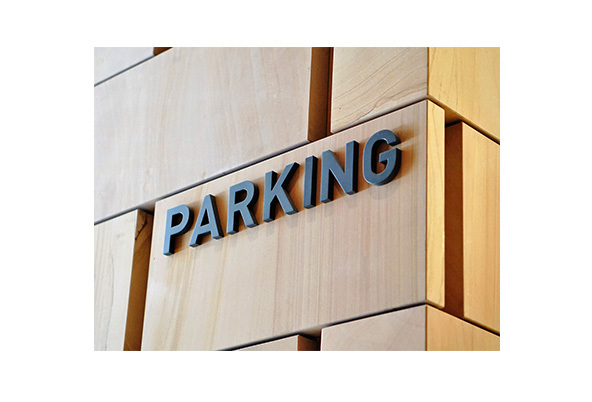 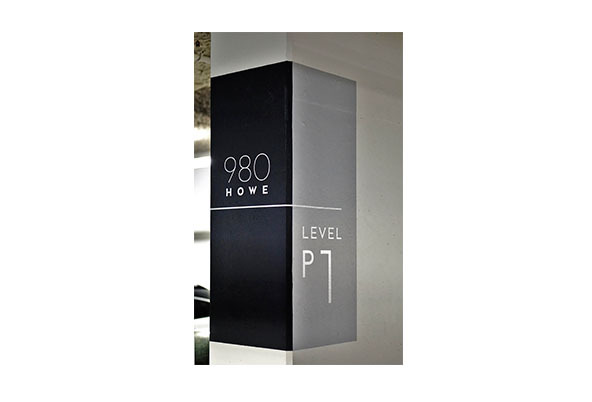 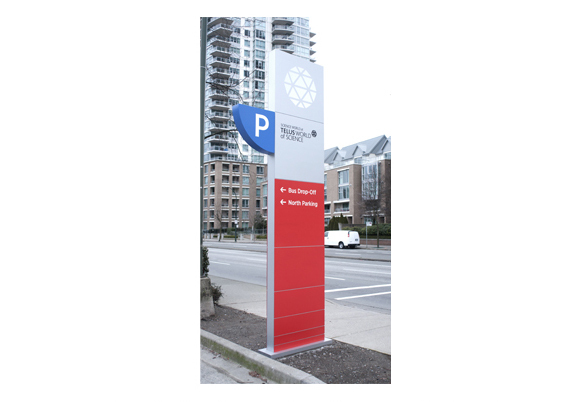 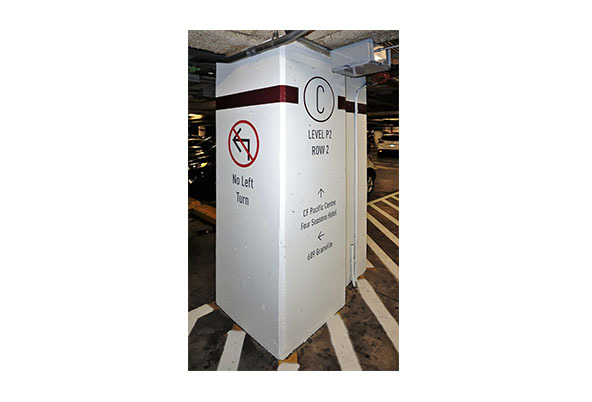 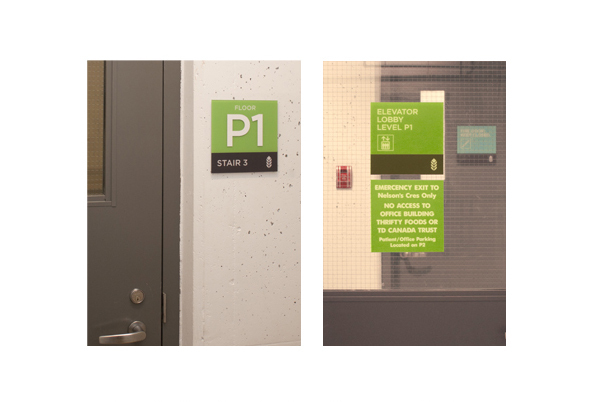 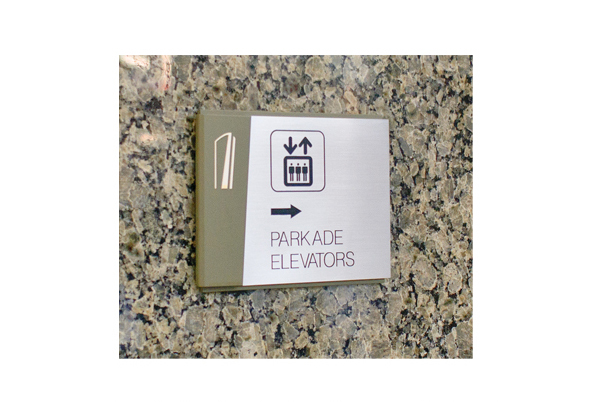 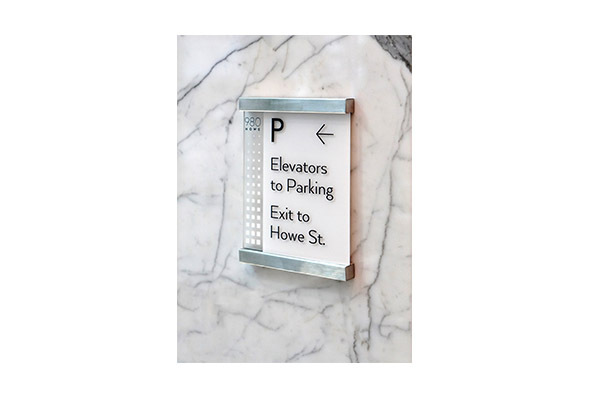 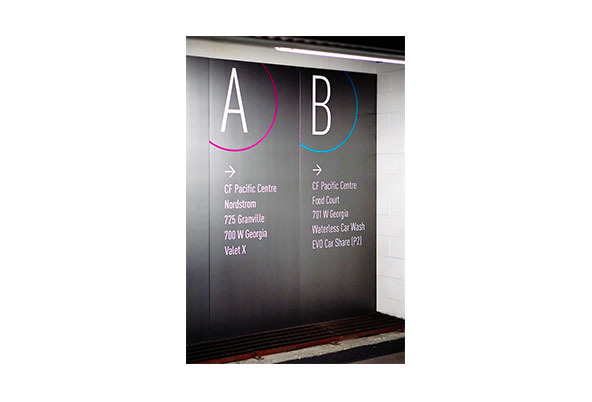 Working with Cygnus Design and Cadillac Fairview, we were engaged in a large-scale parkade wayfinding project. 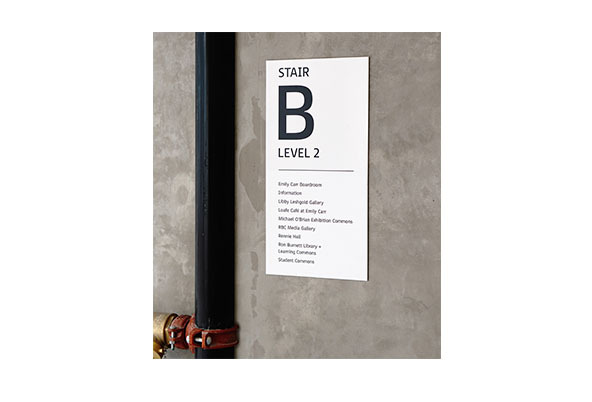 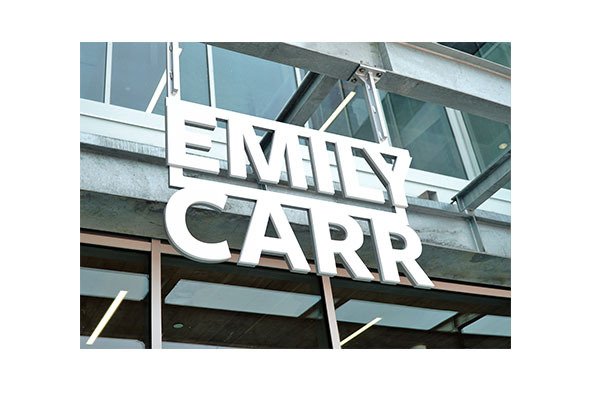 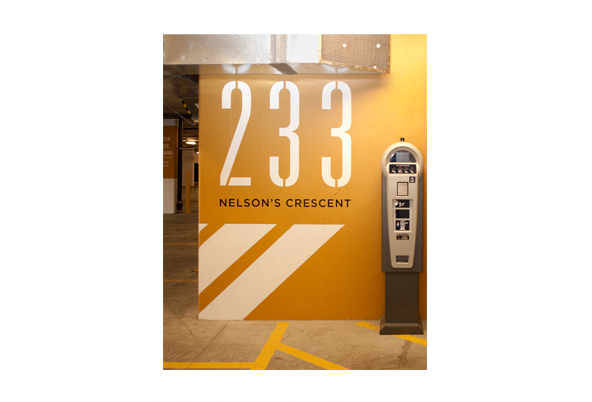 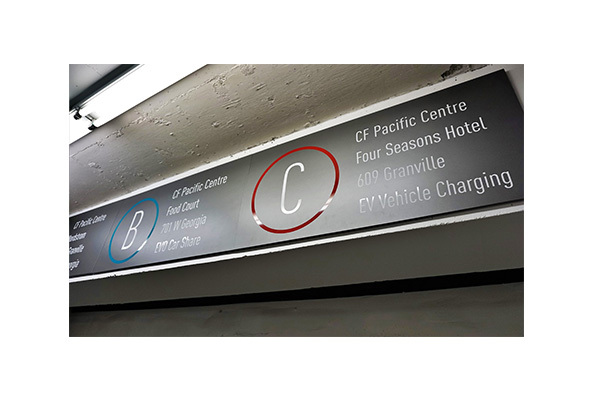 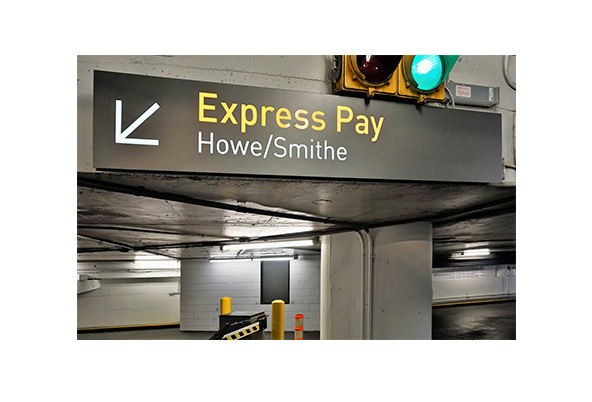 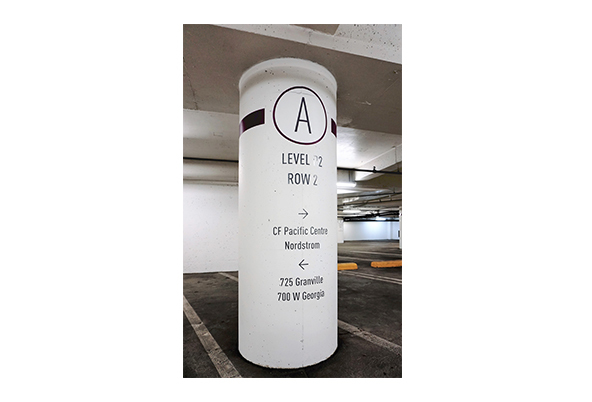 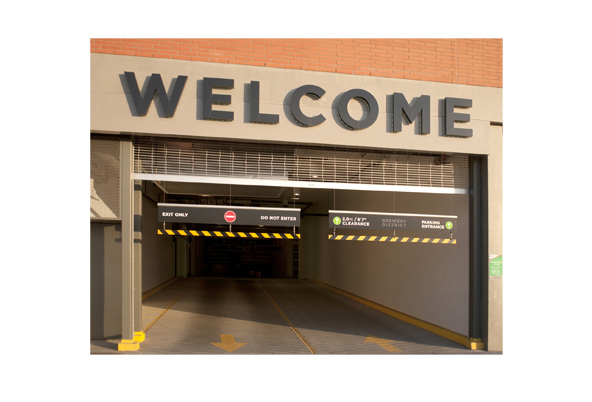 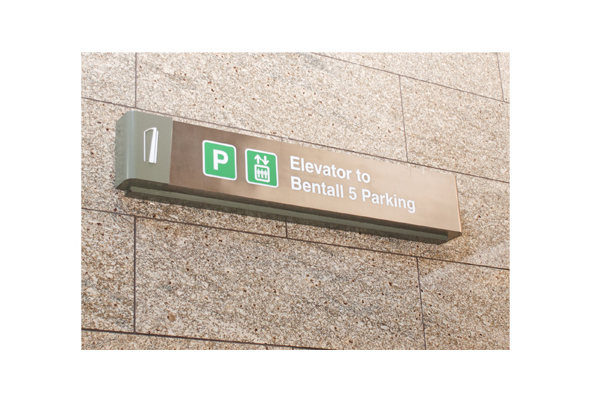 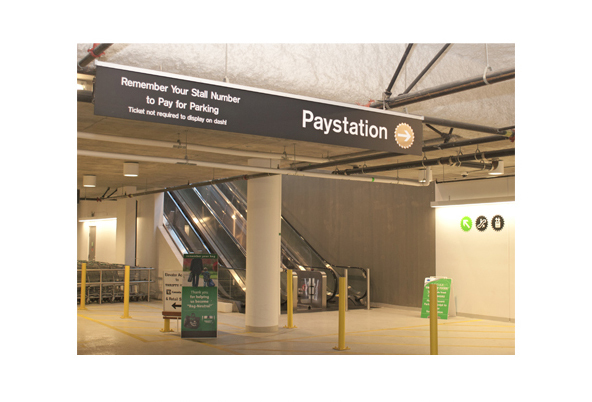 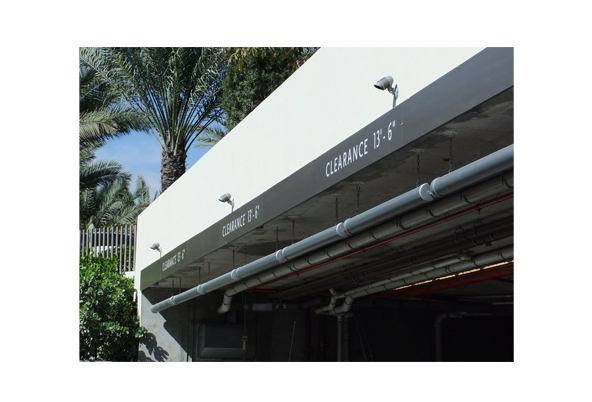 Using clean and modern looking fonts, EEC laid out a simple and effective wayfinding sign program for this newly renovated parking garage in downtown Vancouver. 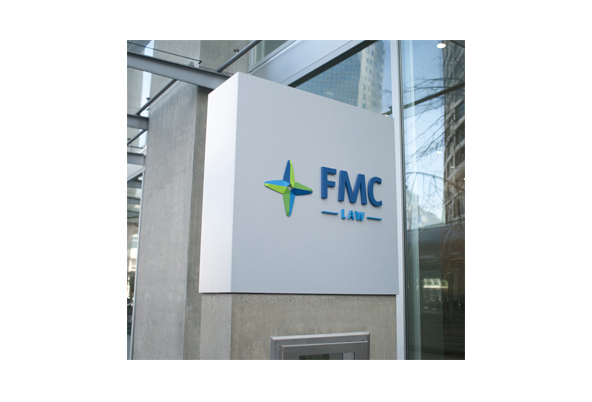 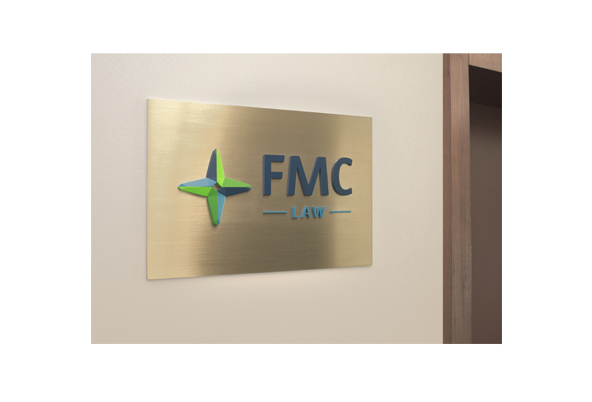 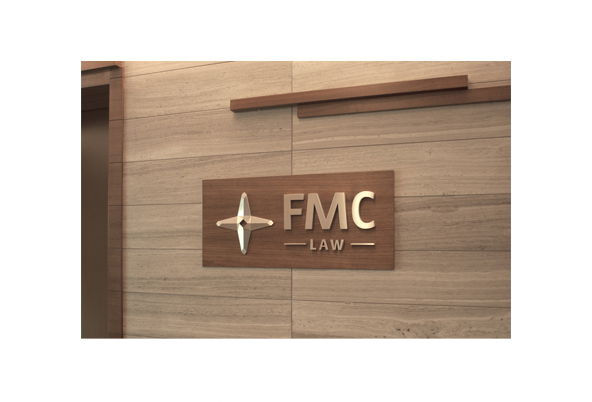 EEC Industries was brought in to create a comprehensive signage solution covering all FMC Law’s building and office signs. 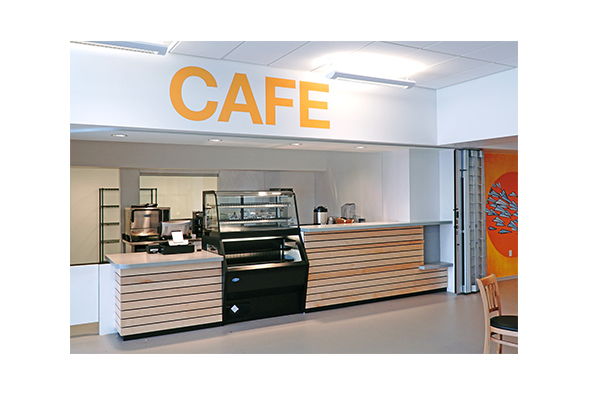 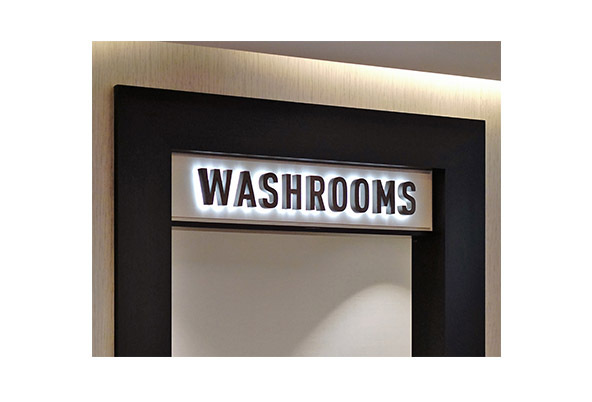 The project included interior and exterior signs that were supplied and installed by our team of professionals, meeting and exceeding the design specifications provided. 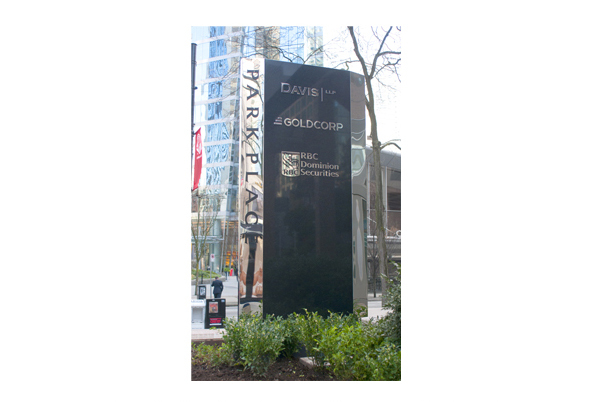 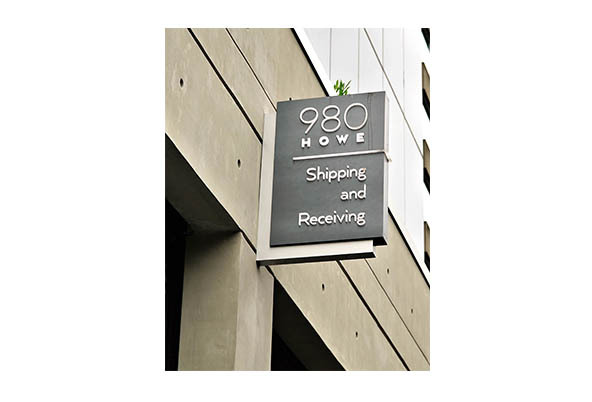 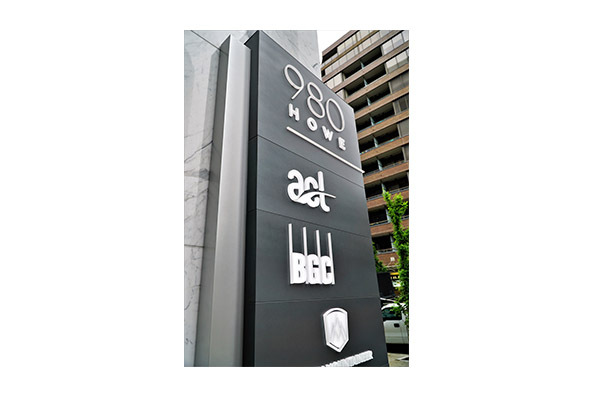 EEC Industries engineered, manufactured, and installed a series of outdoor office signs, including a custom monument sign fabricated from stainless steel and black granite to mark the major downtown office tower. 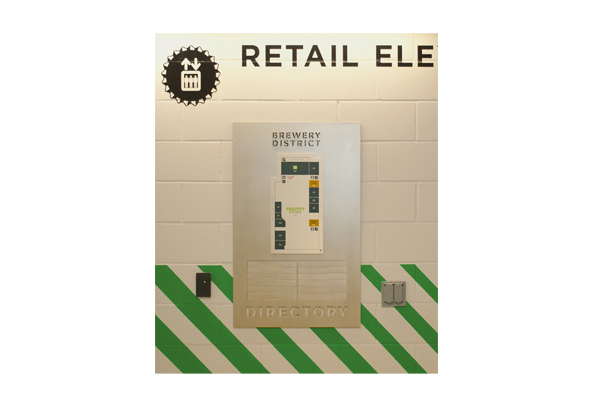 An impressive retail/office development by WesGroup, the Brewery District is comprised of a retail component and two medical/dental office complexes. 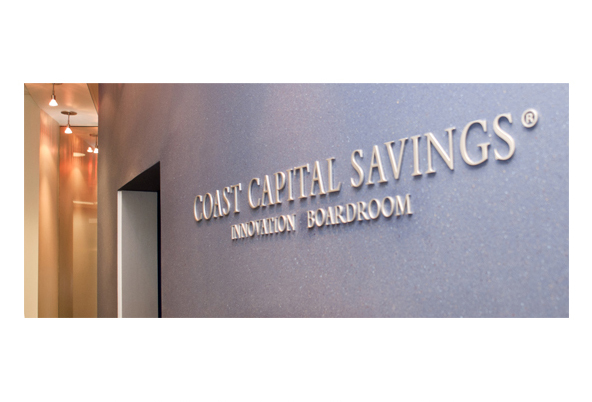 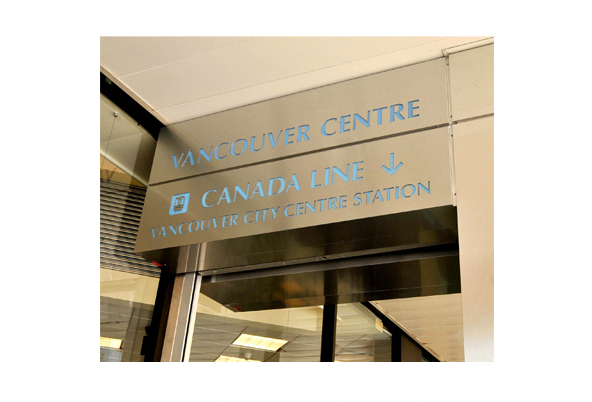 EEC Industries provided all the interior and exterior signage for the project, including custom illuminated signs, channel lettering, wayfinding signage, parkade signage, and vinyl wall graphics. 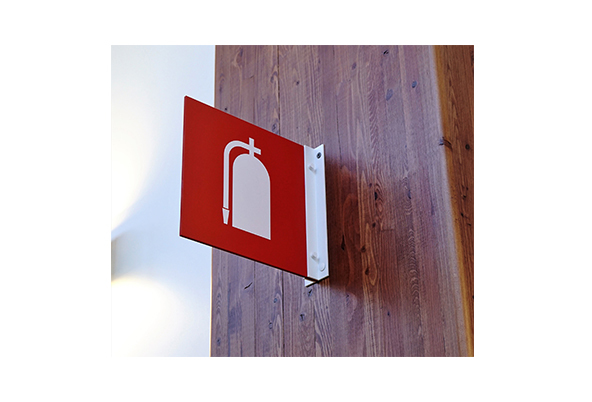 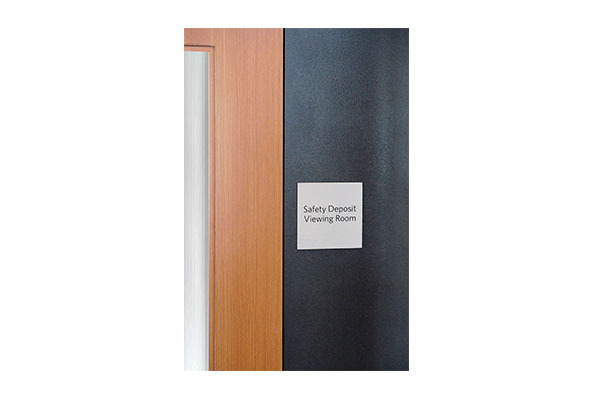 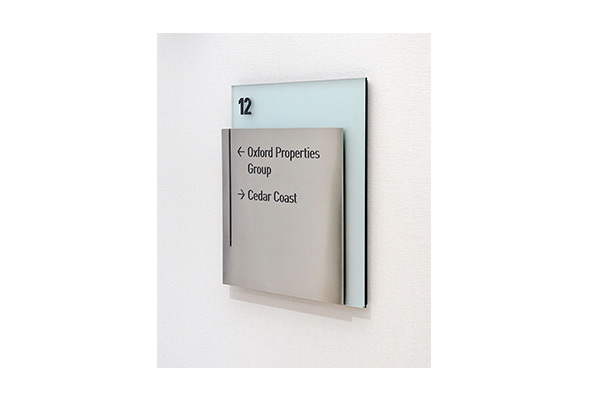 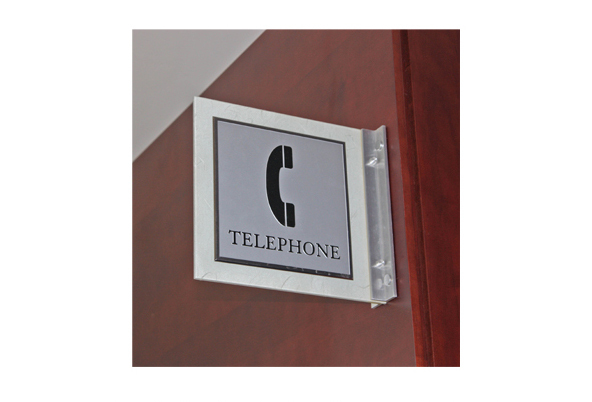 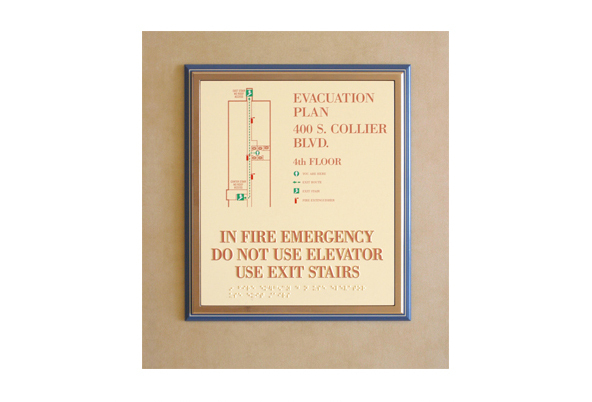 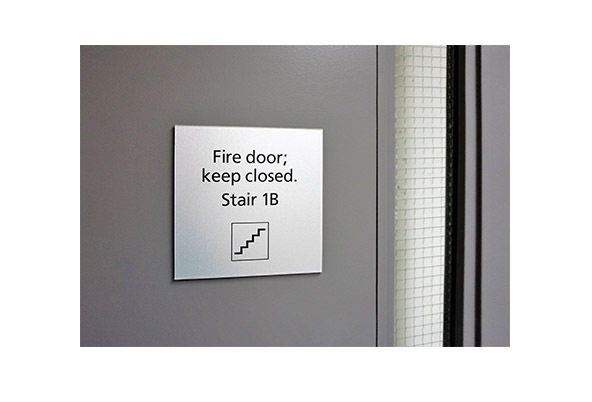 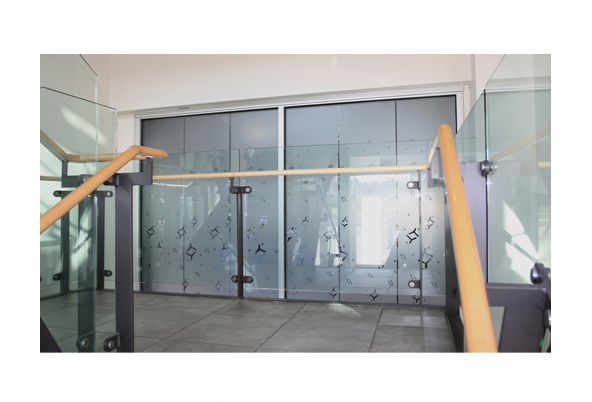 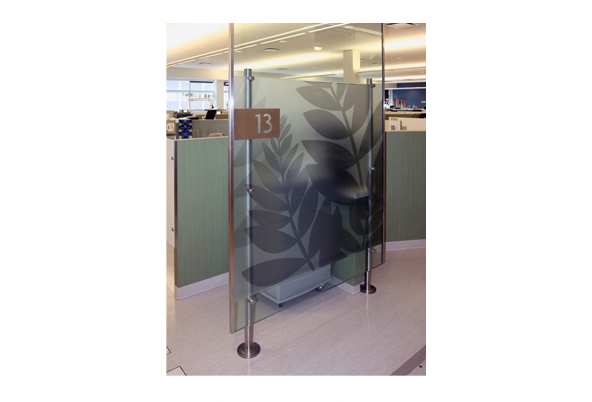 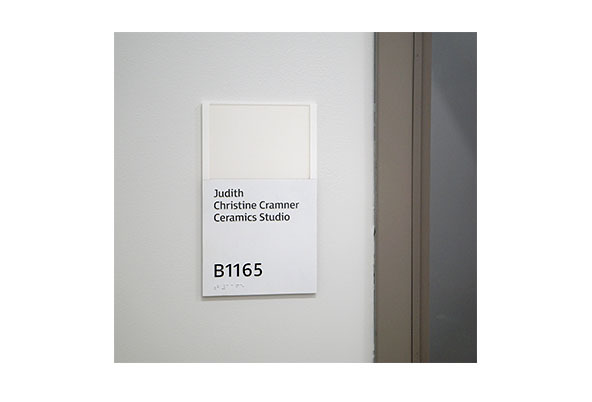 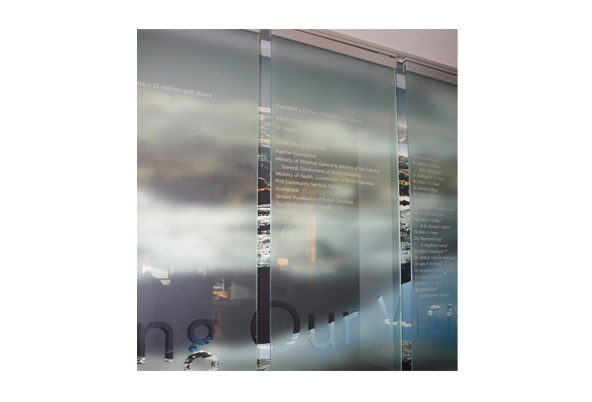 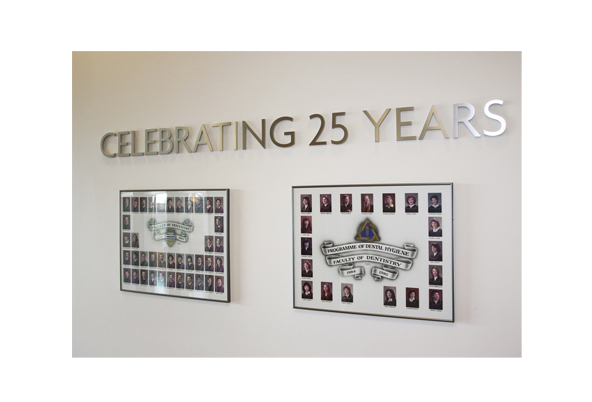 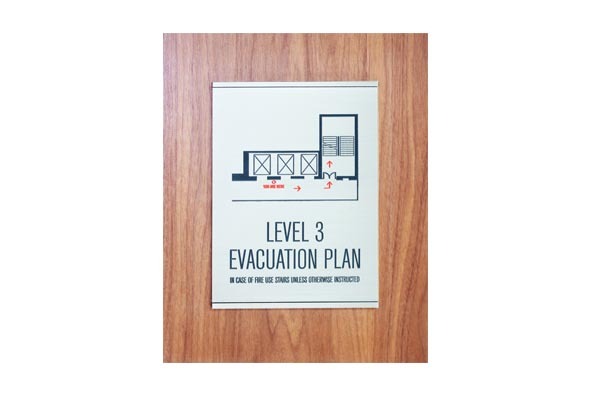 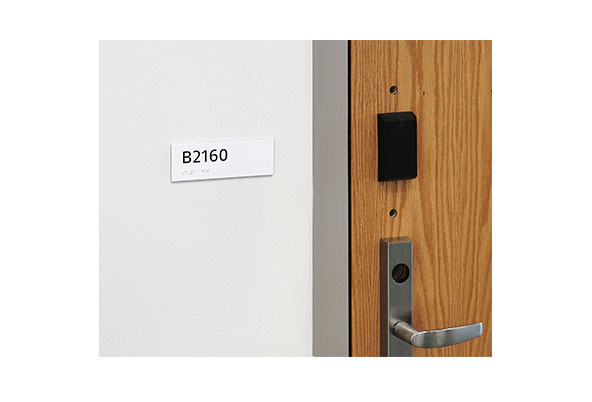 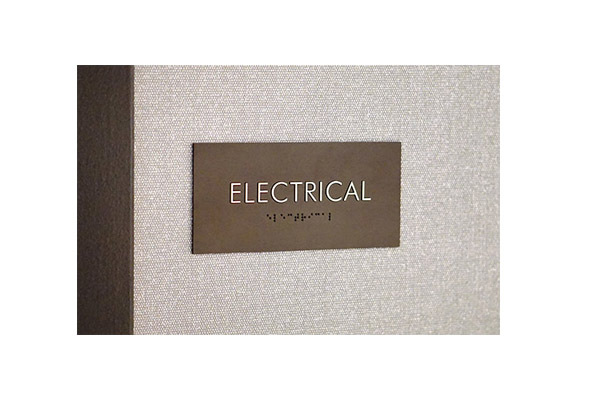 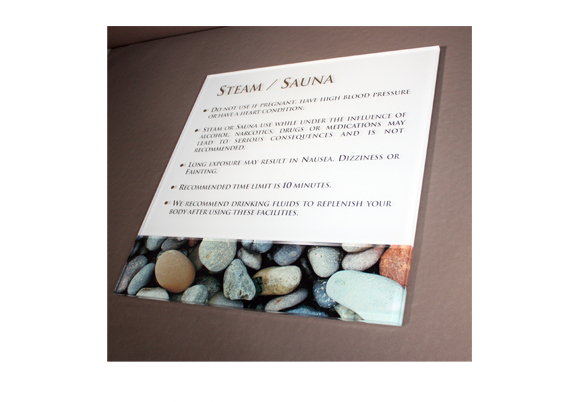 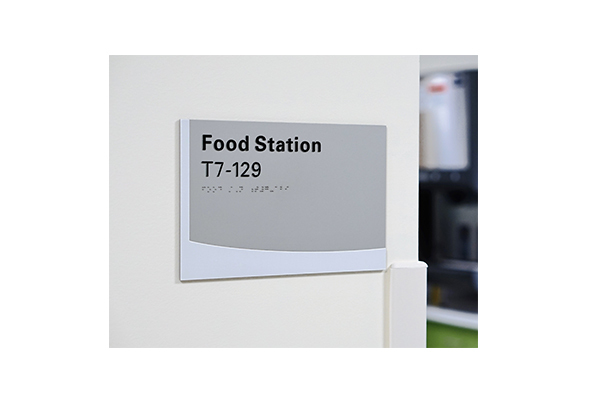 EEC Industries provided interior office signs manufactured to existing brand specifications. 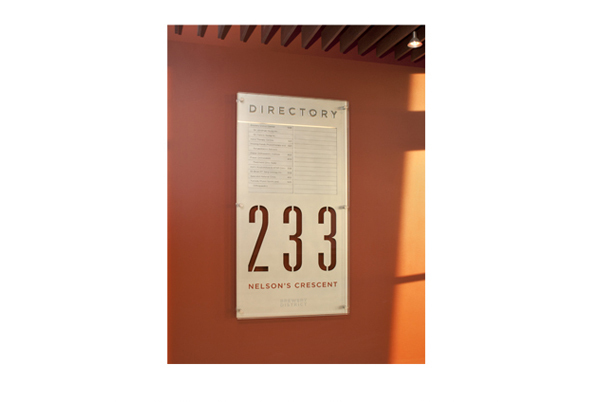 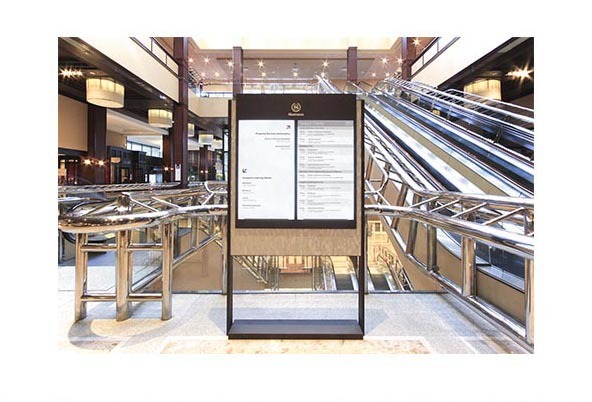 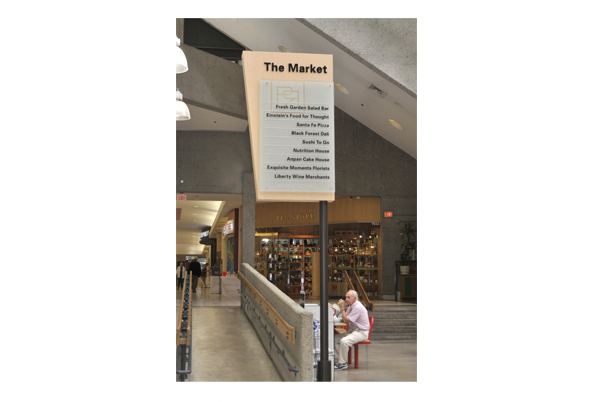 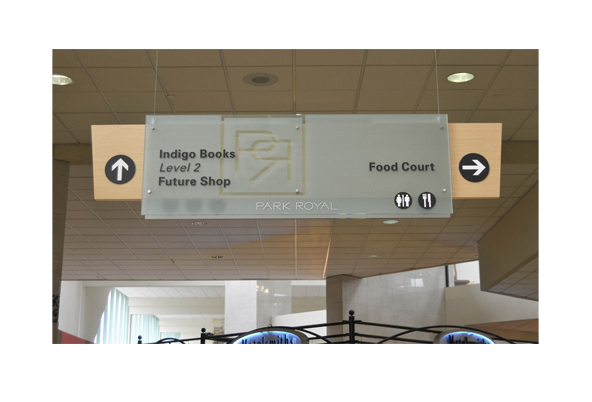 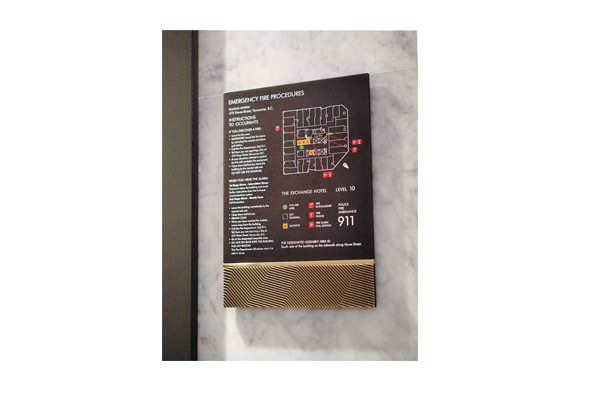 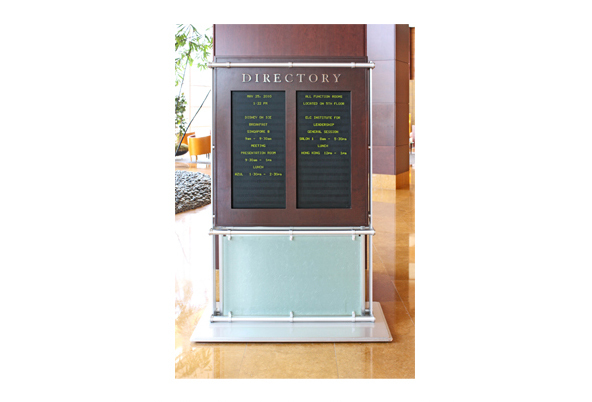 The project included the main lobby directory sign (a non-illuminated glass and aluminum blade system), floor directory signs (acrylic and stainless steel blade system) and all necessary wayfinding and code required signage. 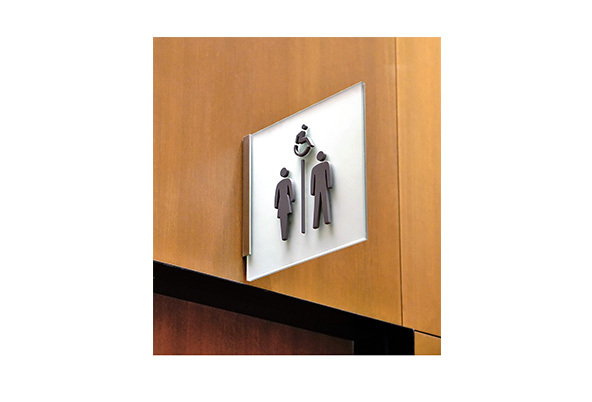 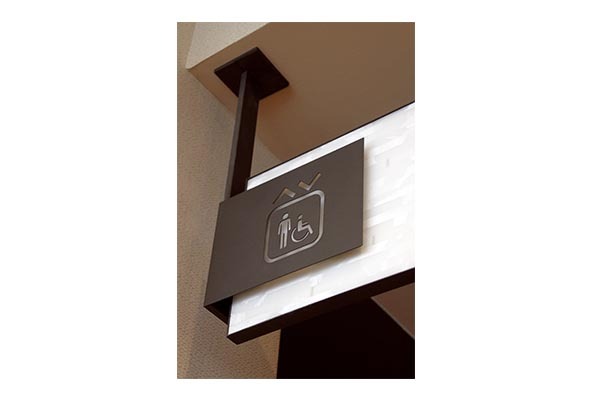 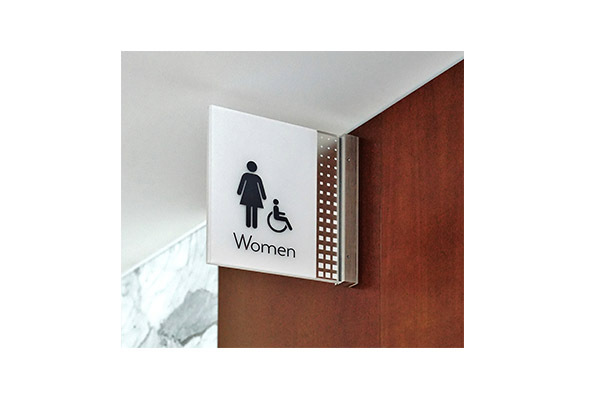 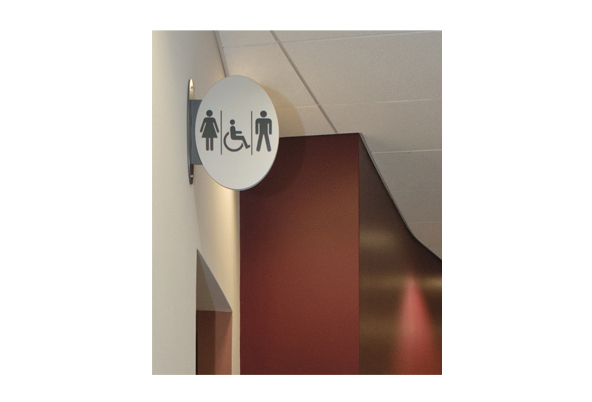 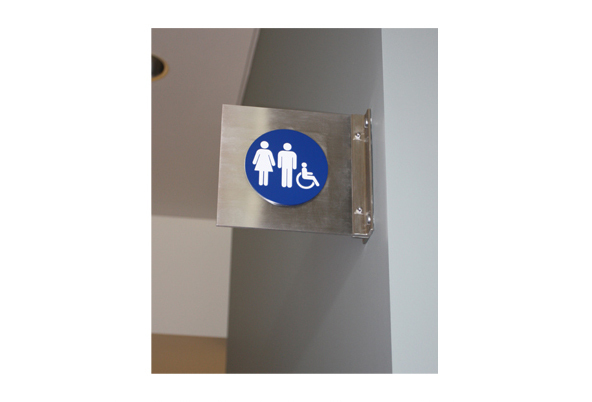 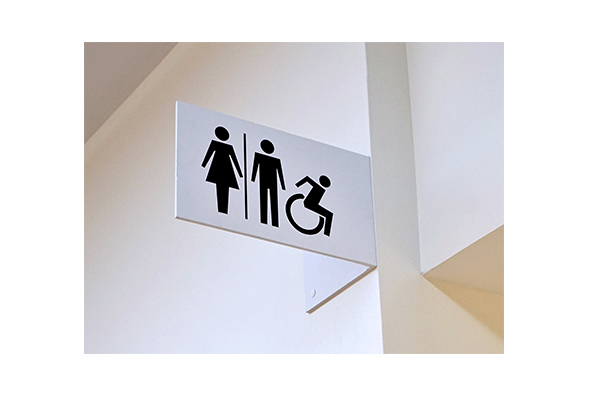 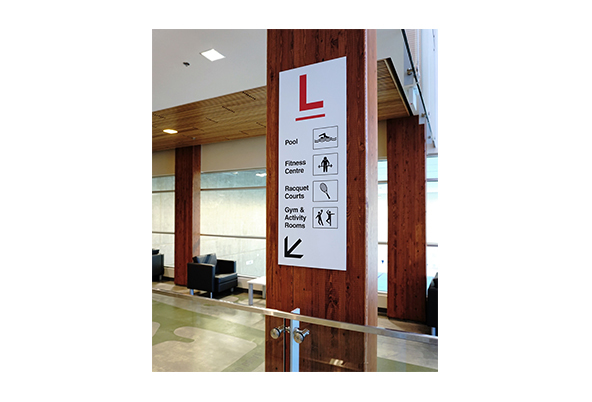 EEC has worked on many large-scale institutional projects looking for signage that strikes a balance of unique design with high functionality. 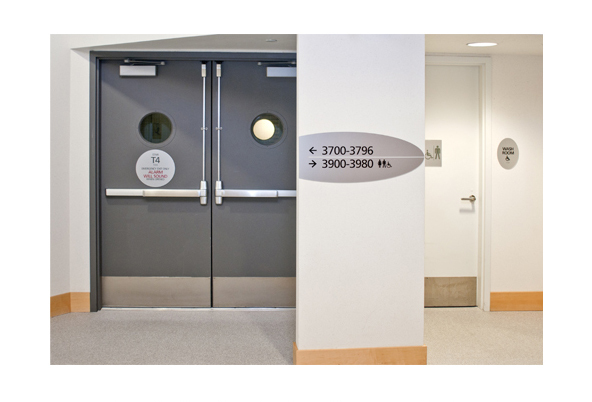 The new centre is not only replacing older infrastructure, but is an integral part of British Columbia’s health care system dealing with complex obstetrical cases and caring for the most seriously ill children. 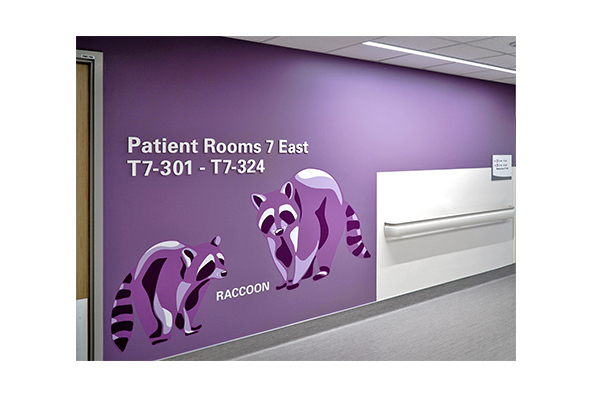 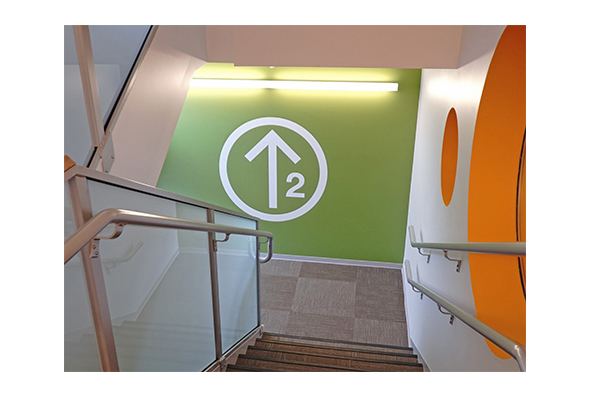 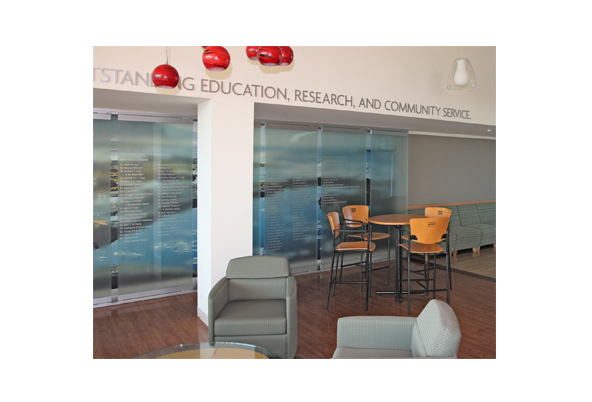 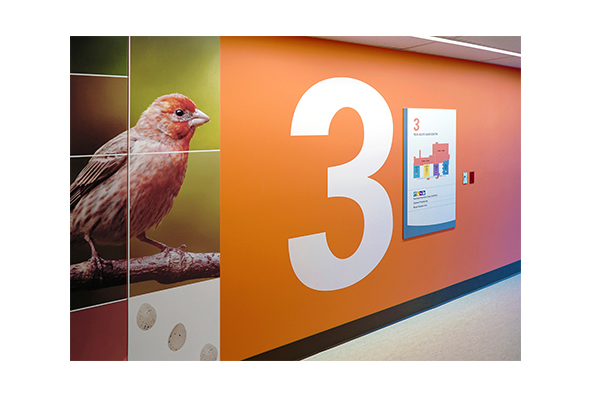 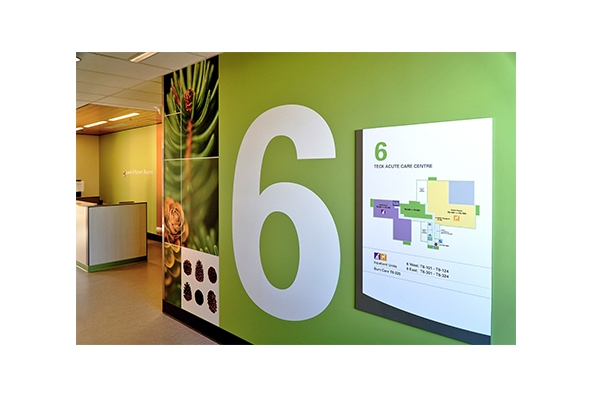 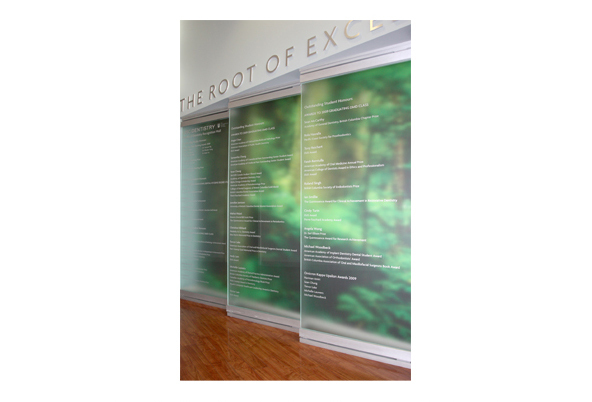 EEC was contracted to do all aspects of interior and exterior signage including the wayfinding sign program, donor walls, and large-scale vinyl wall graphics. 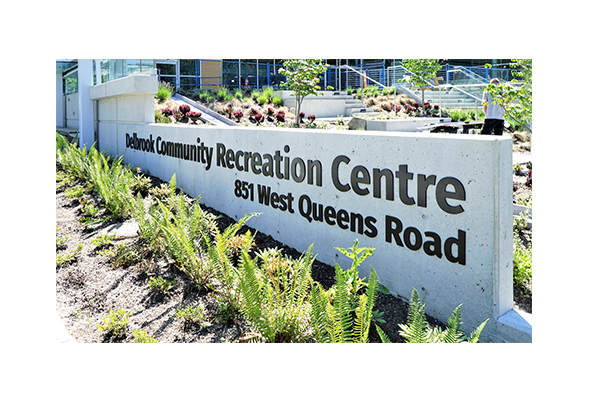 A new state of the art recreation facility to replace two aging recreation commission buildings in North Vancouver. 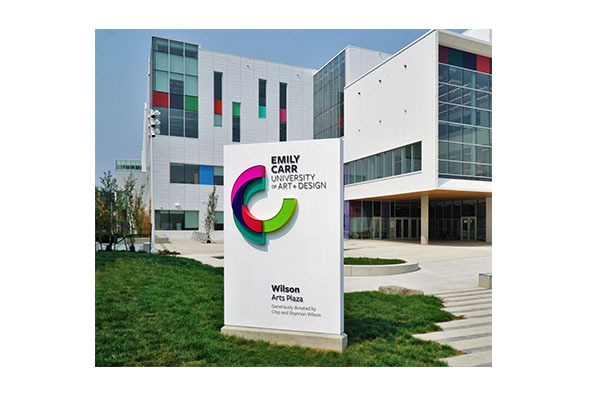 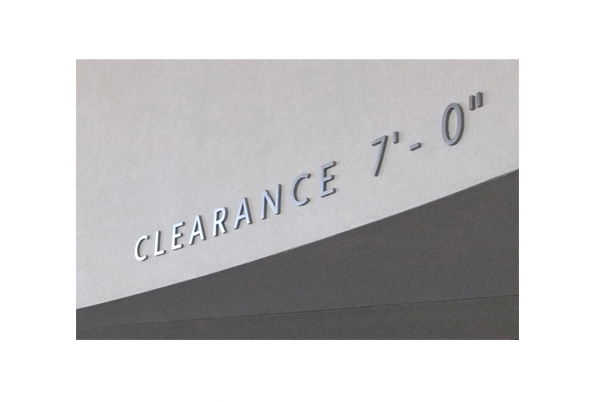 All facets of signage were the responsibility of EEC and with a specific, collaborative design approach with CIA Architecture, a fun and modern sign program was installed. 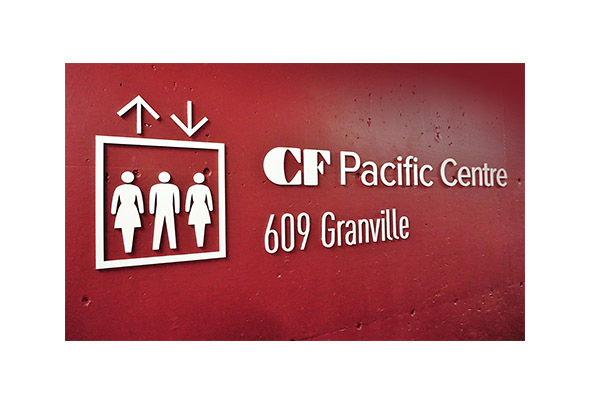 The Pacific Autism Family Network (PAFN) is a Centre of excellence and network of supports for individuals with Autism Spectrum Disorder and their families across the province of British Columbia. 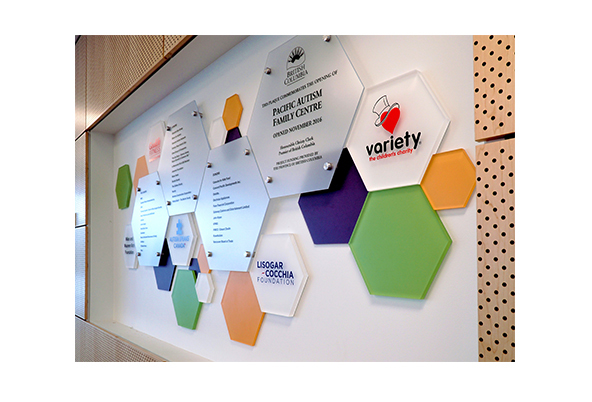 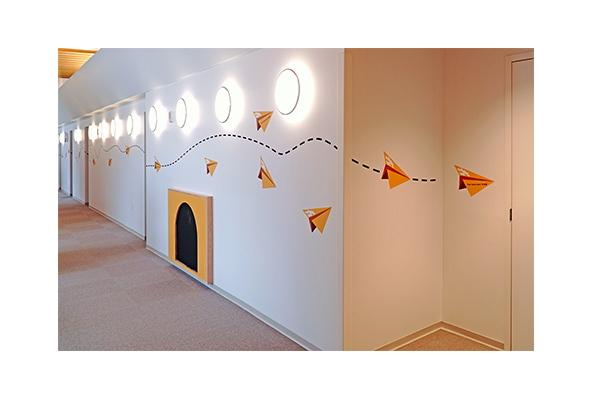 This was a special and unique project with an impressive vinyl/acrylic ‘paper airplane’ wall graphic throughout the entire building as well as the offset hexagonal donor wall. 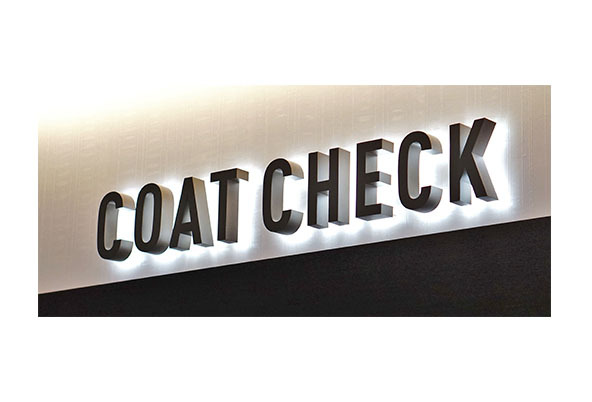 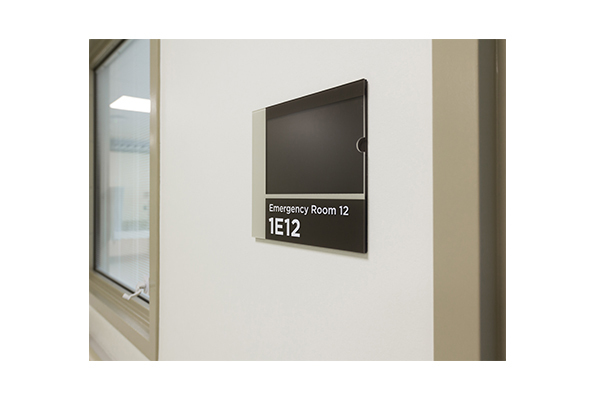 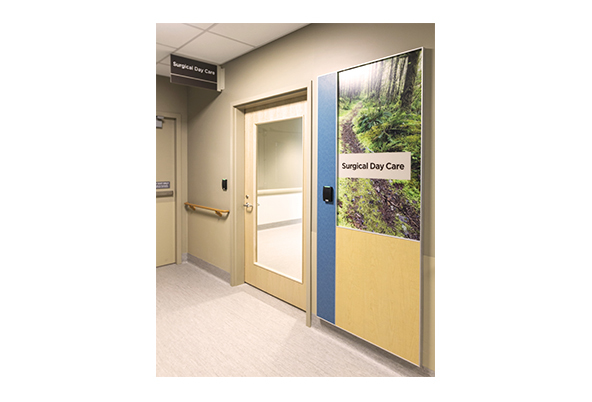 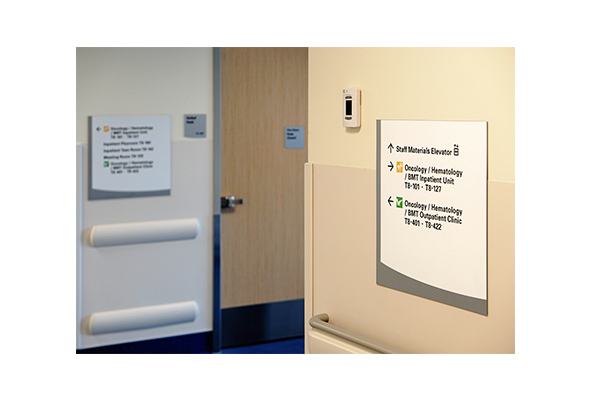 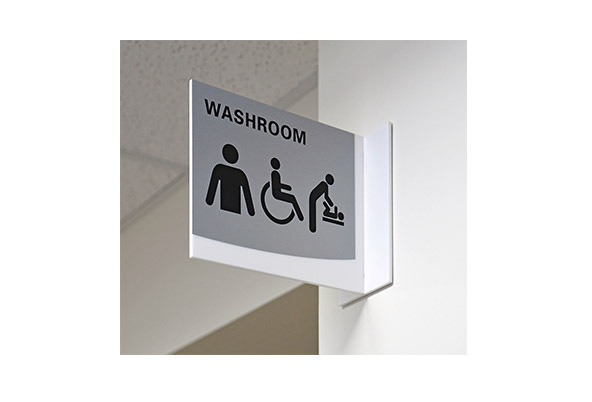 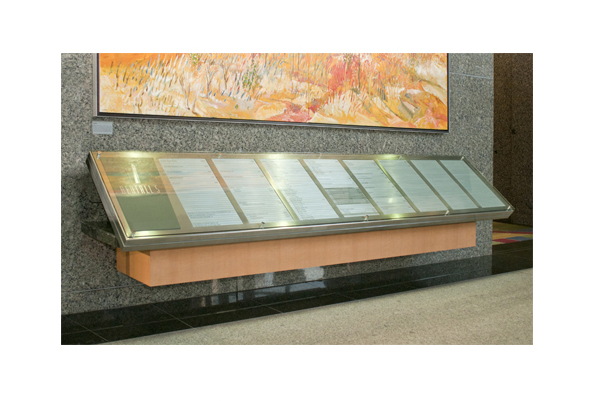 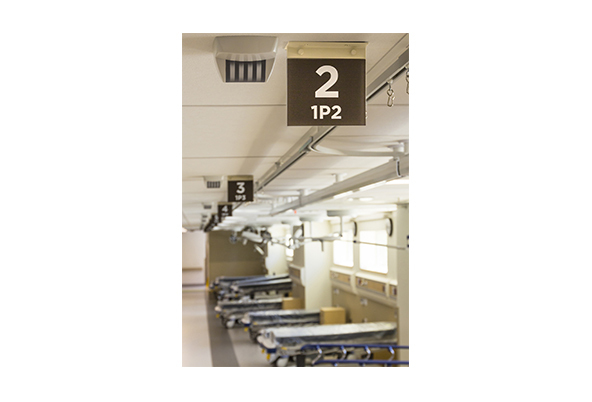 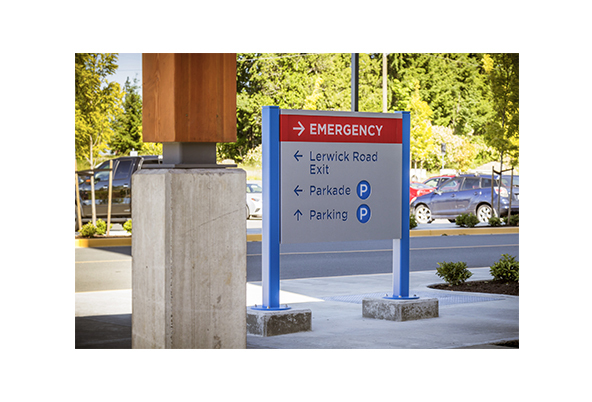 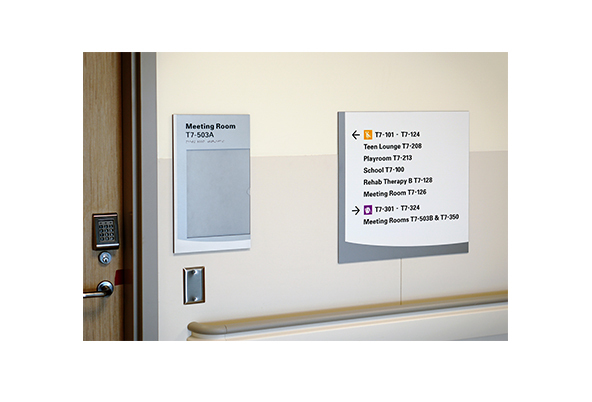 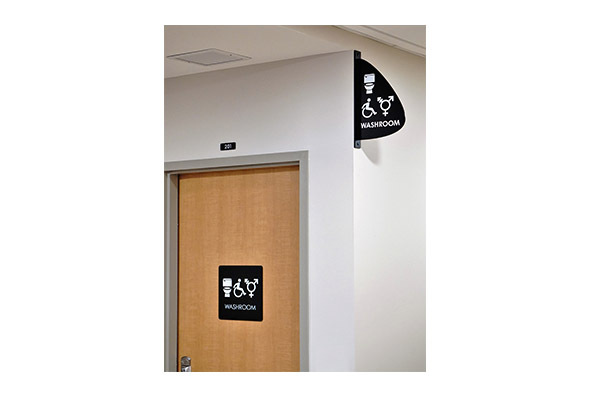 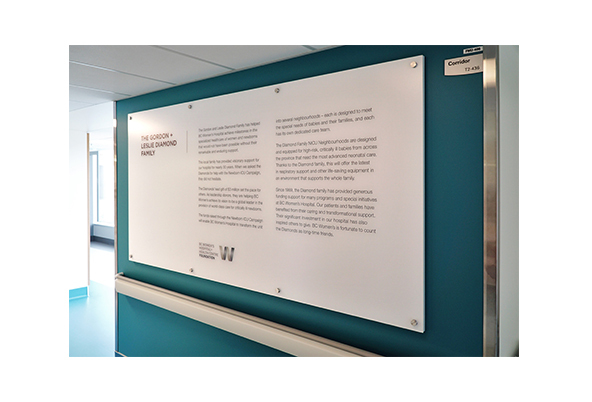 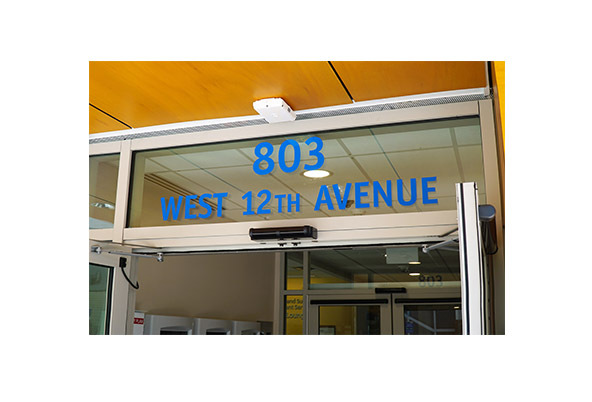 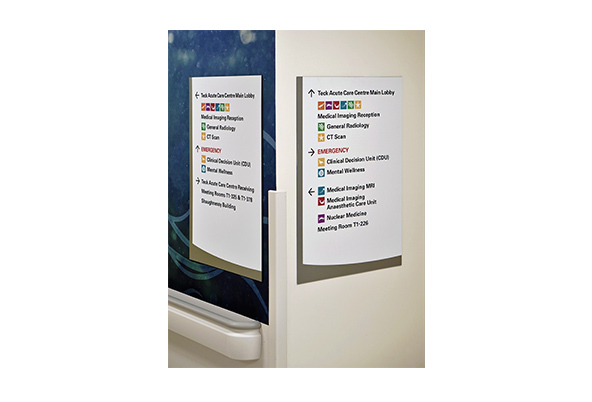 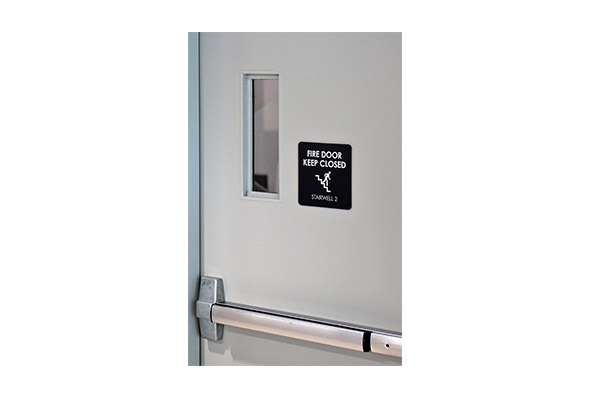 EEC has established itself as a leader in the industry of providing institutional signage for large-scale hospital and care facility projects. 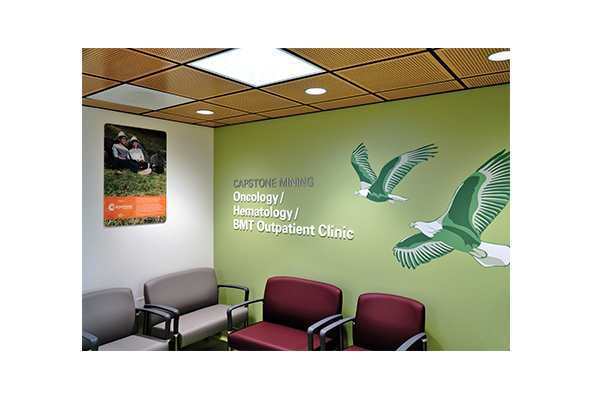 These two hospitals were no exception as EEC provided interior and exterior signage for the entire project. 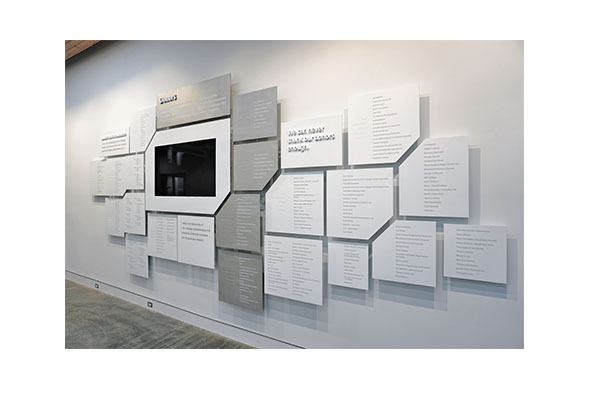 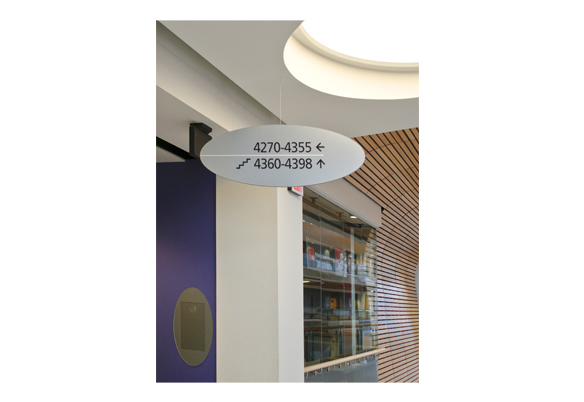 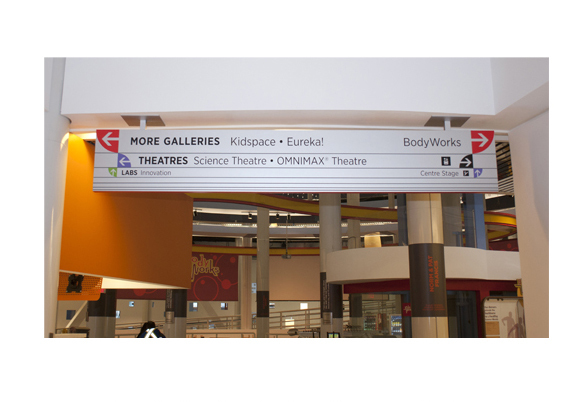 A unique aspect of this project was the incorporation of aboriginal text into then wayfinding signage program. 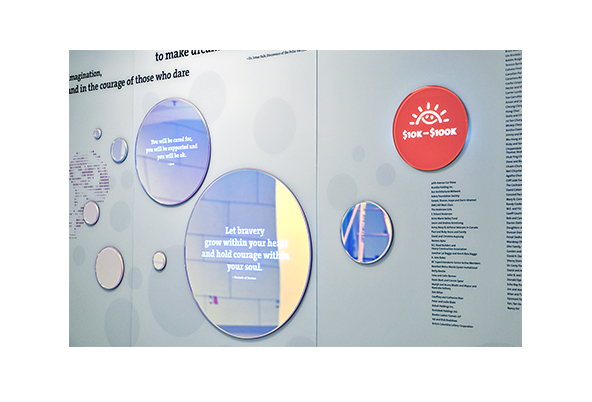 The ECUAD project was designed to celebrate creativity of the human spirit in all its forms and expressions. 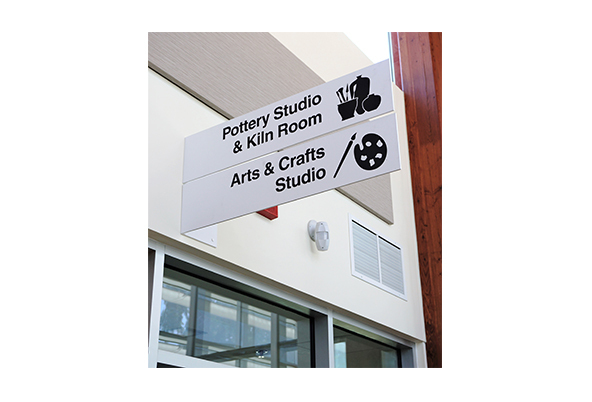 This is a first of it’s kind, being the first purpose built institution of art + design in Canada. 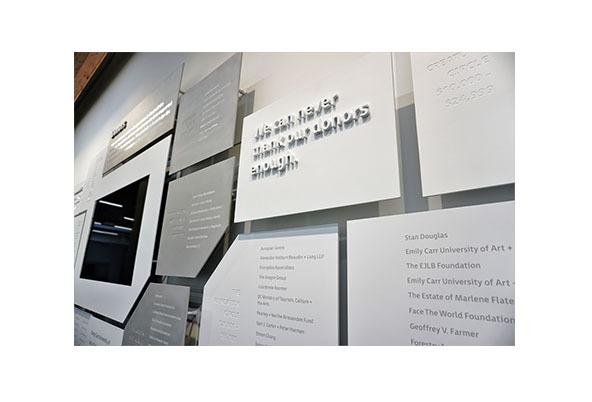 EEC provided both interior and exterior signage for this project including wayfinding, digital donor wall, and illuminated identification signs. 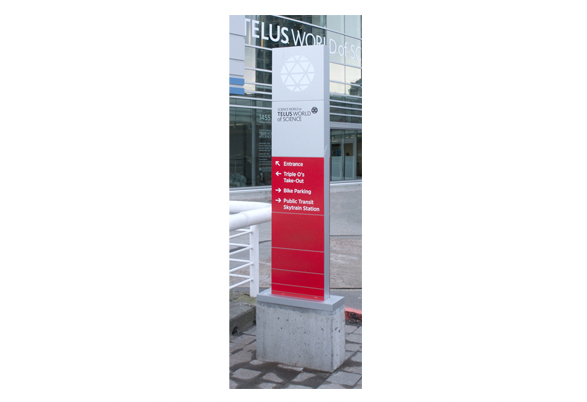 The world renowned Telus World of Science in Vancouver underwent a major renovation in 2011. 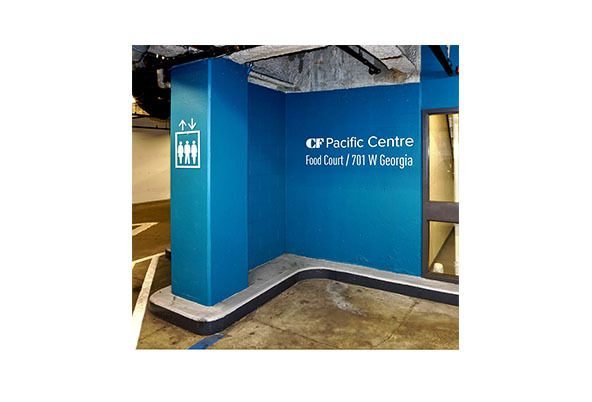 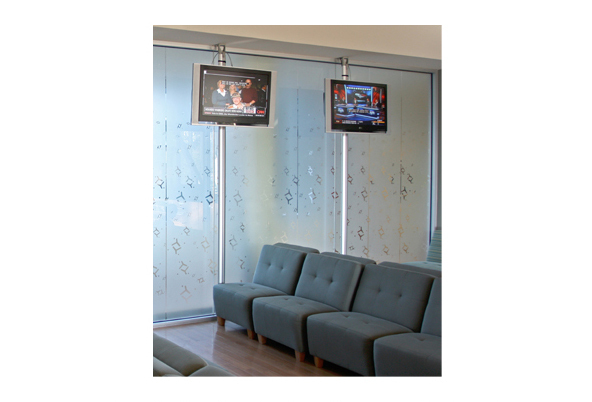 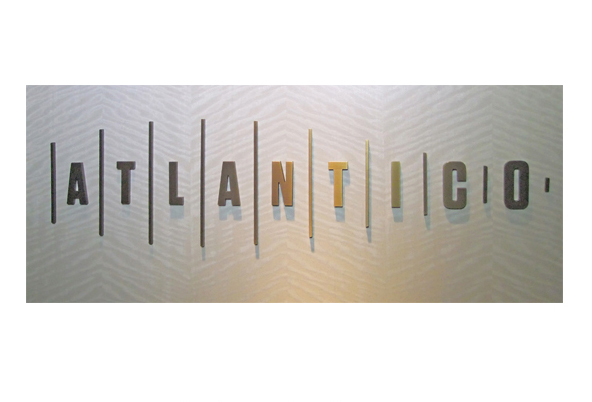 EEC Industries was there to provide all the custom interior and exterior signs for the project. 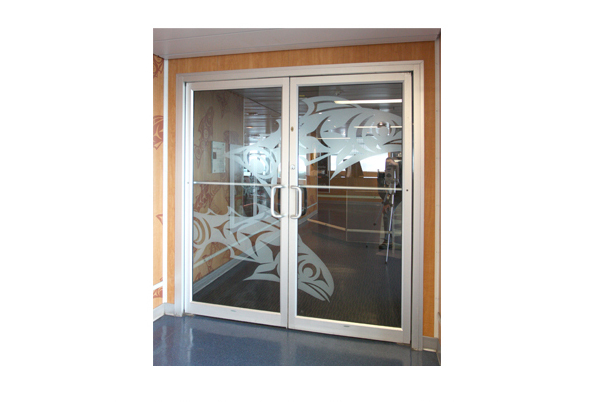 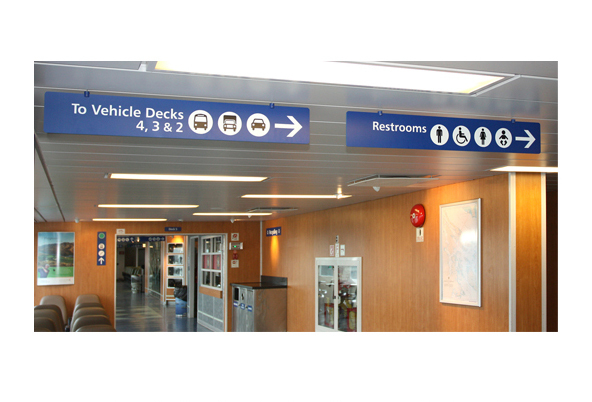 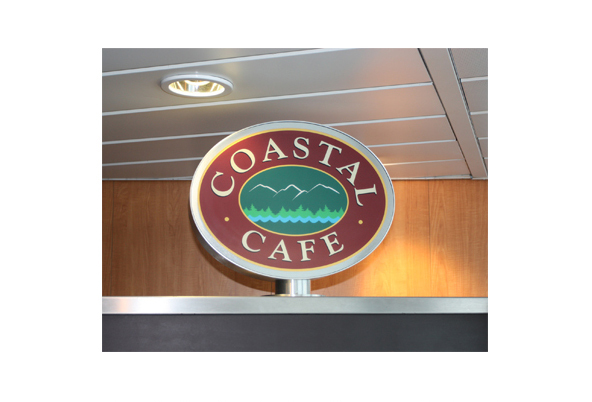 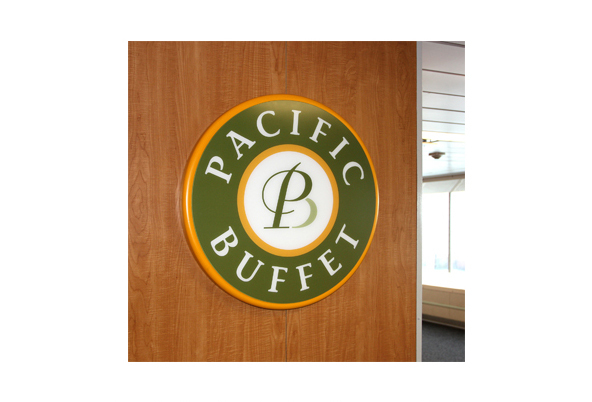 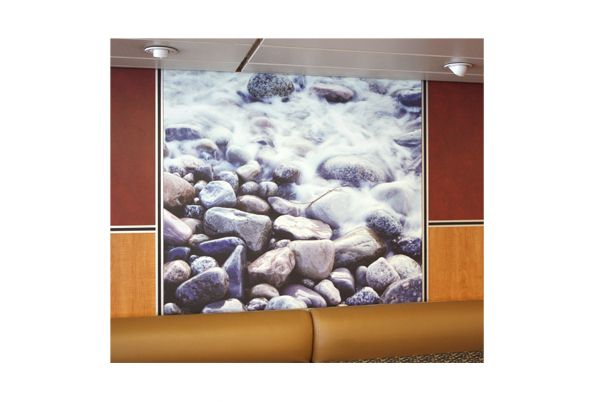 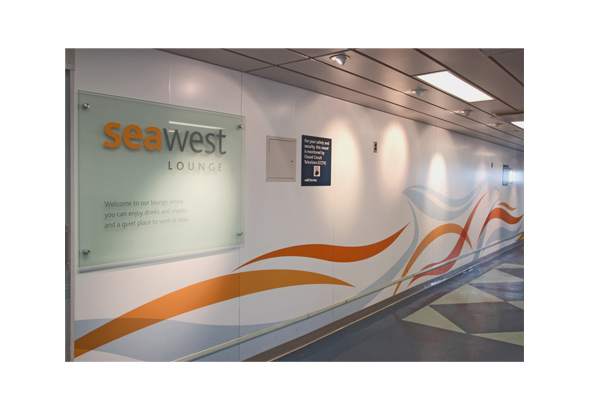 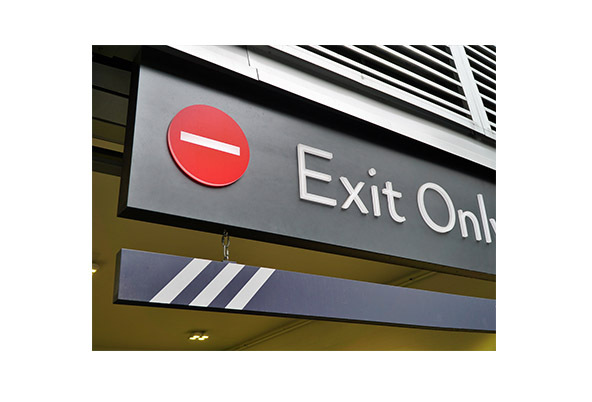 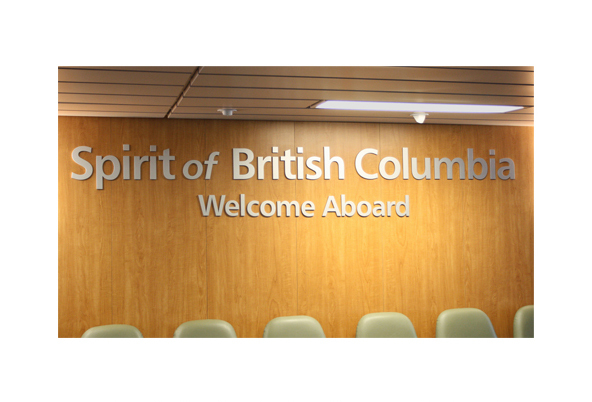 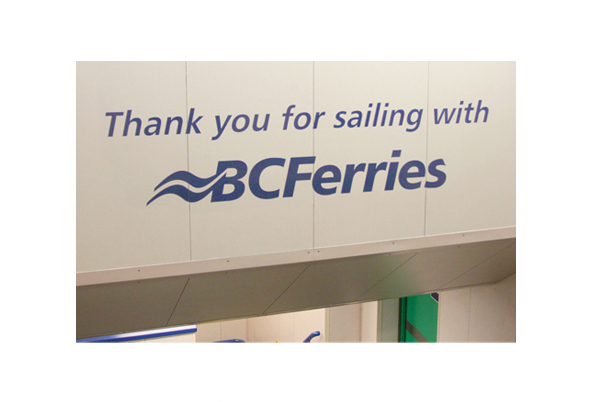 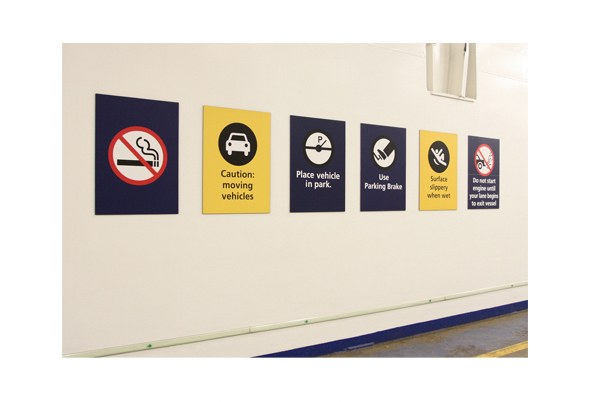 The British Columbia Ferry Corporation sourced EEC Industries as their custom sign supplier of choice during a fleet-wide retrofit of all their passenger/vehicle ferries. 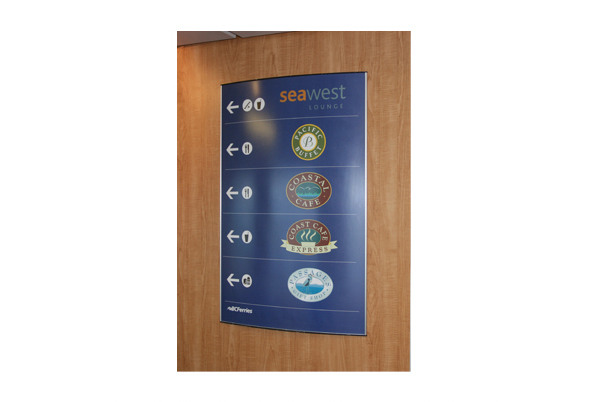 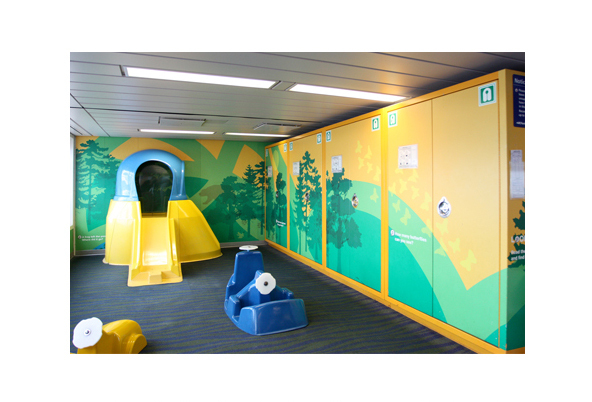 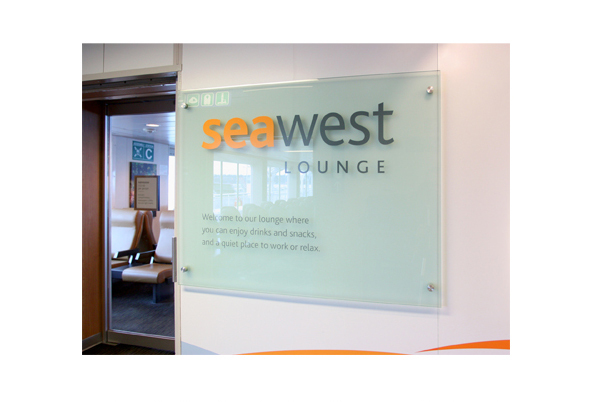 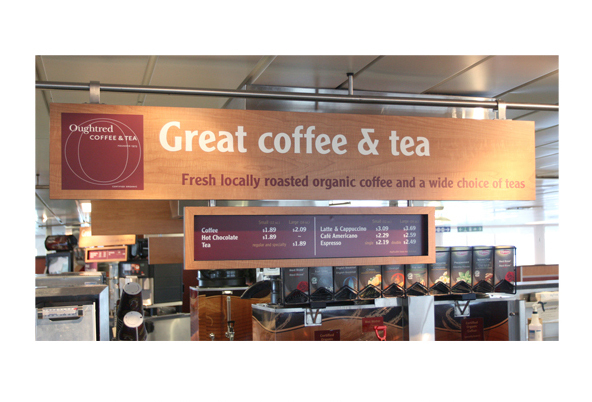 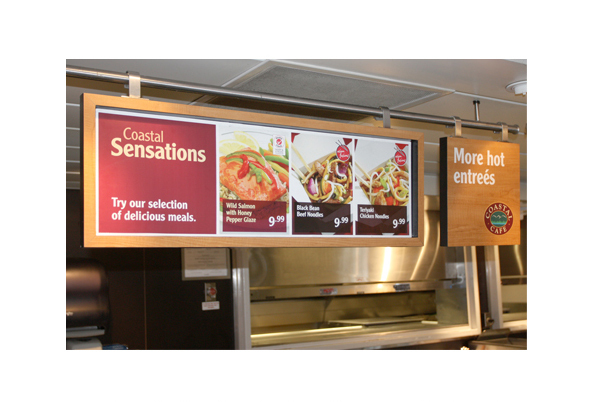 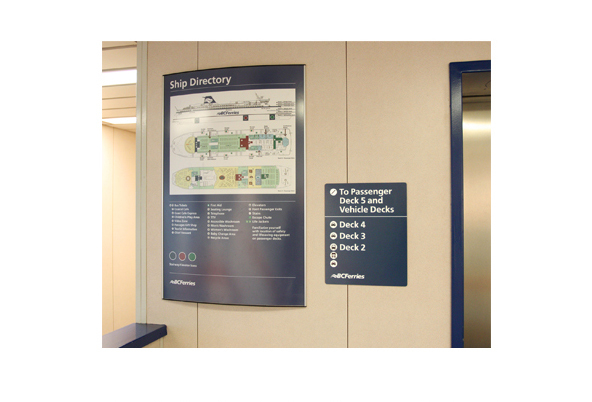 We manufactured and installed all wayfinding and digital signage for over ten vessels. 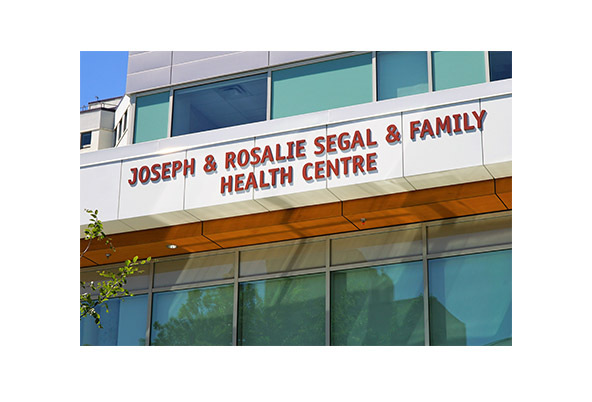 With Joseph & Rosalie Segal being two of the most prominent Philanthropists in the country, EEC are proud to be apart of the new mental heath and addictions facility at Vancouver General Hospital. 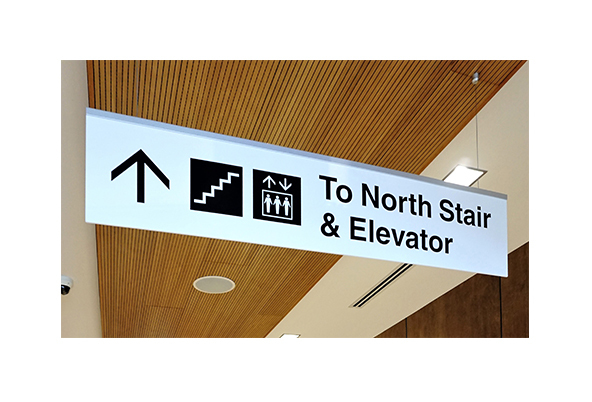 Sleek, simple, and modern signage was provided for this project. 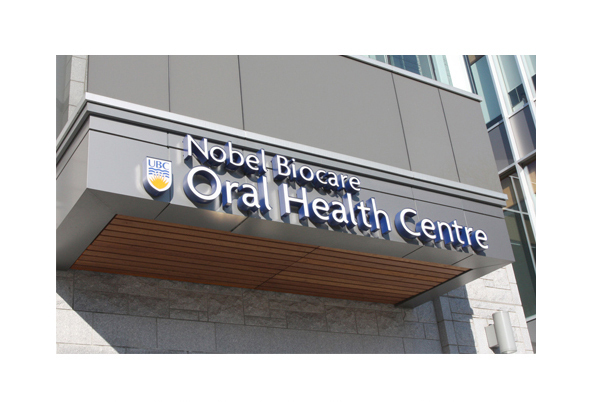 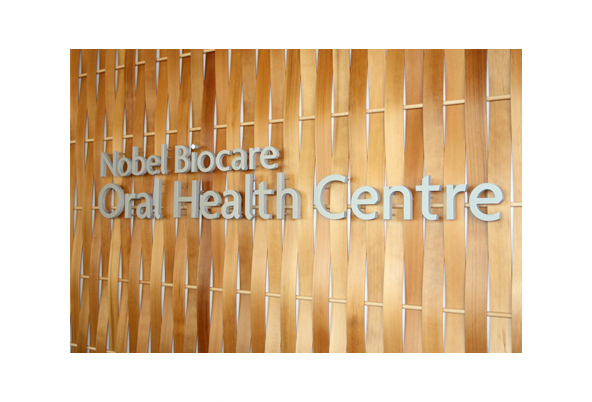 Oral Health Centre is a teaching facility located at the main campus at the University of British Columbia. 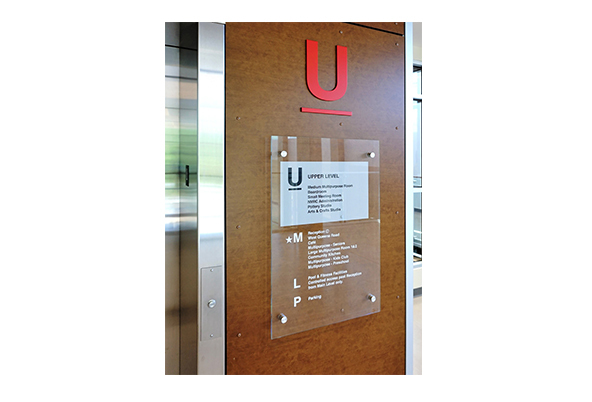 EEC Industries manufactured and installed a complete set of custom interior and exterior signs for the university, including wayfinding and donor recognition signs. 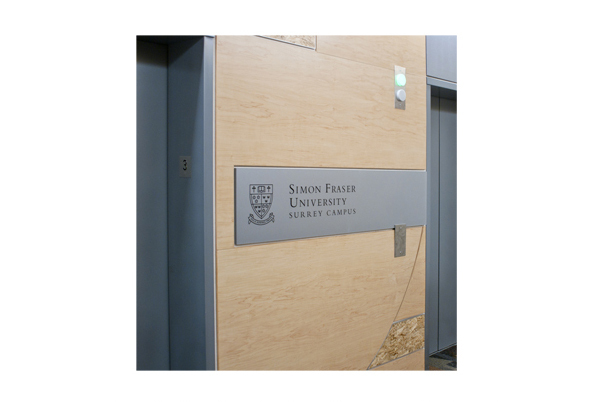 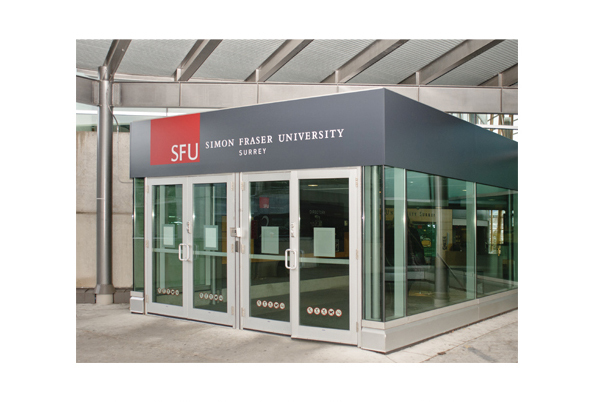 The Simon Fraser University, Surrey Campus, is a dynamic and growing centre for higher education. 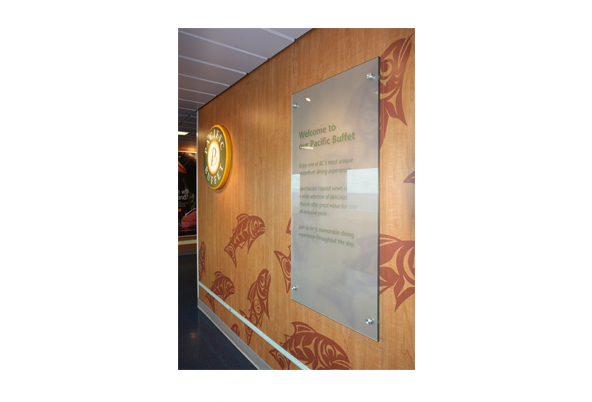 Chief concerns during the project were sensitivity to durability, eco-friendly materials and production techniques. 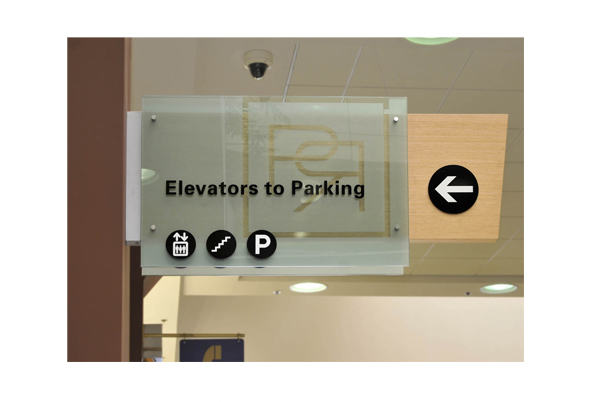 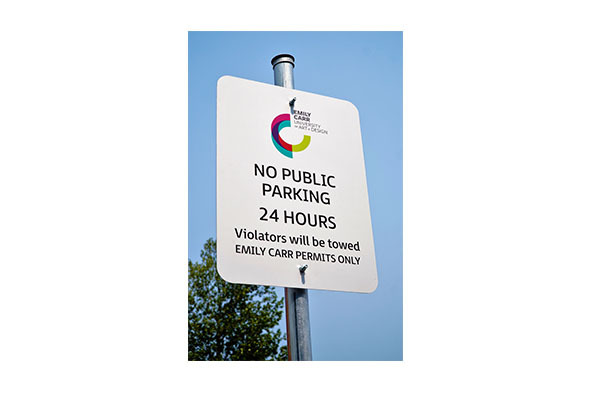 The project benefited from a production team that coordinated each small aspect of the sign program. 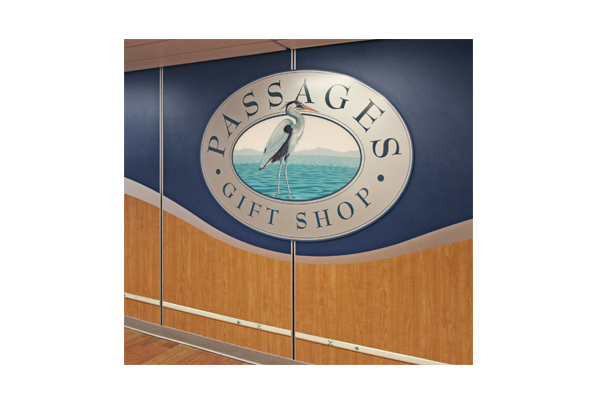 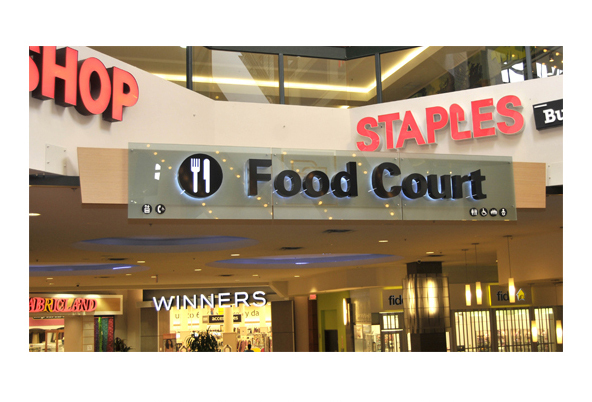 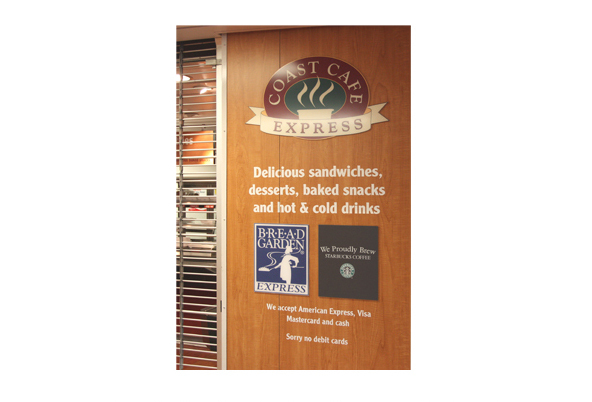 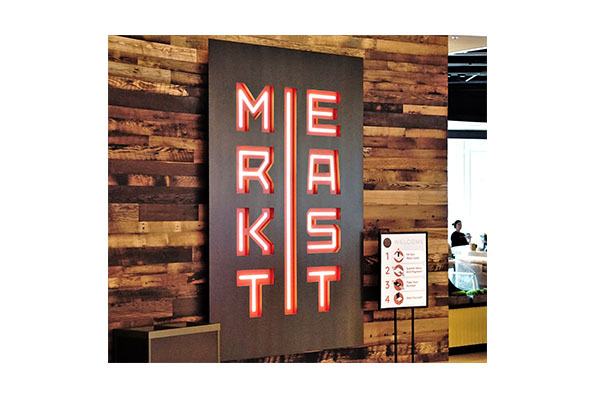 Clients consistently turn to EEC for best-in-class custom sign manufacturing for retail environments and speciality projects. 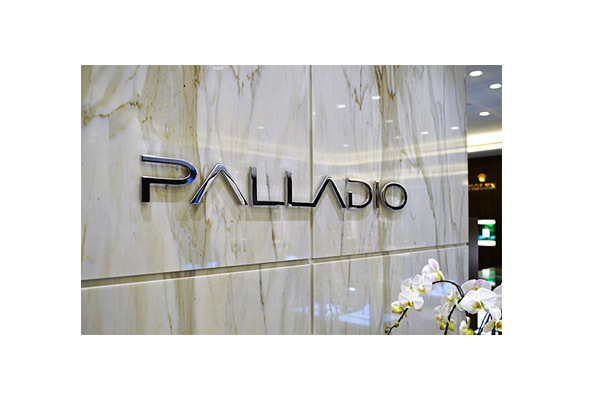 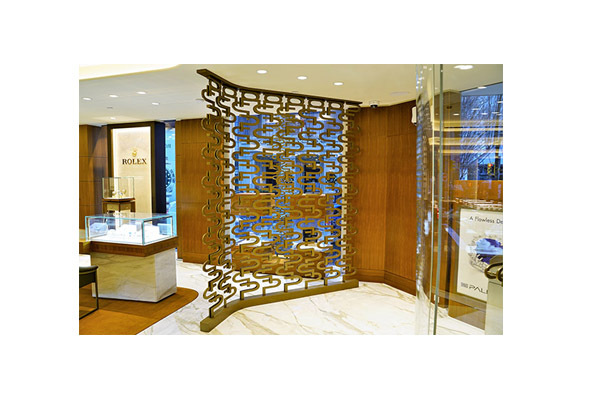 EEC Industries designed, fabricated, and installed the signs for Palladio Jewellers. 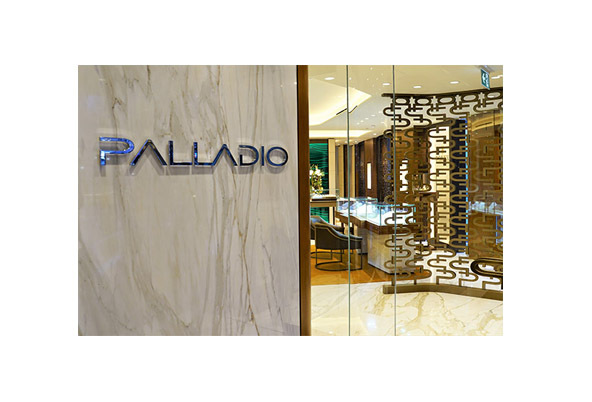 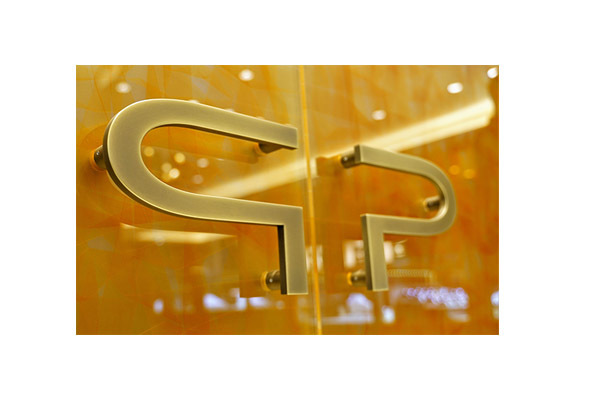 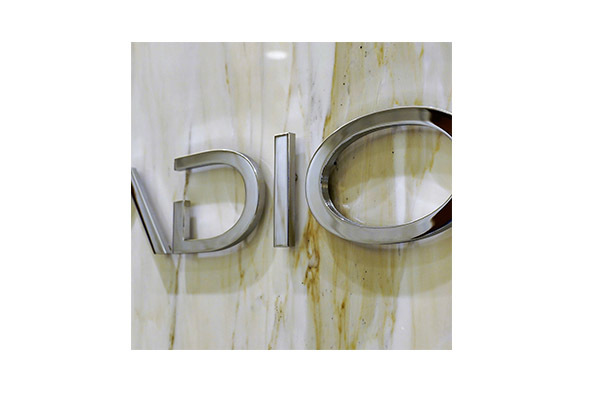 Using their brand symbol we developed a custom design that would encompass the grace the store exudes within Vancouver while still incorporating that hand-crafted quality that Palladio boasts to its own customers. 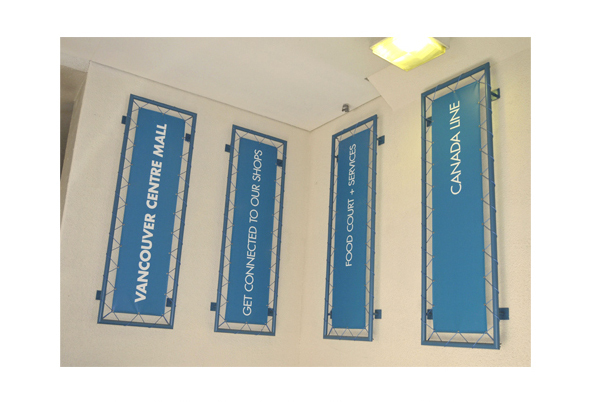 Metropolis at Metrotown, is one of the largest retail centres in Canada. 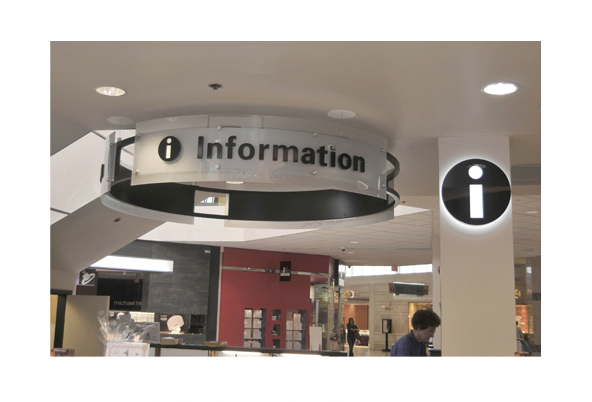 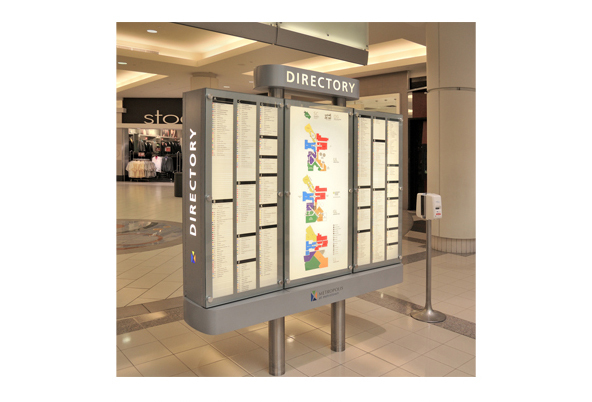 In collaboration with Karo Design, we engineered, manufactured and installed a wayfinding signage system that included illuminated signs, directories, directional signs, and retail advertising kiosks. 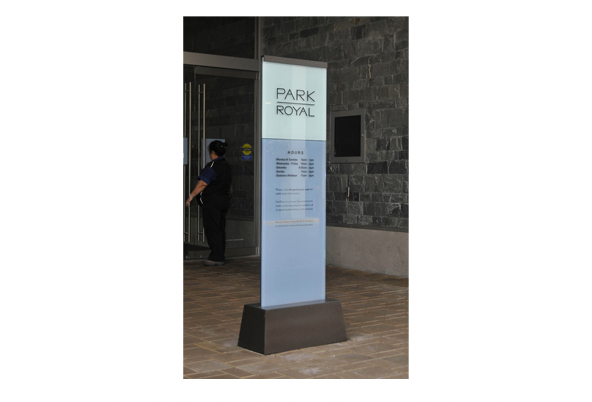 Interior wayfinding signage and illuminated signs for Park Royal are manufactured with materials that complement the newly renovated public areas of the centre. 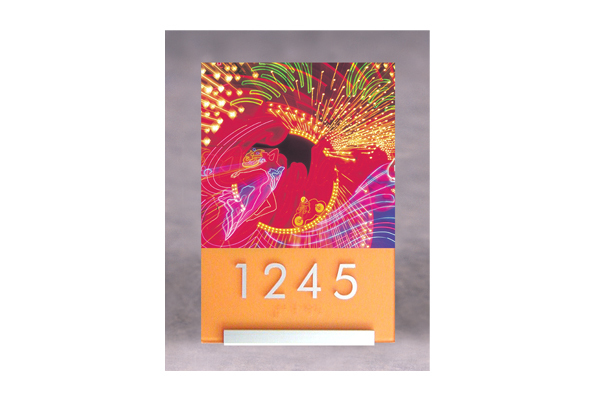 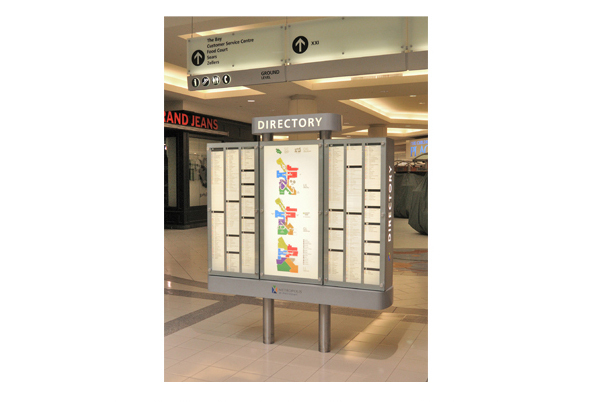 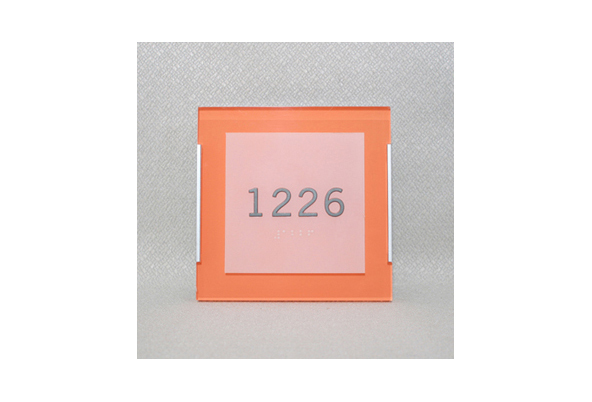 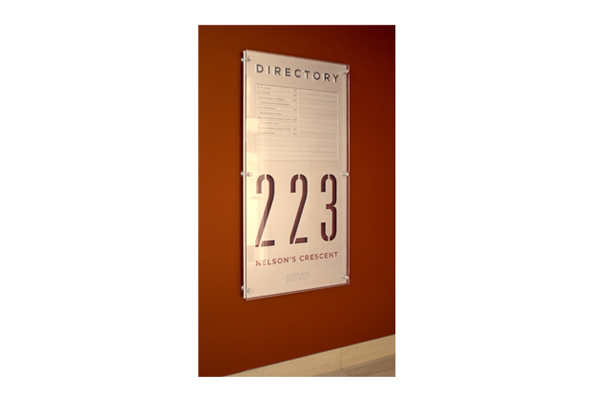 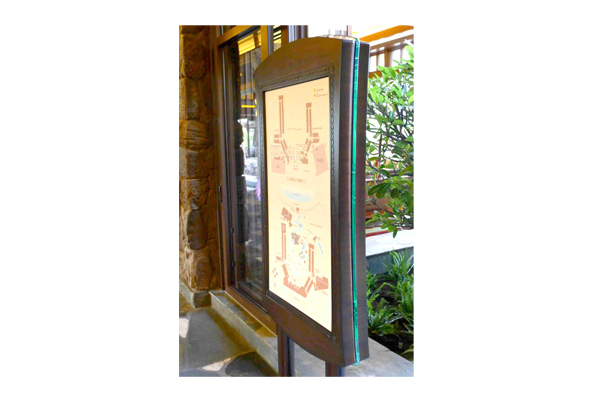 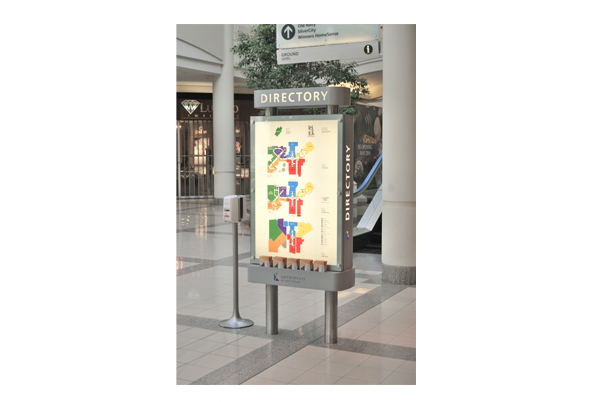 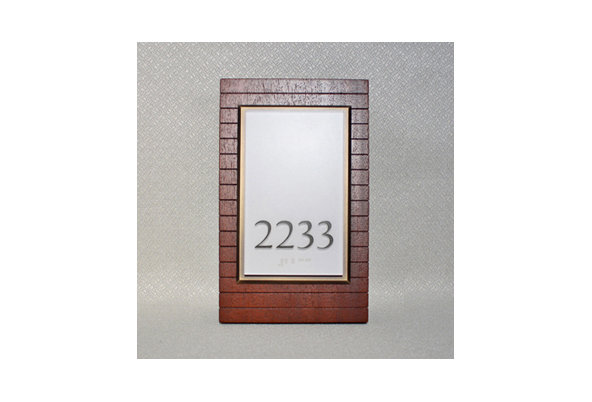 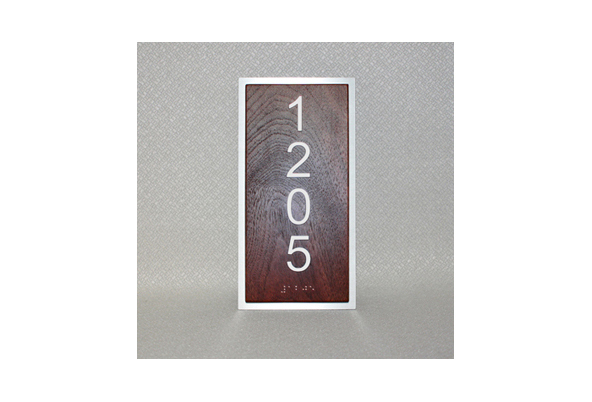 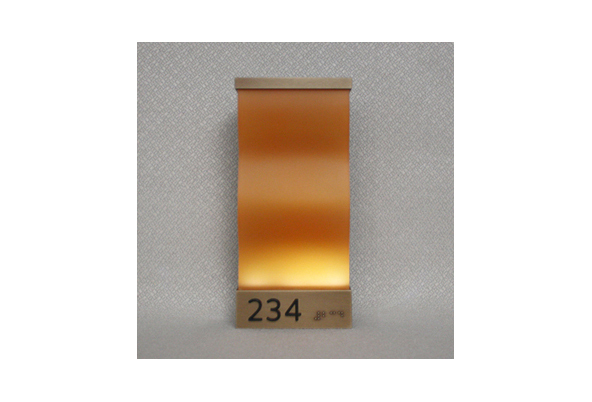 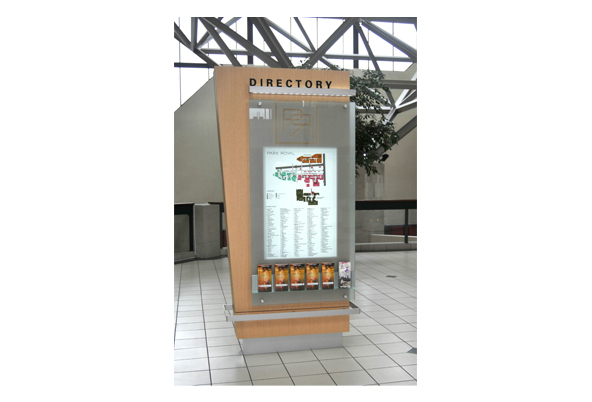 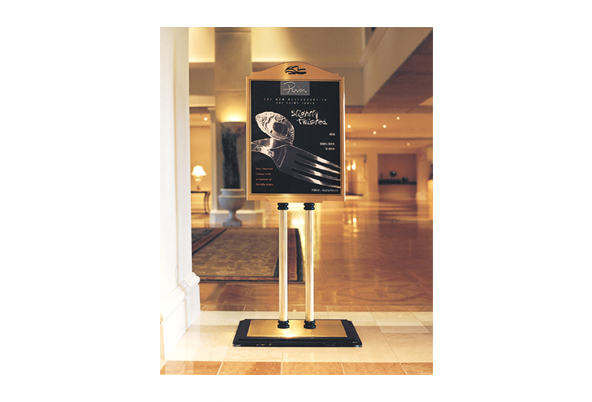 The directories are designed to accommodate electronic LED sign displays at a future date. 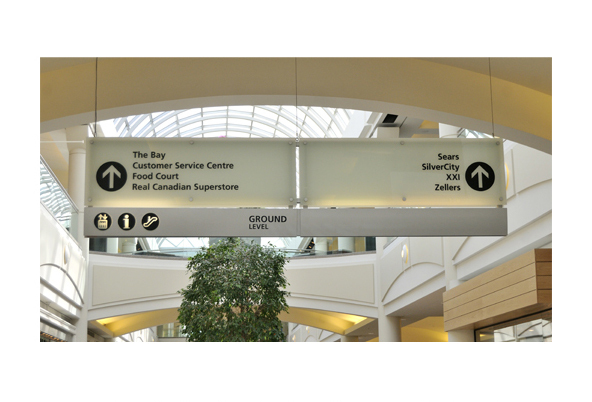 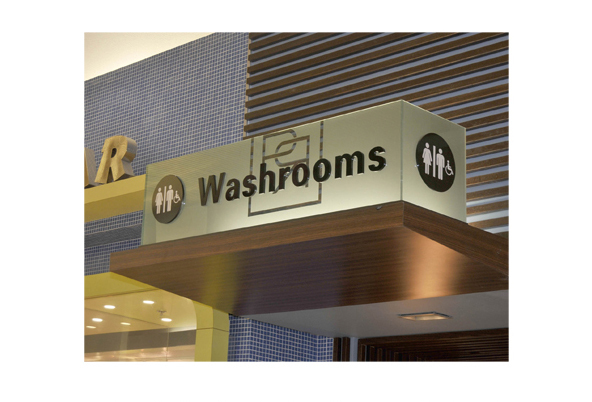 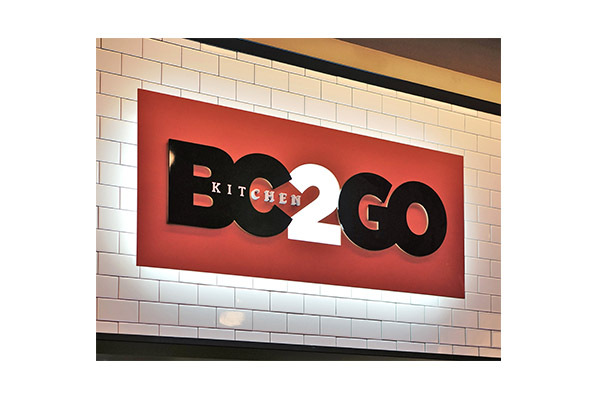 We provided custom manufactured wayfinding signage and illuminated signs for this underground convenience mall to help move office personnel and travellers alike to their destinations. 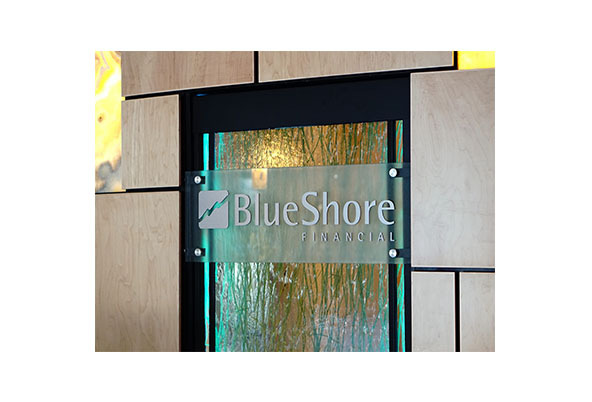 The stainless steel and blue tint glass finishes complement the interior finishes perfectly.